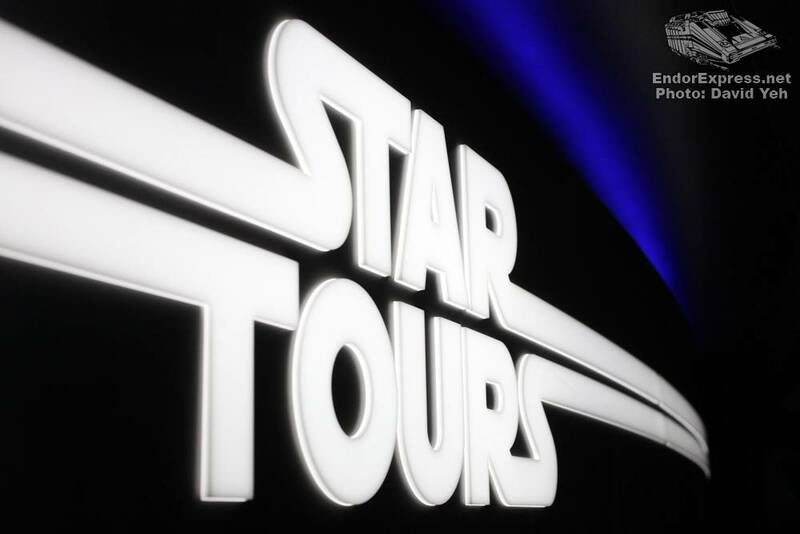 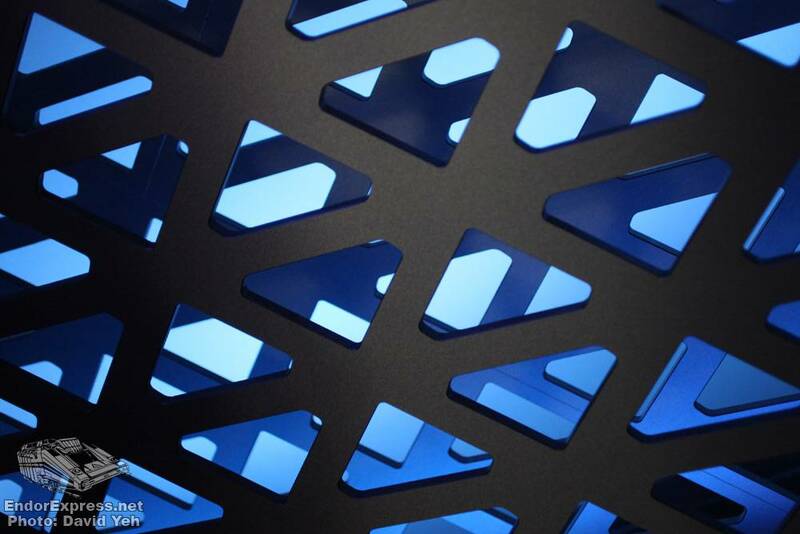 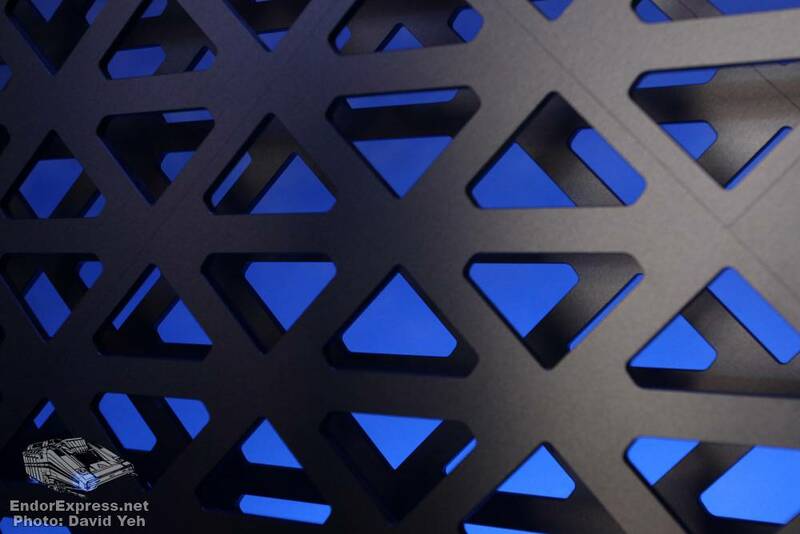 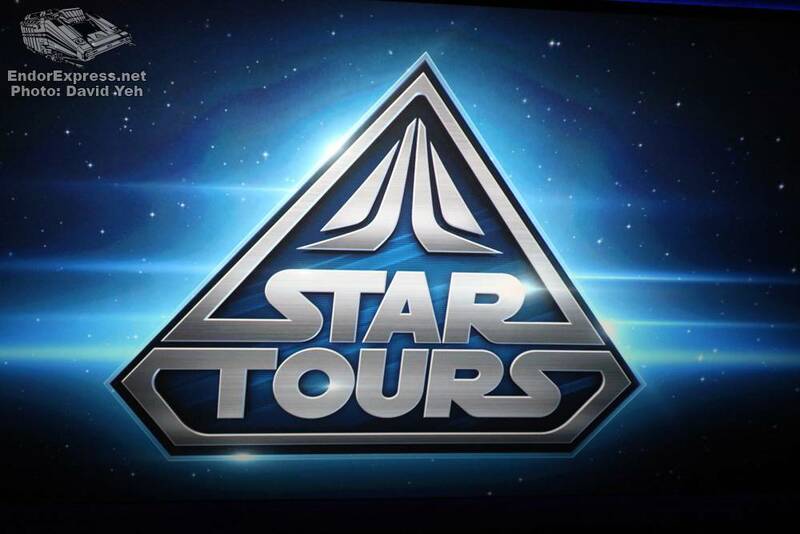 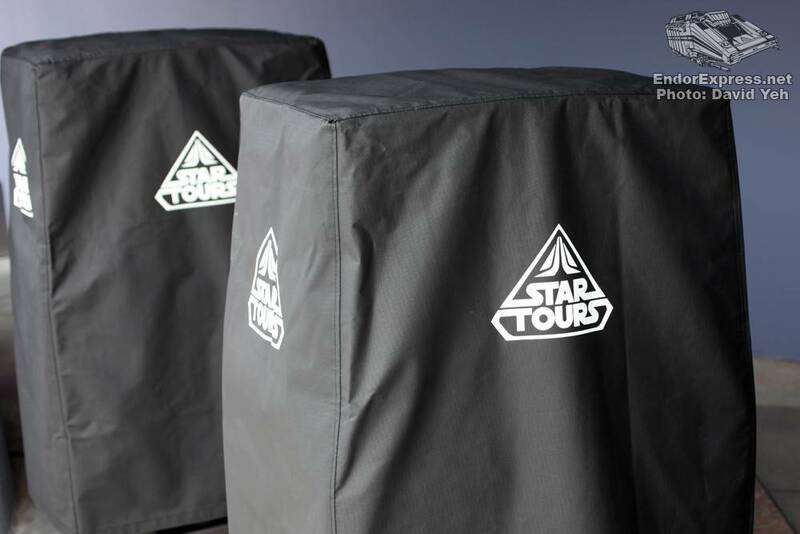 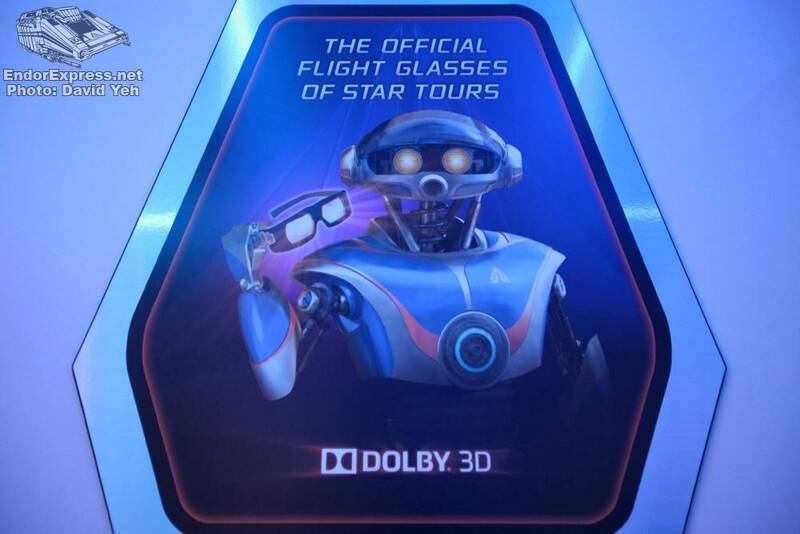 This will be a year long remembered: 2011, the year that Disney and Lucasfilm deliver the goods of what is now dubbed STAR TOURS: THE ADVENTURES CONTINUE. 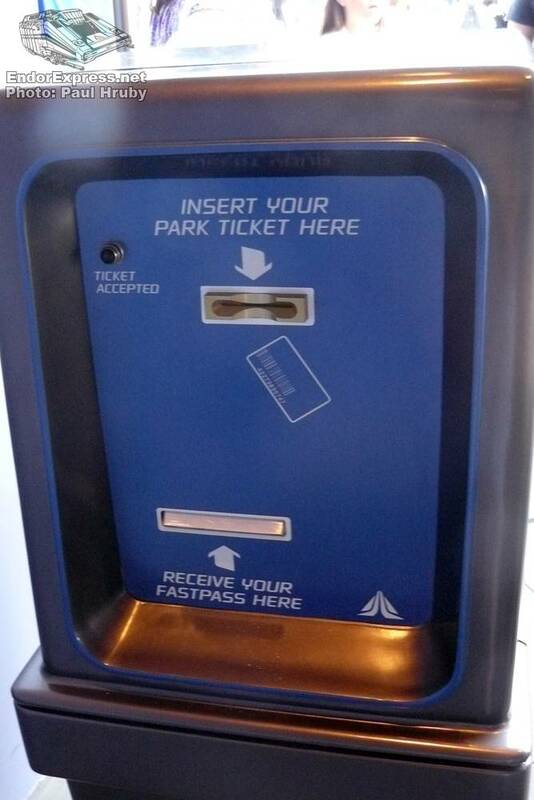 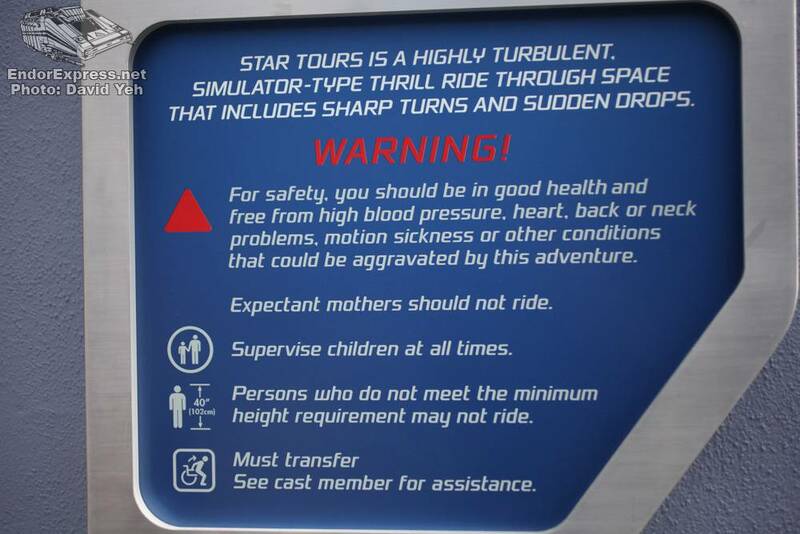 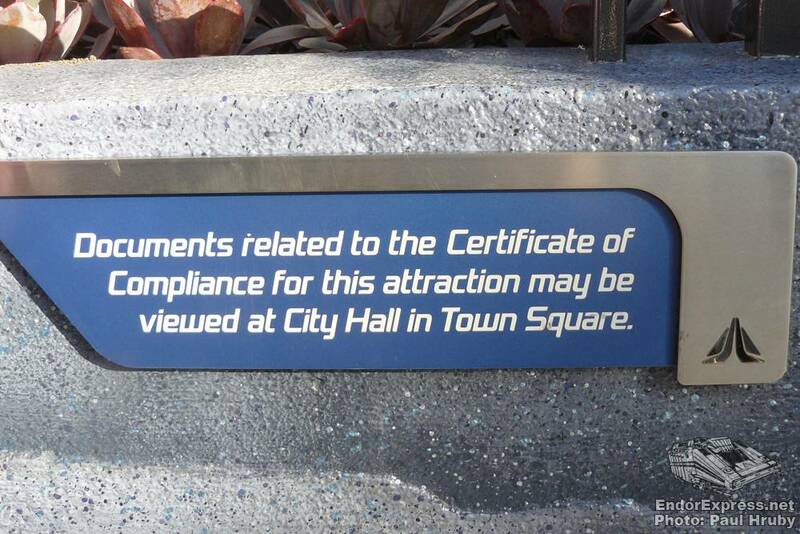 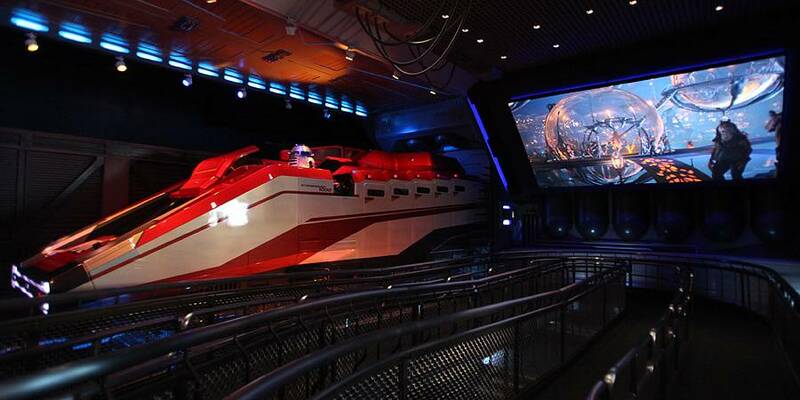 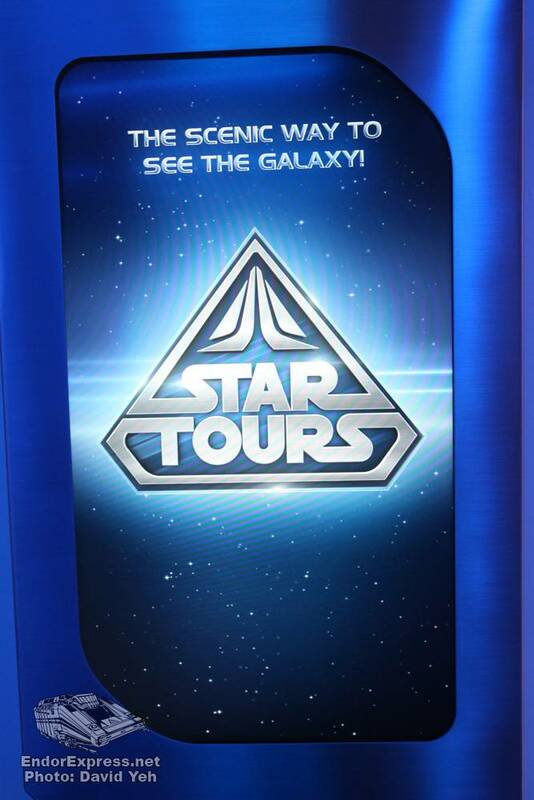 To everyone else, it’s just Star Tours. 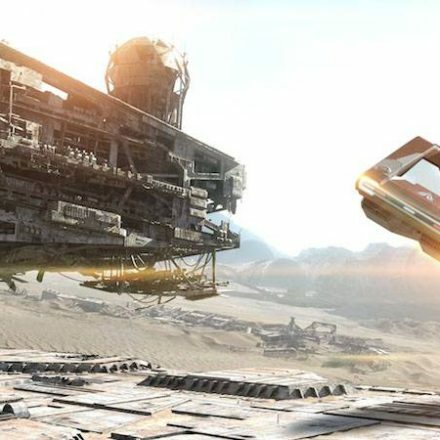 Fans have waited years, even decades for this new attraction after rumblings were leaked that a script for a new adventure involving podracing was complete. 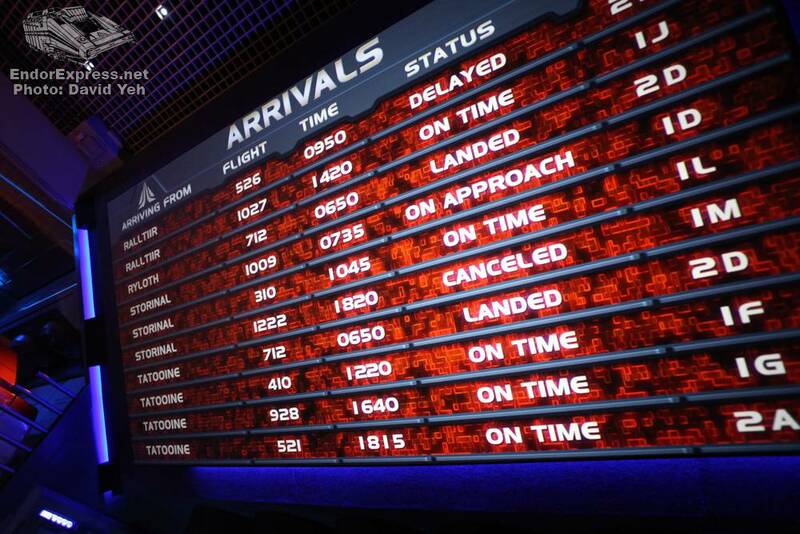 Nobody really knew for sure just how much longer they had to wait but now that the wait is over, it was worth it! 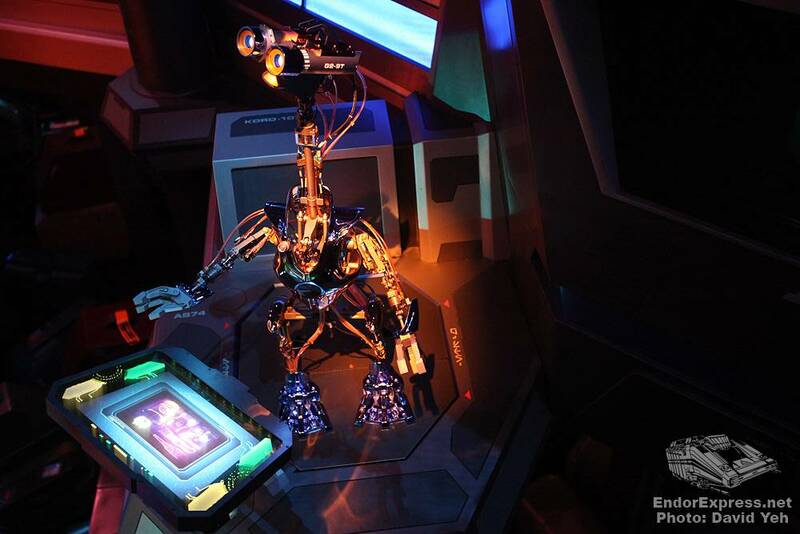 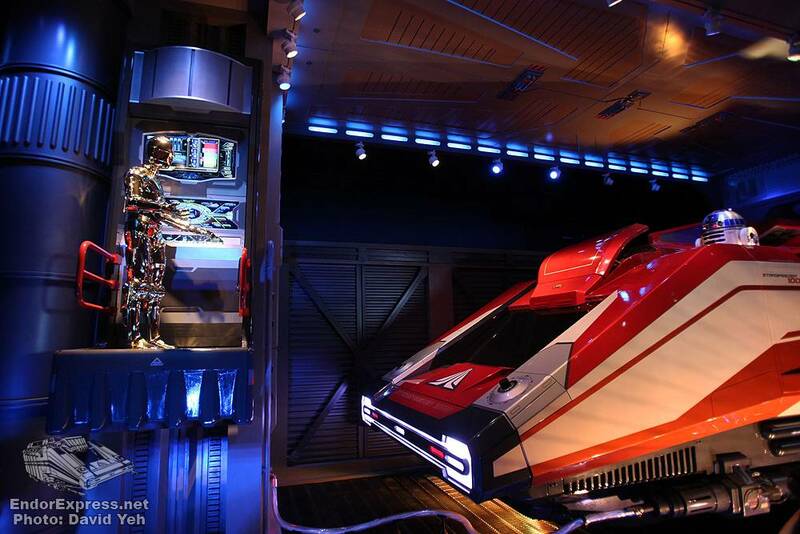 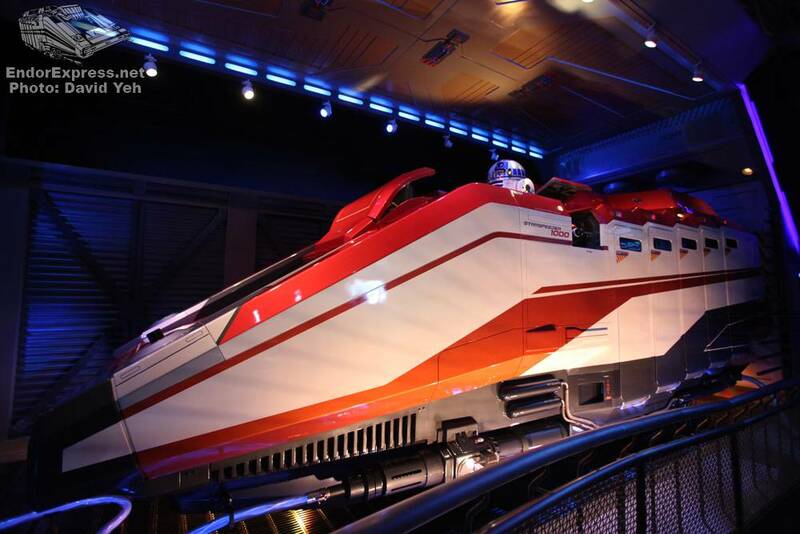 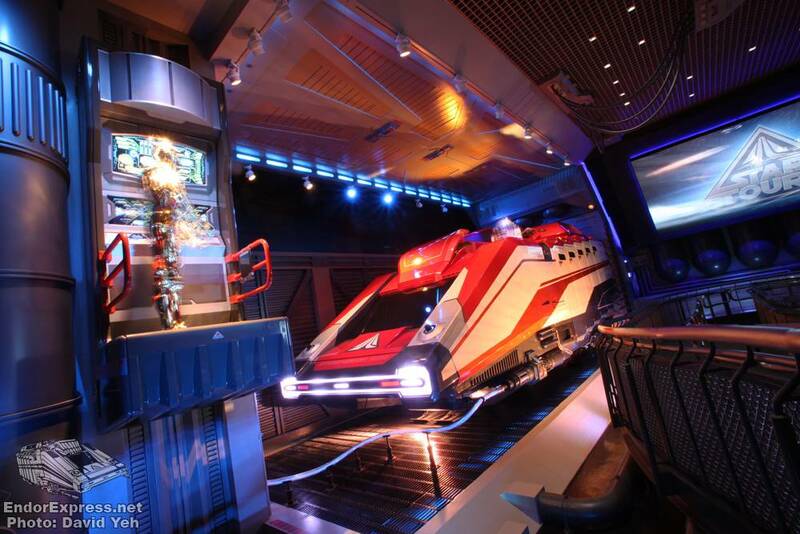 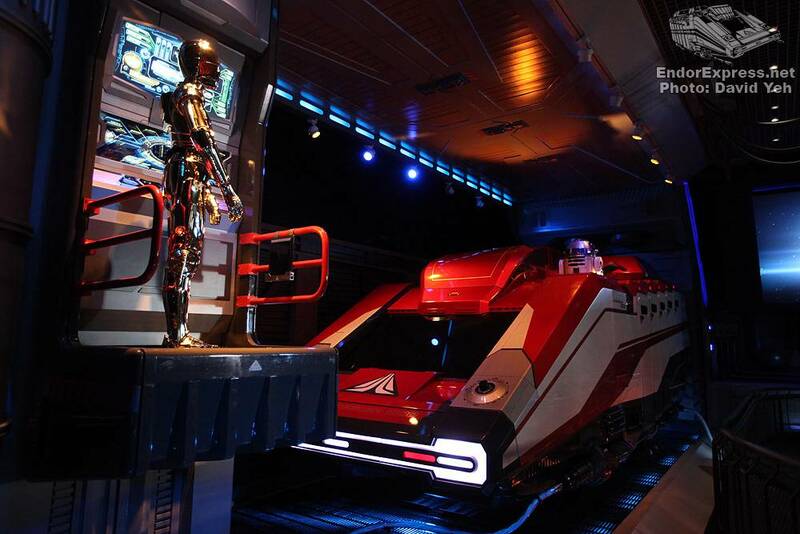 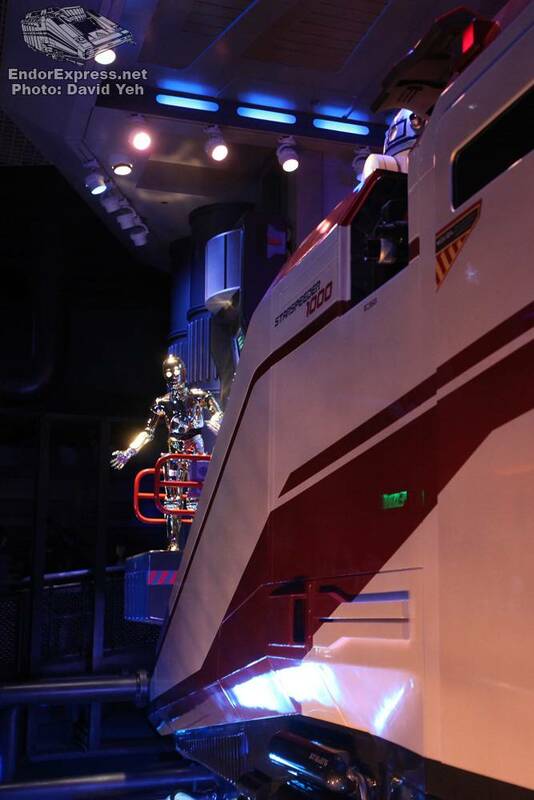 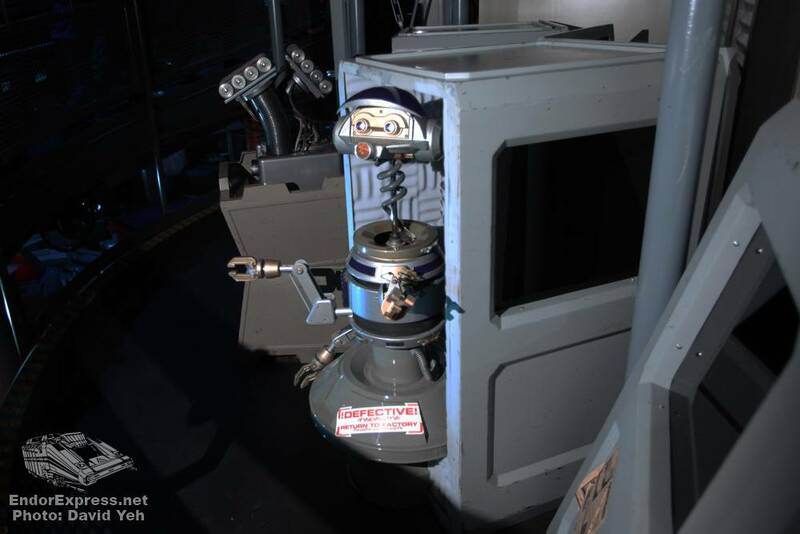 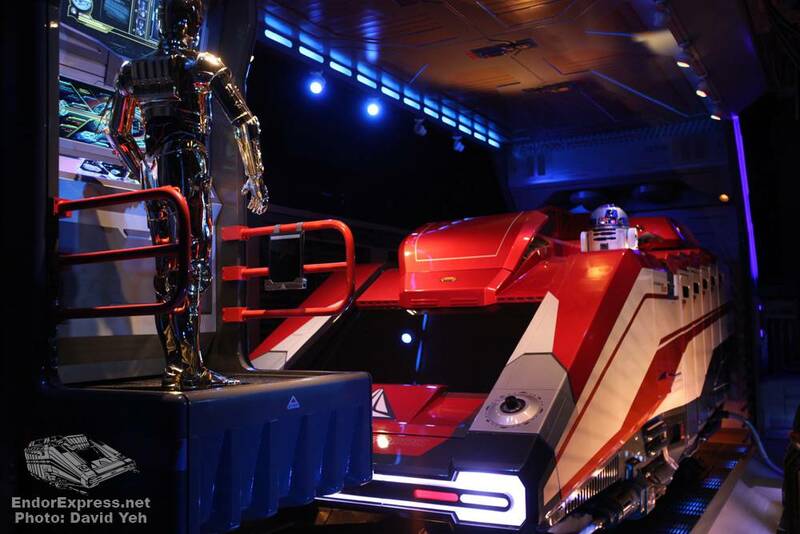 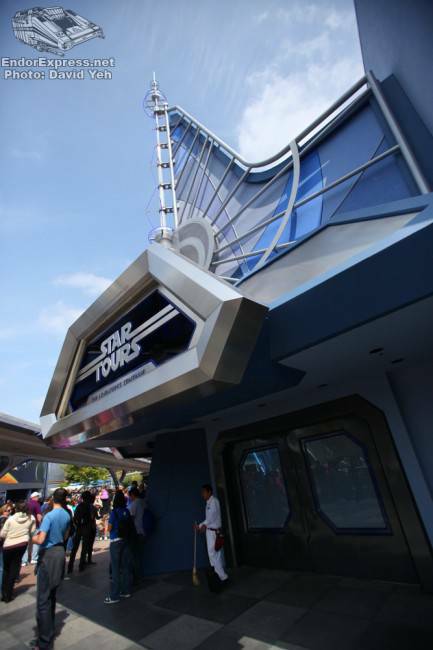 Star Tours officially re-opened at Disney Hollywood Studios May 20, 2011 and re-opens at Disneyland, where it all began, on June 3, 2011. 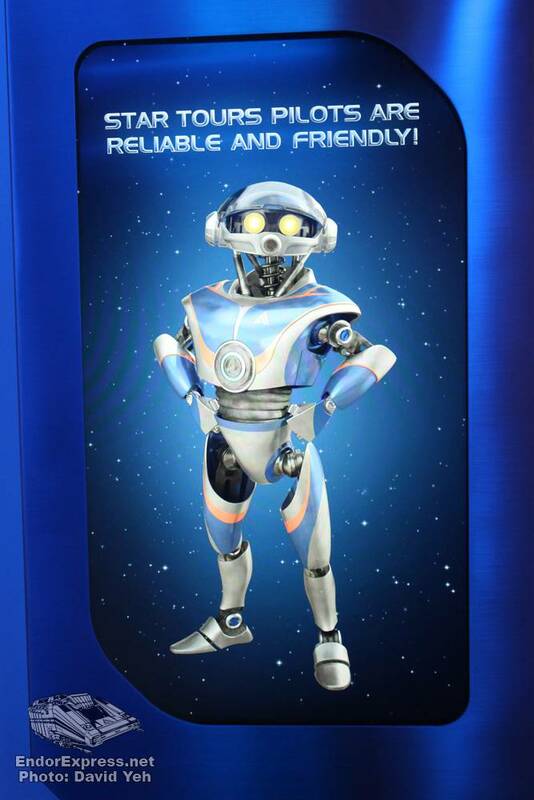 What follows are photos and review of the new attraction so if you want to be kept as pure as possible, now is your chance to look elsewhere. 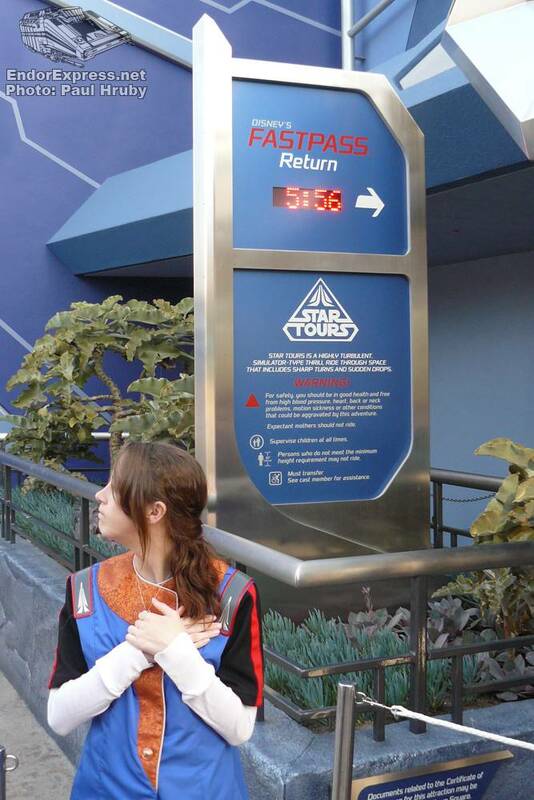 For those high in midichlorian count, the force will guide you further. 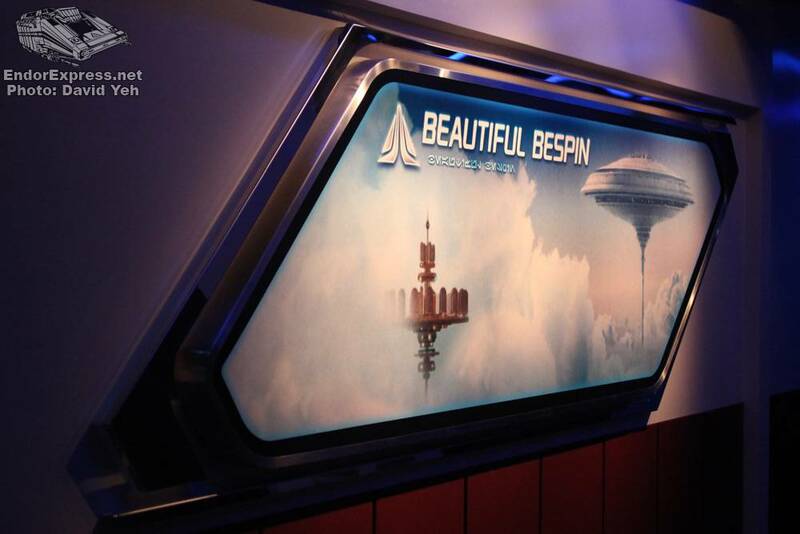 Disneyland’s Tomorrowland location is ideal for an attraction like this as it is a natural setting for a futuristic space port… albeit one long ago in a galaxy far, far away. 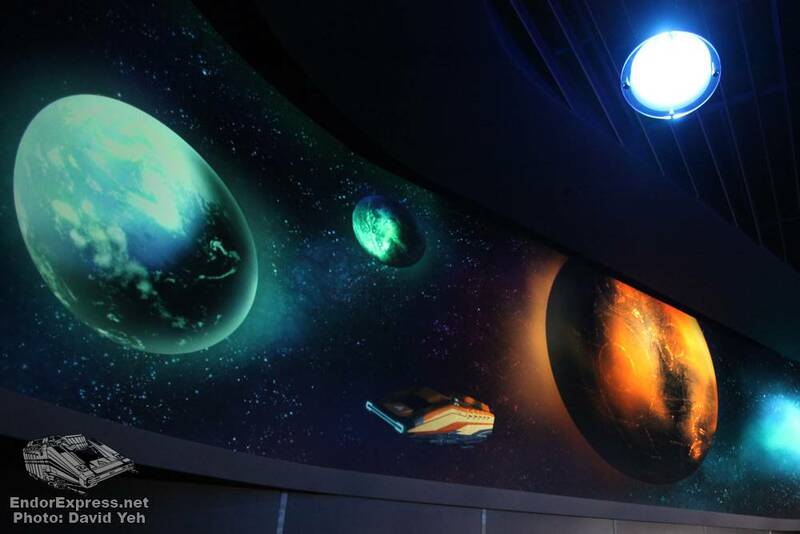 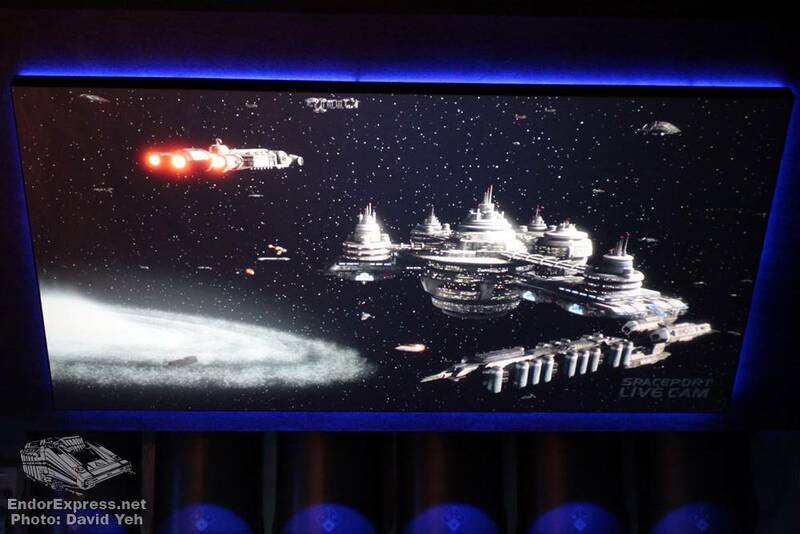 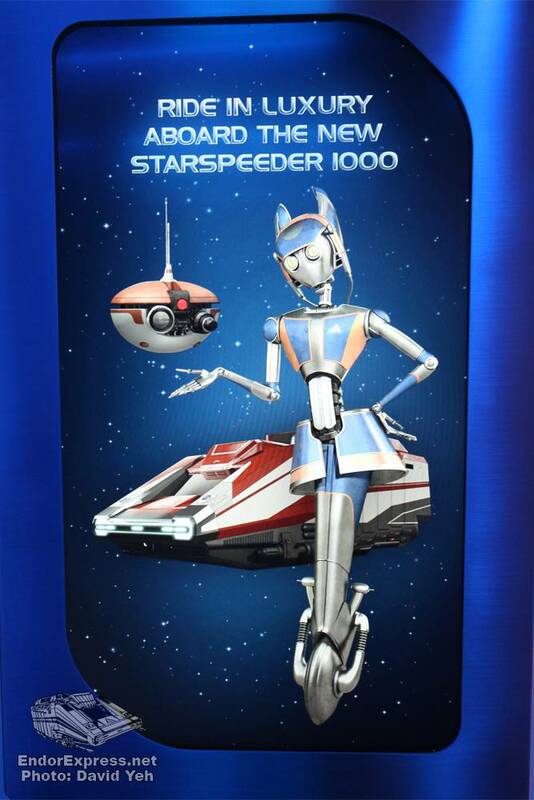 The outer mural that once graced Starspeeder 3000s remains with the updated Starspeeder 1000 colors (Star Tours is now a prequel to the original ride, taking place between Episode III and Episode IV). 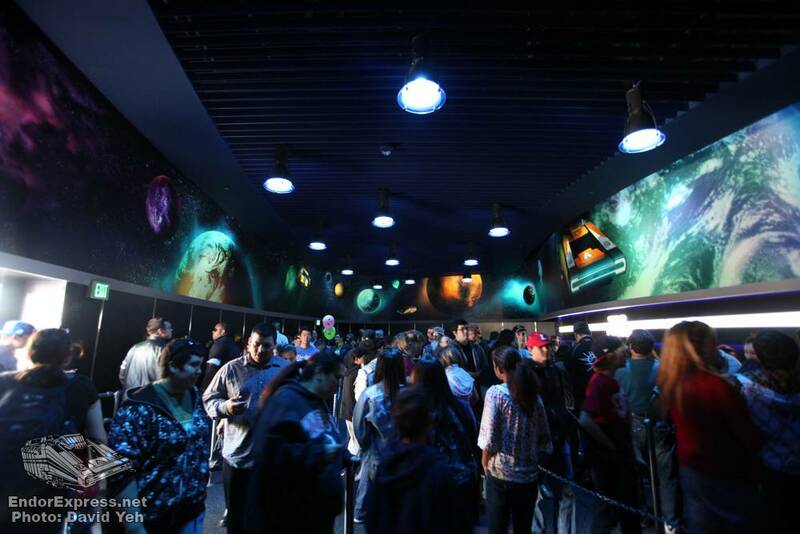 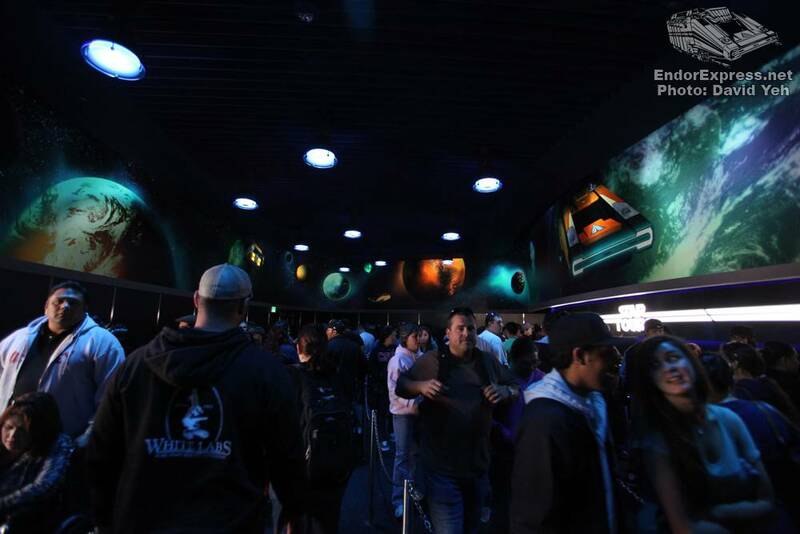 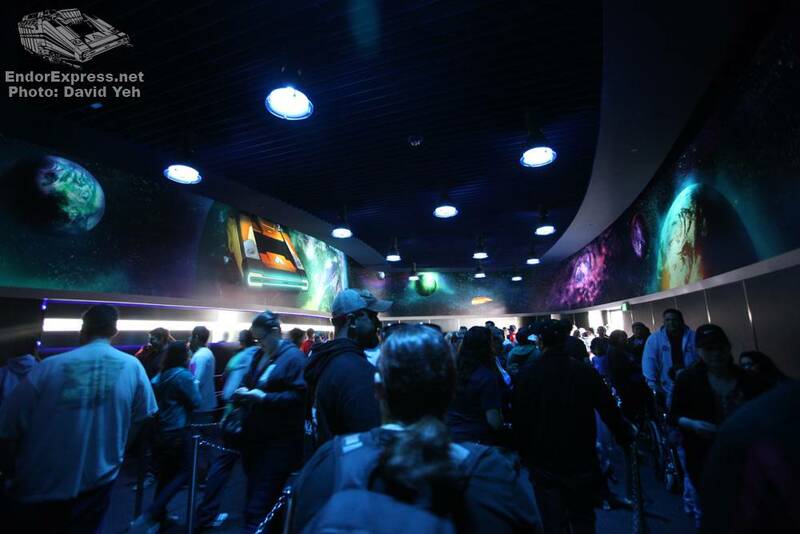 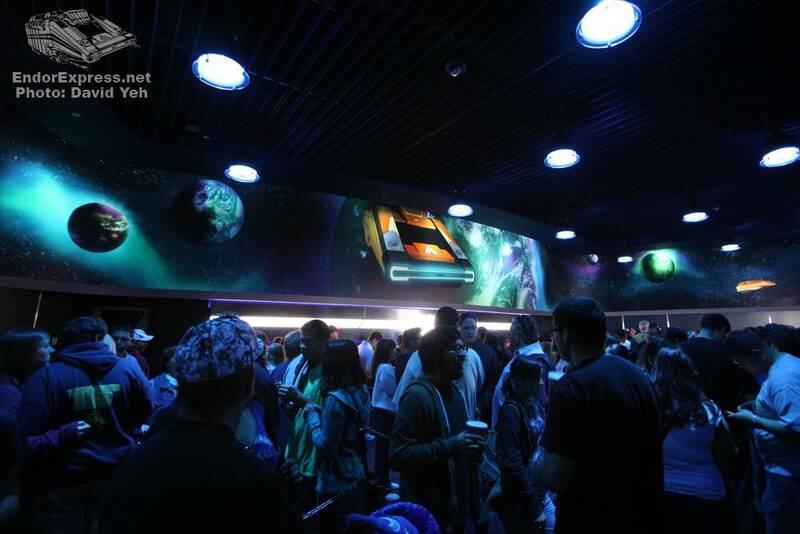 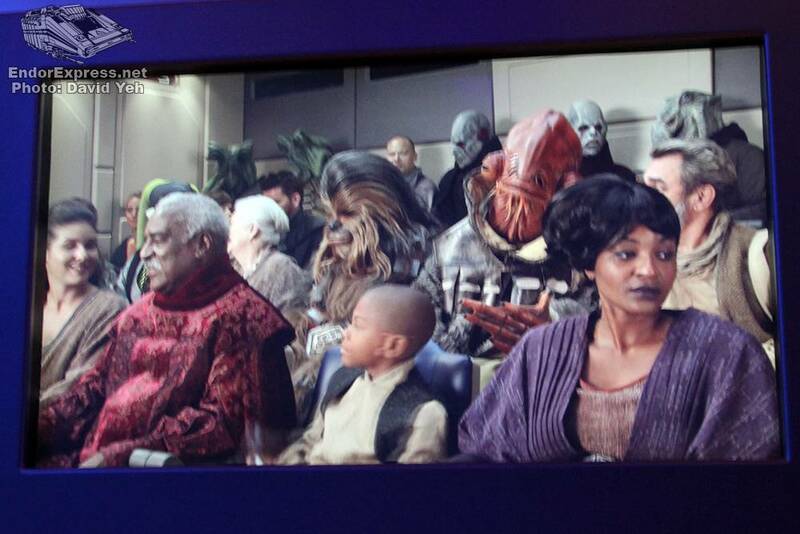 The extended queue that once housed a Mon Calamari officer in a Security Checkpoint has been simplified into a large waiting room with black-lit paintings of far off galaxies and planets, most of which are recognizable for the Star Wars fans. 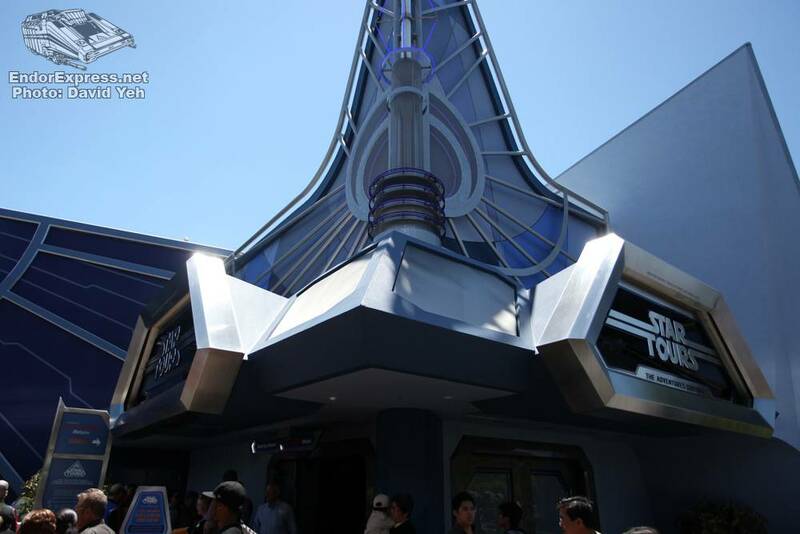 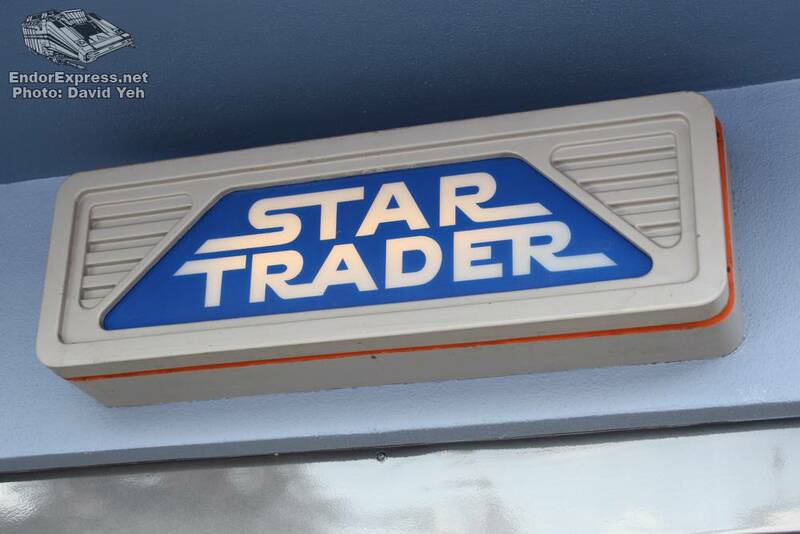 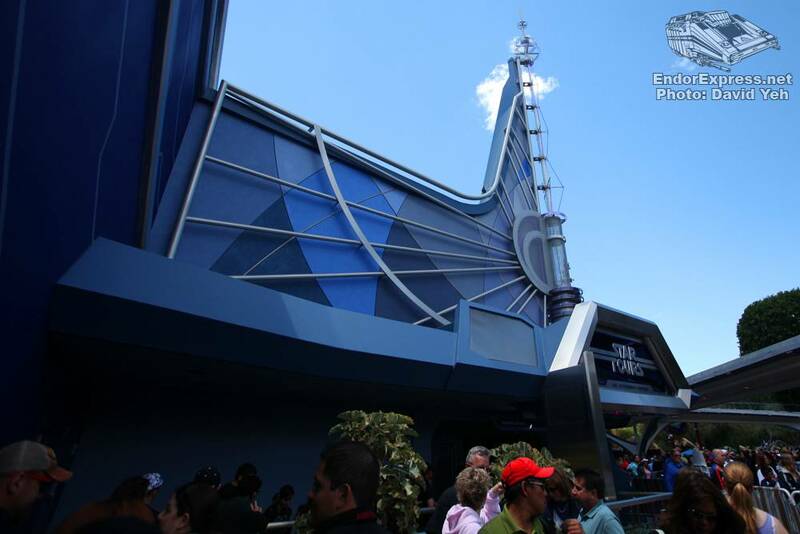 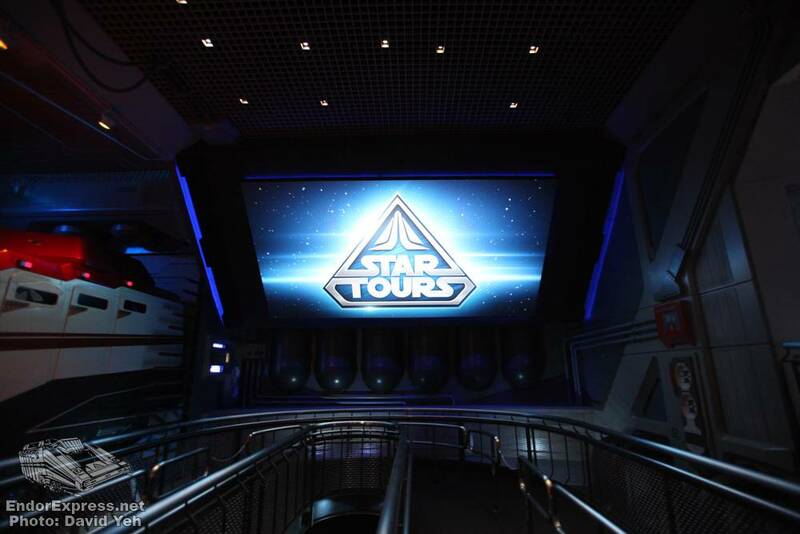 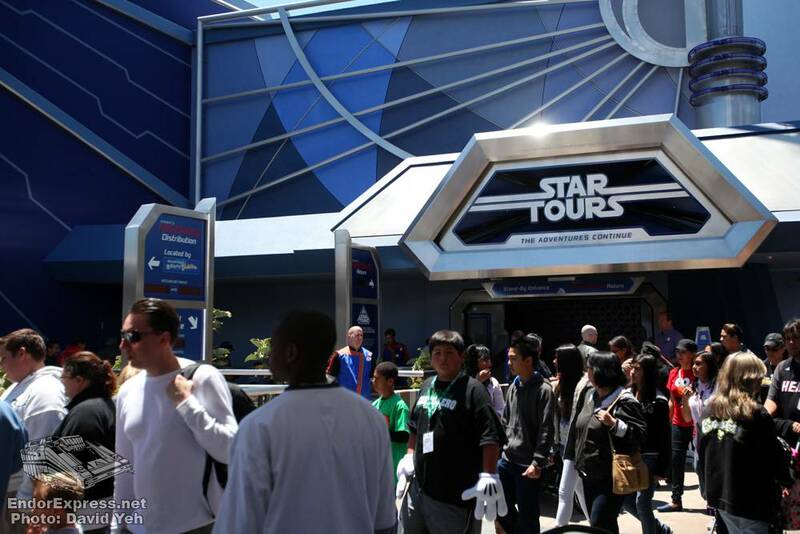 The new STAR TOURS marquee has been completely redesigned to include lights and it looks magnificent day and night. 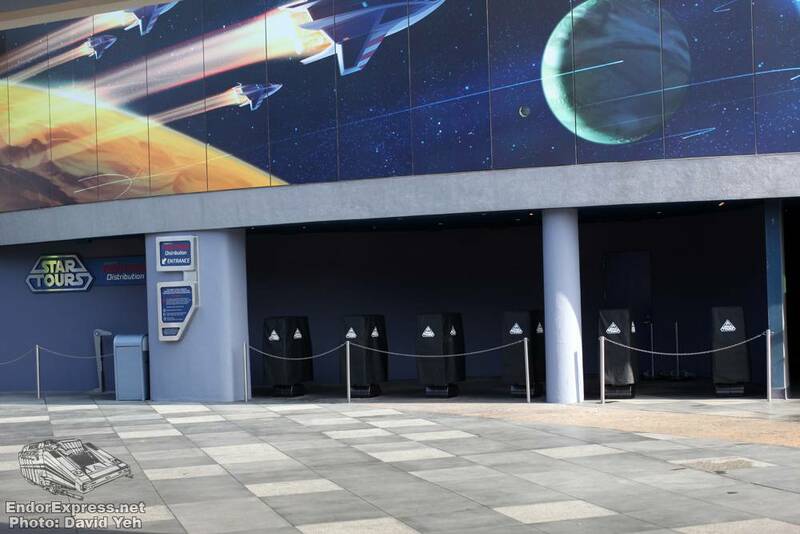 The main queue has never looked better even if it remains virtually unchanged. The Mon Calamari officers are both present with neck-turning animations. 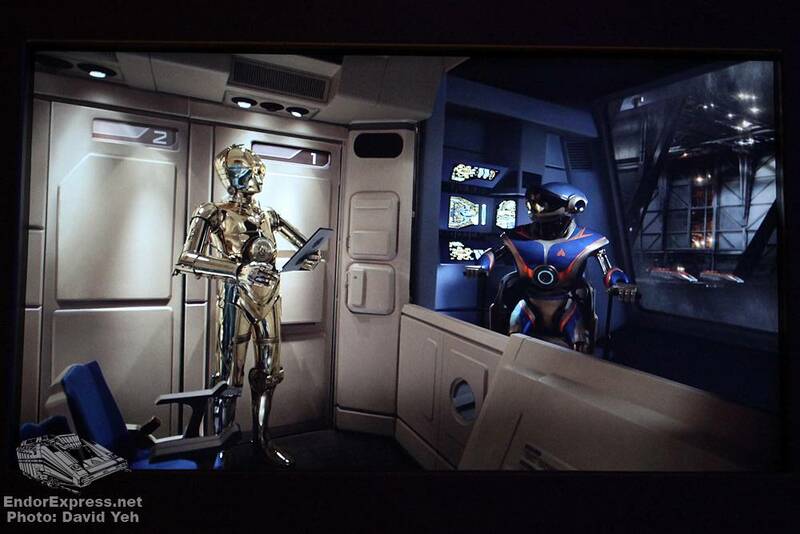 Our favorite protocol droid C-3PO and astromech R2-D2 still babble on about their new task assigned by Captain Antilles. 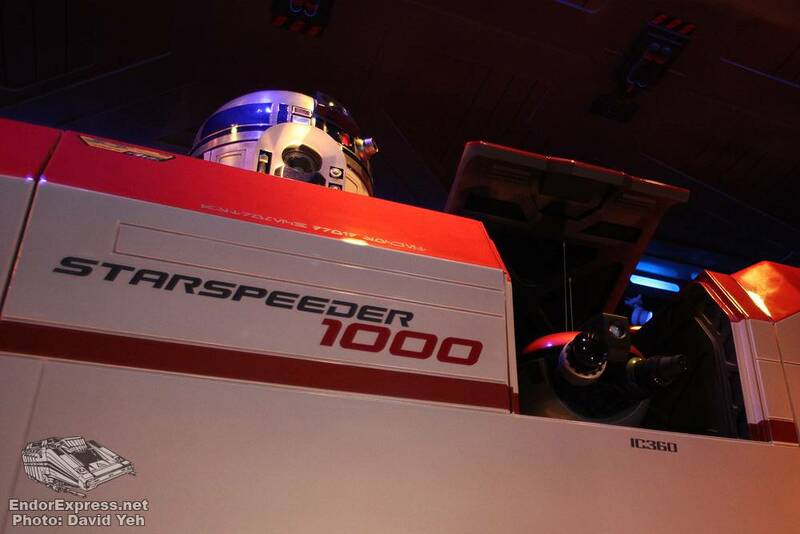 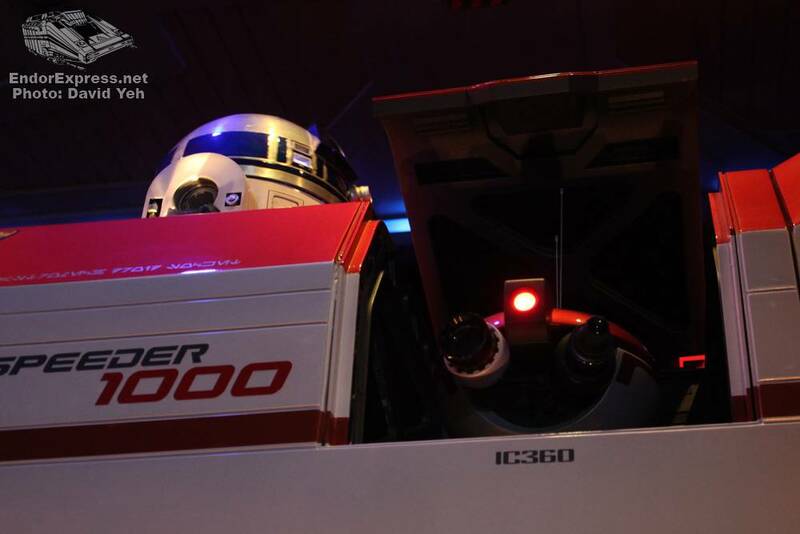 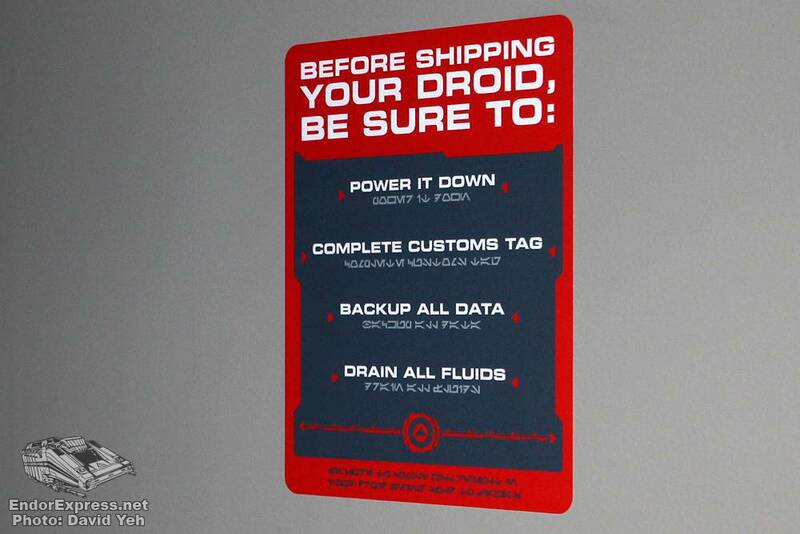 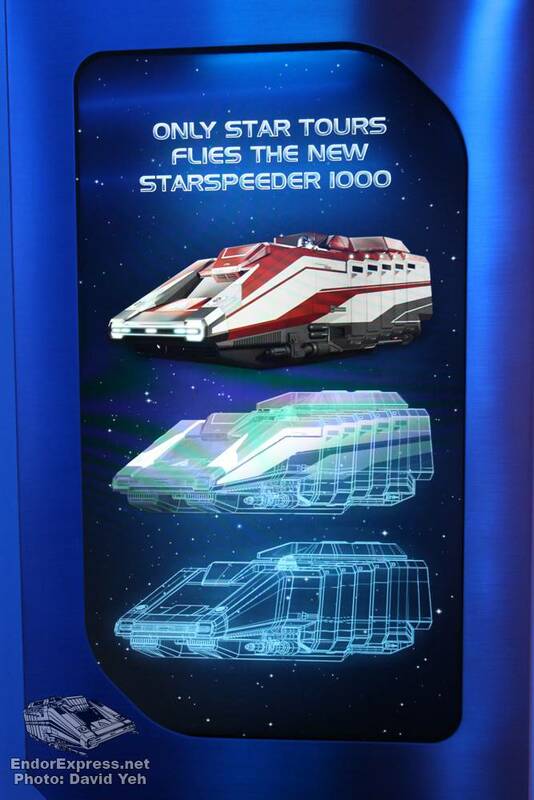 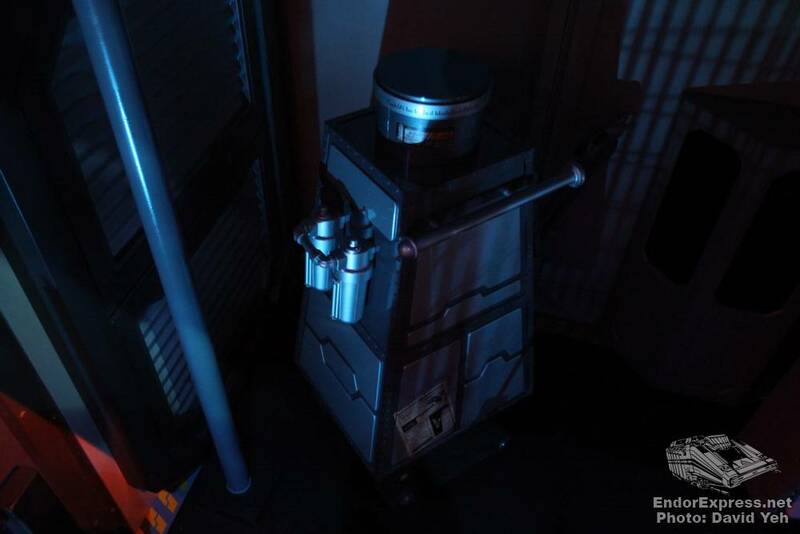 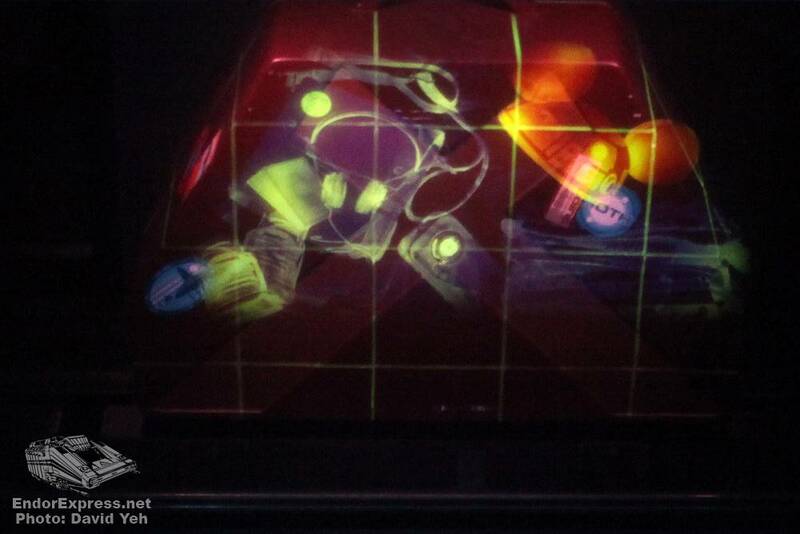 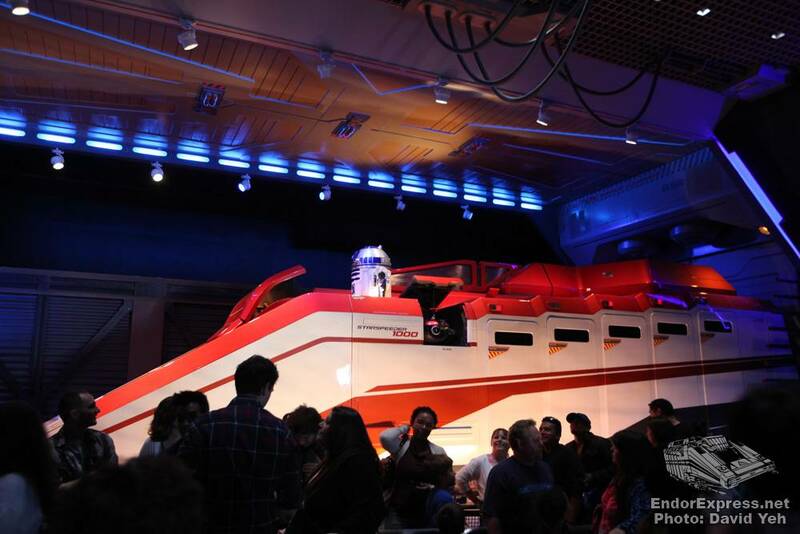 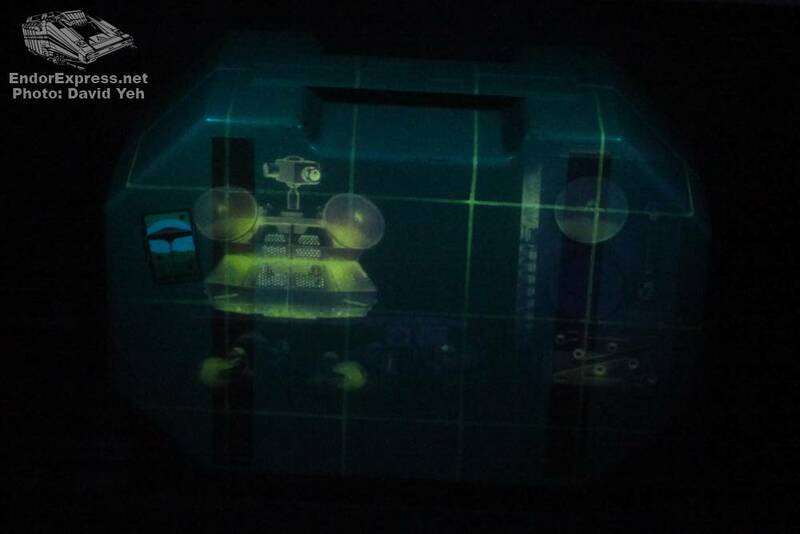 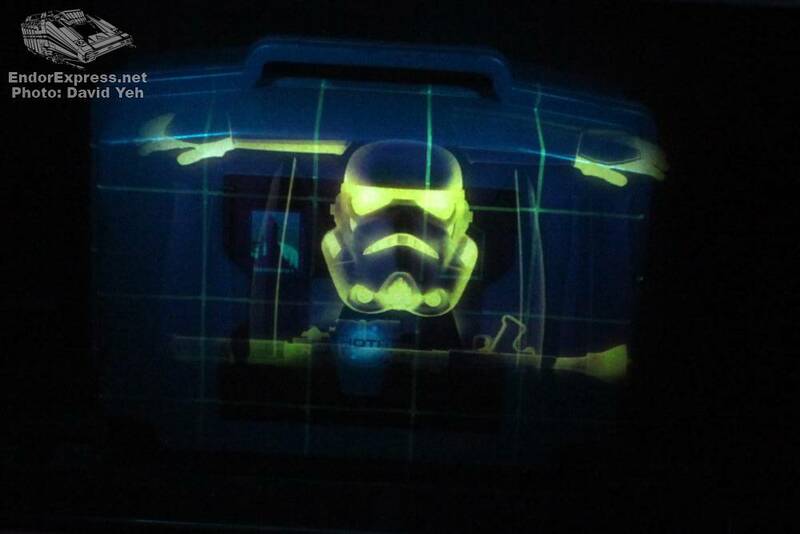 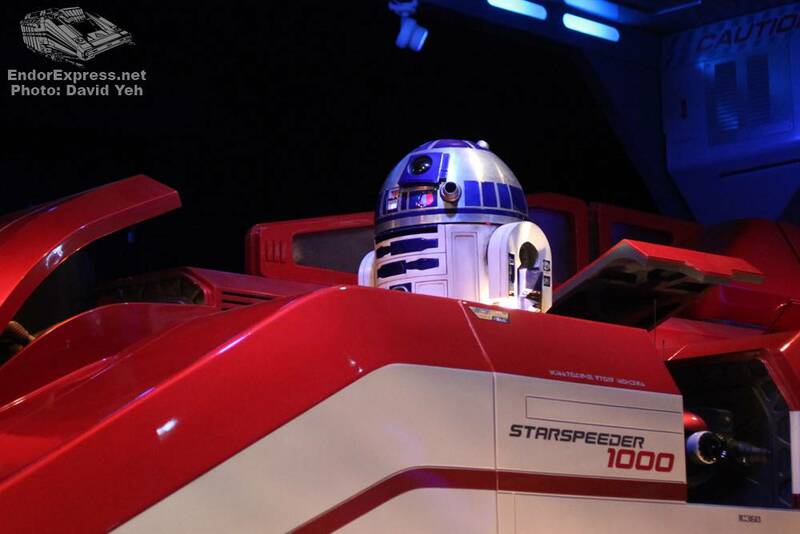 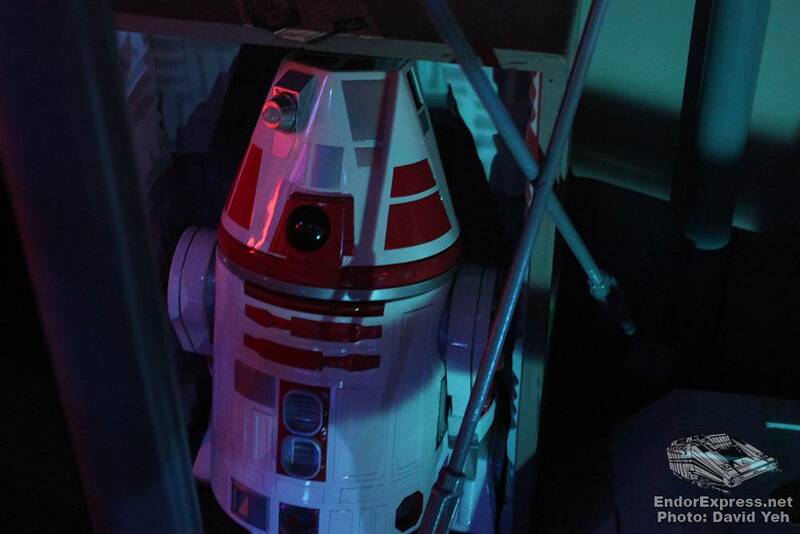 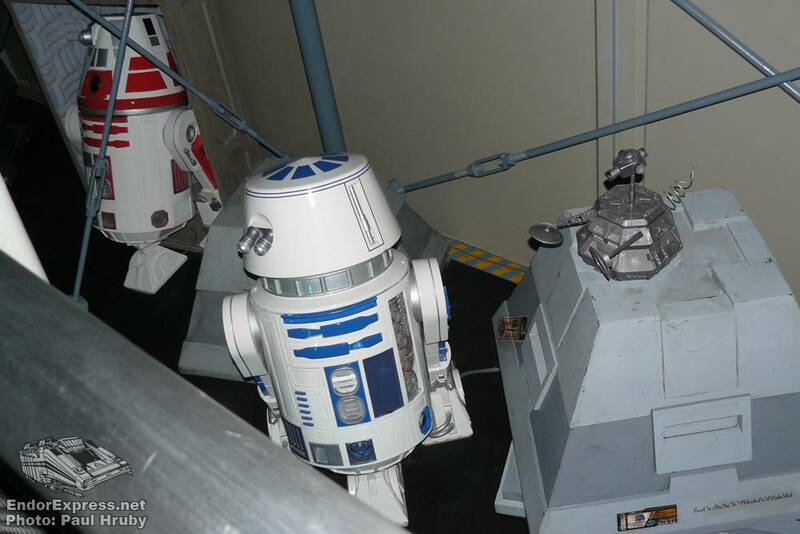 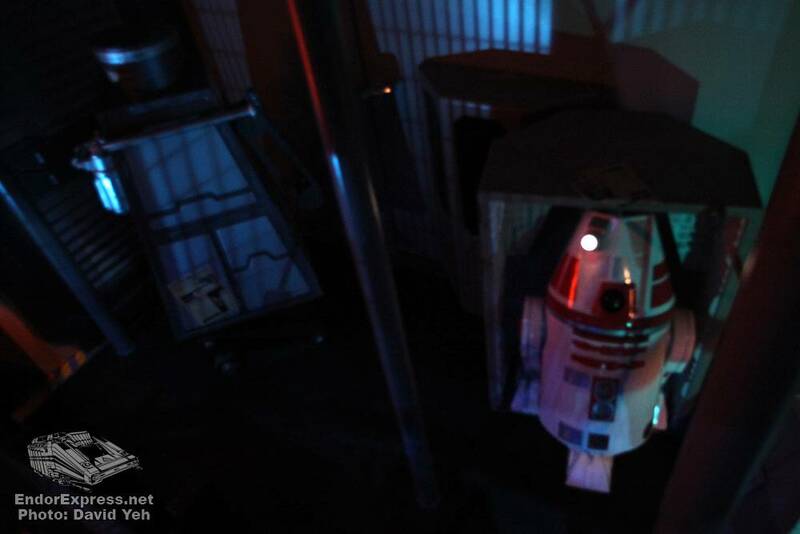 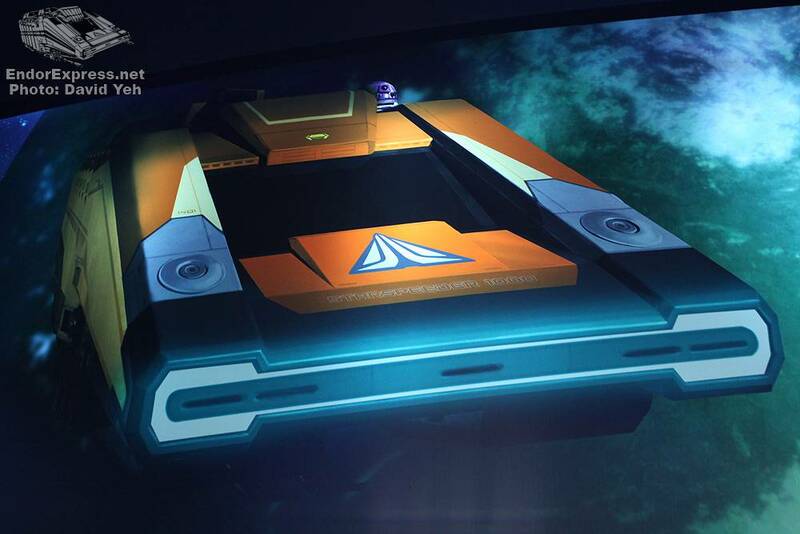 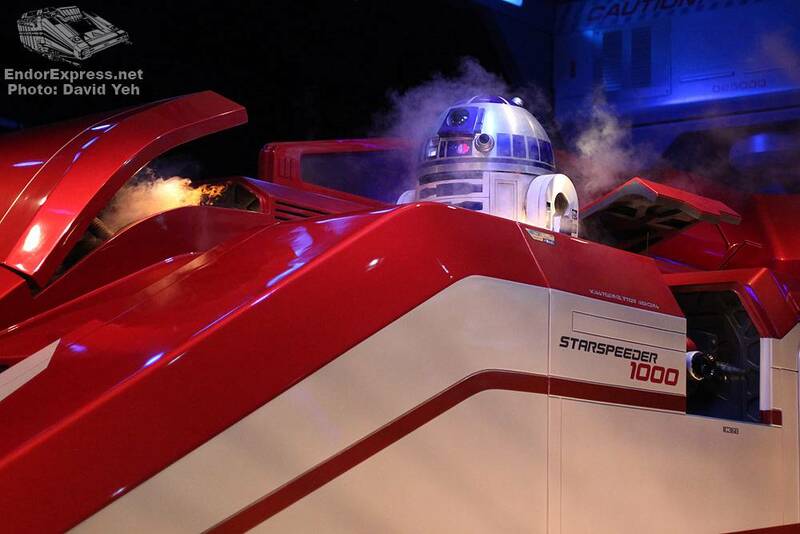 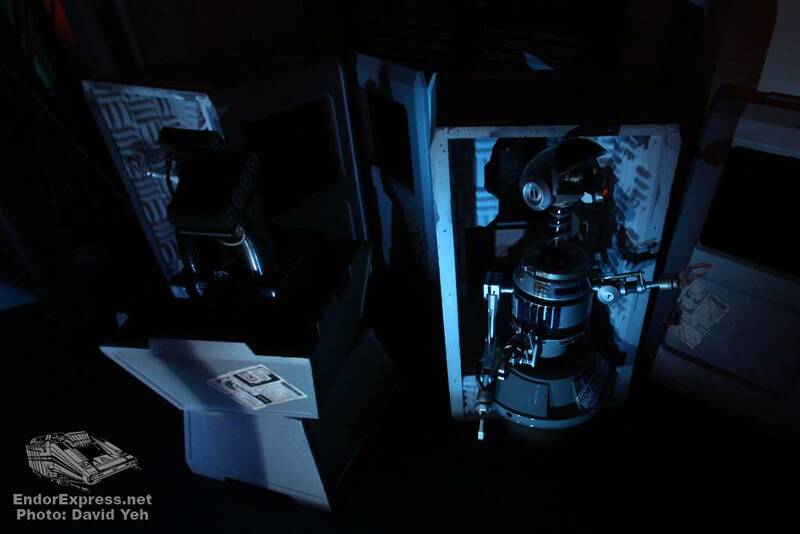 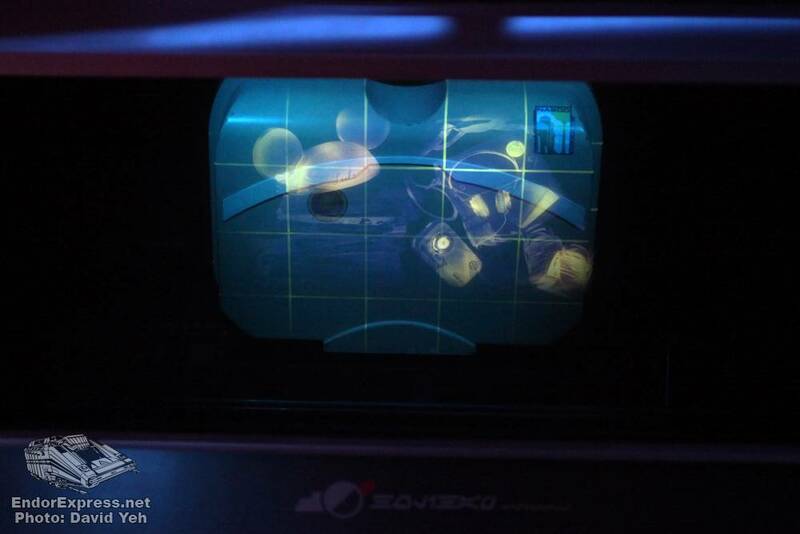 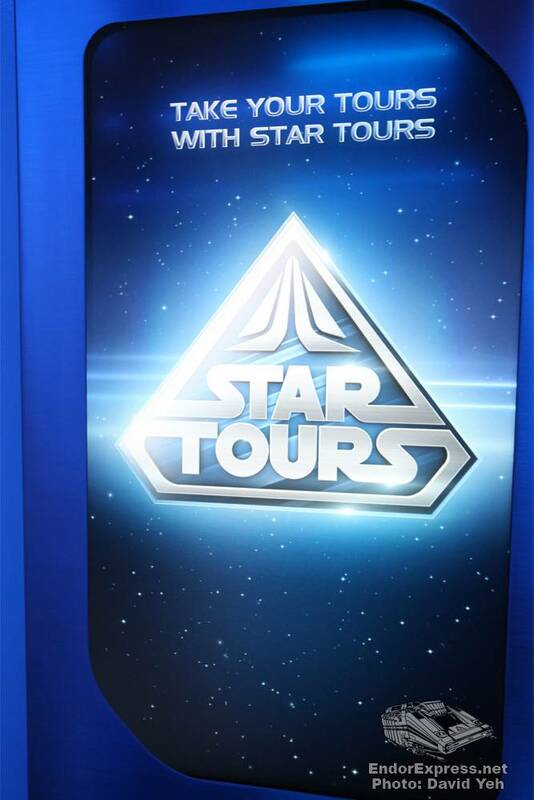 A new droid present is the IC360, a camera droid on every Star Tours voyage capturing sounds and video from your trip. 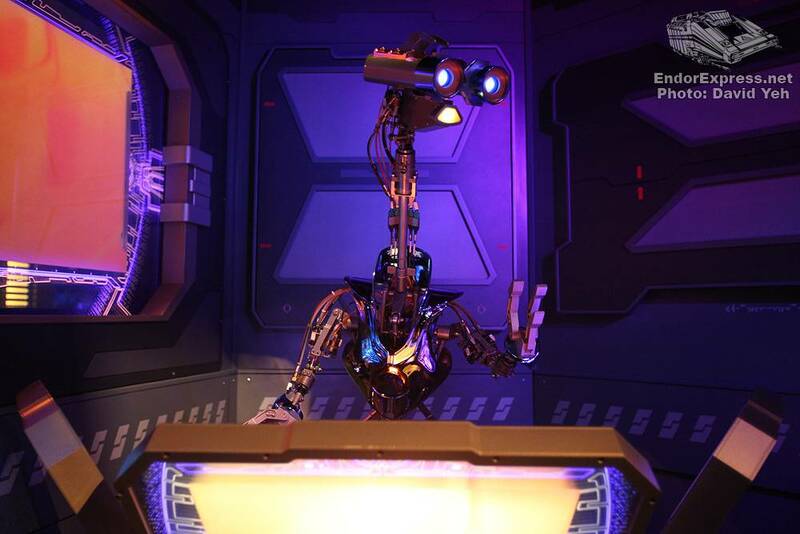 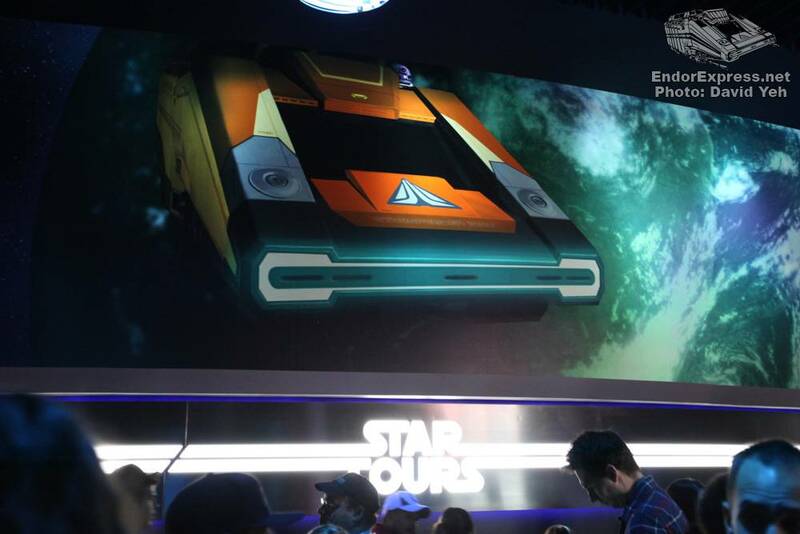 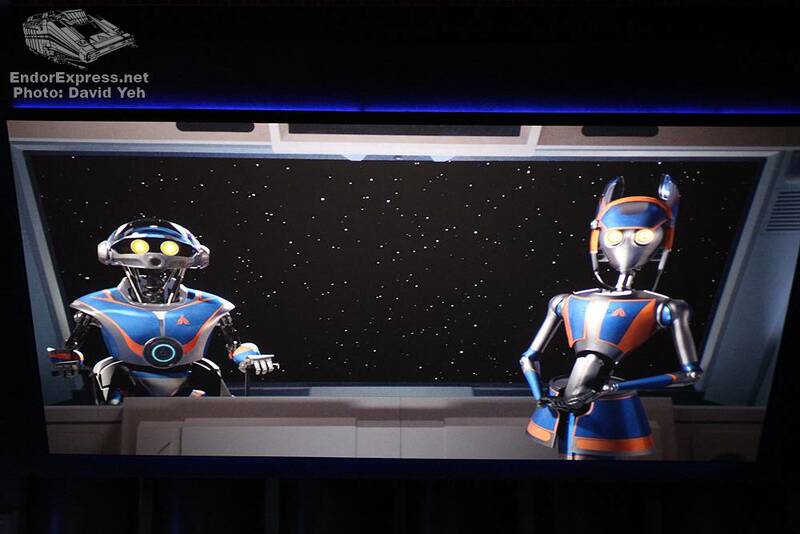 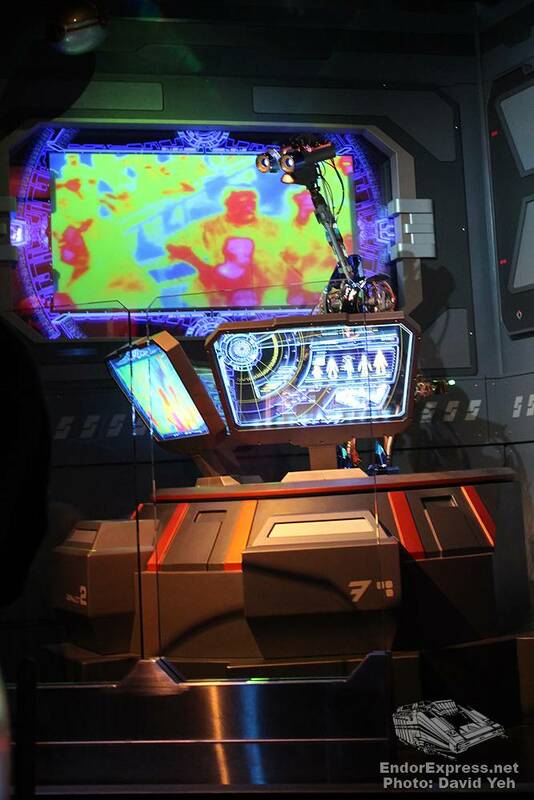 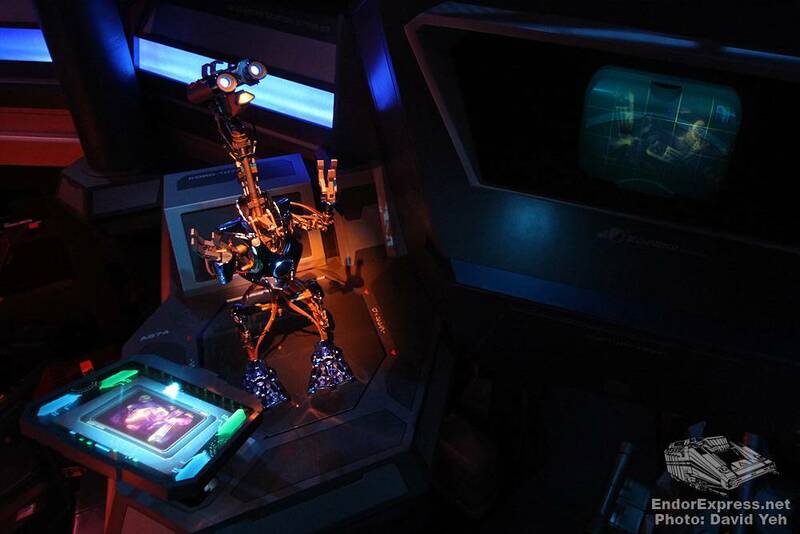 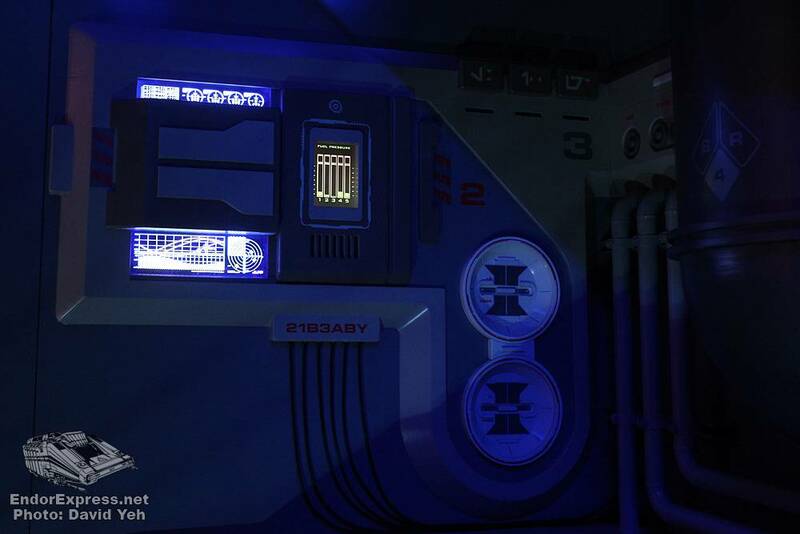 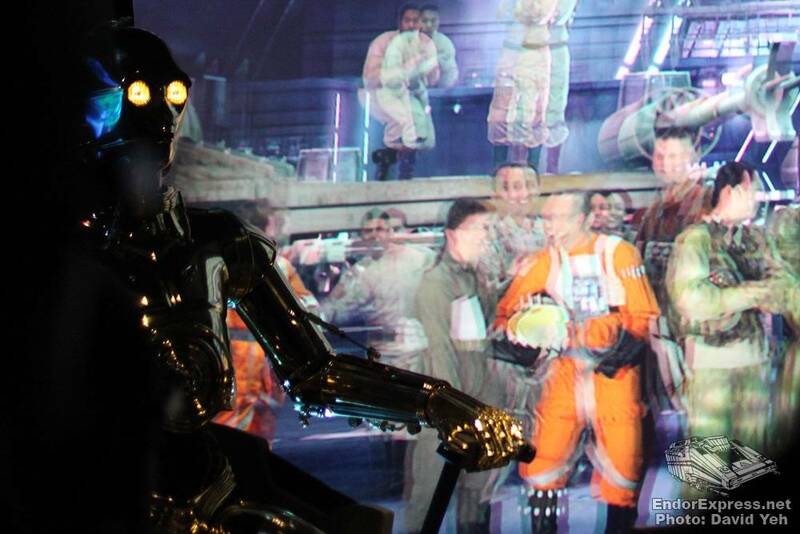 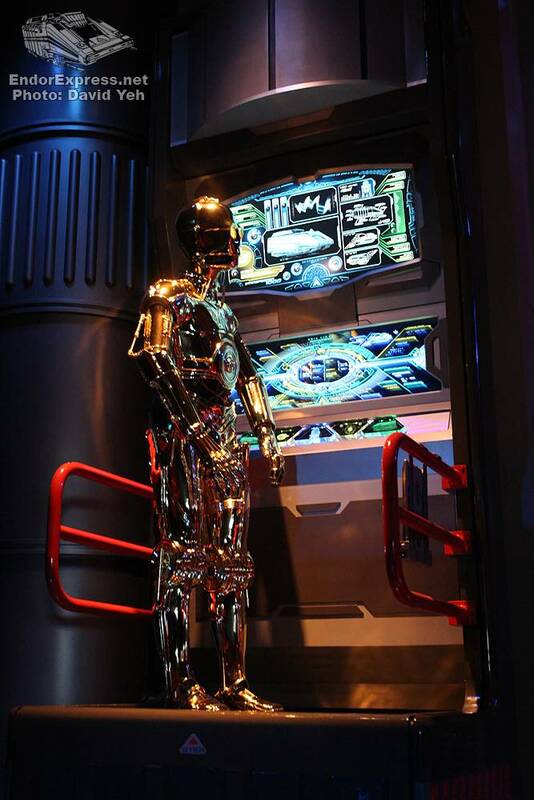 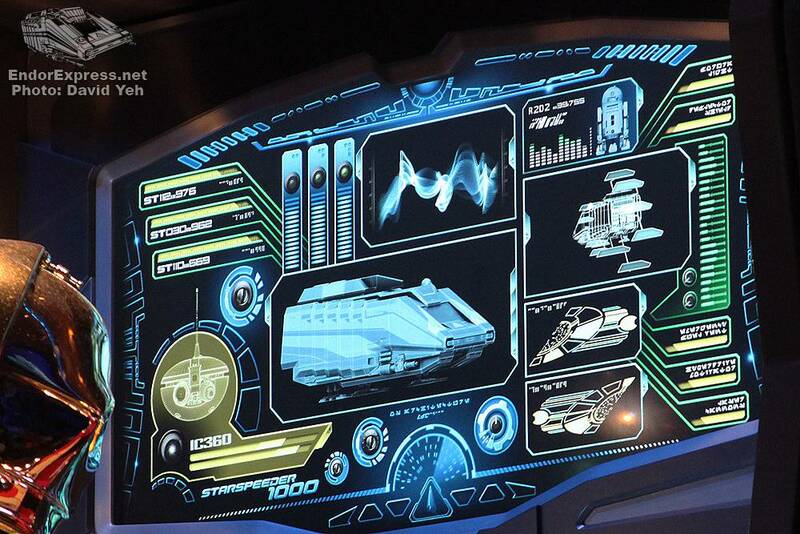 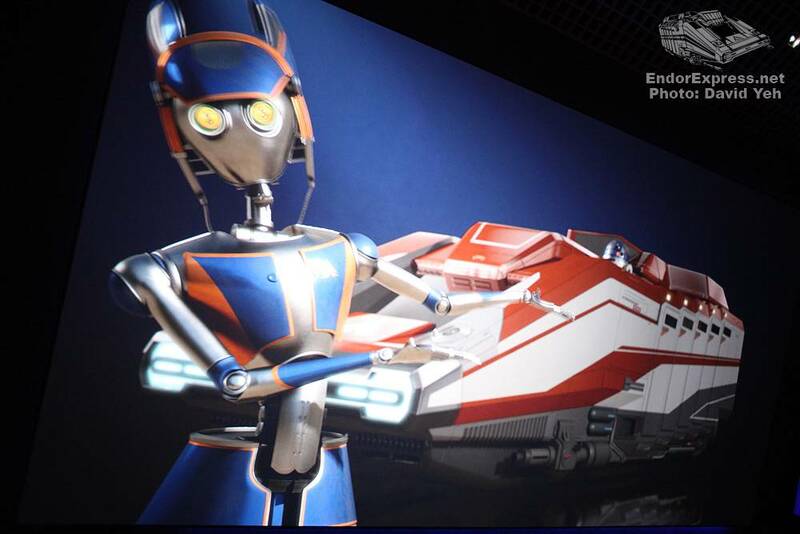 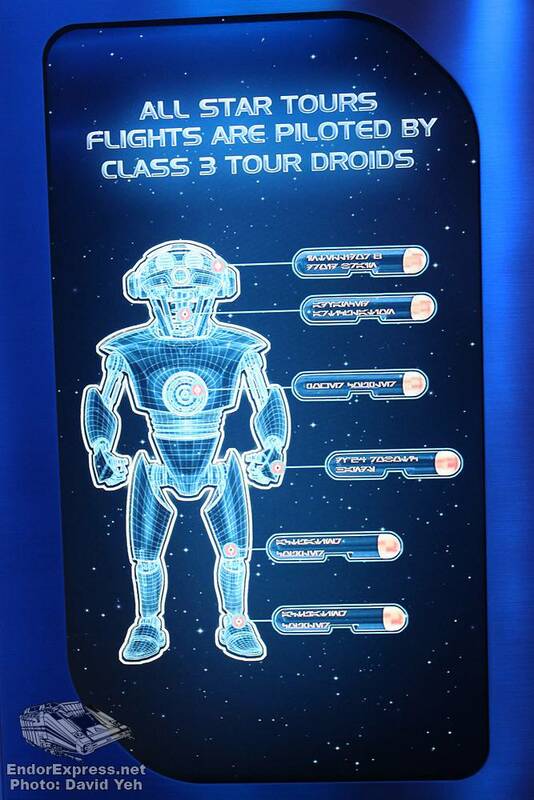 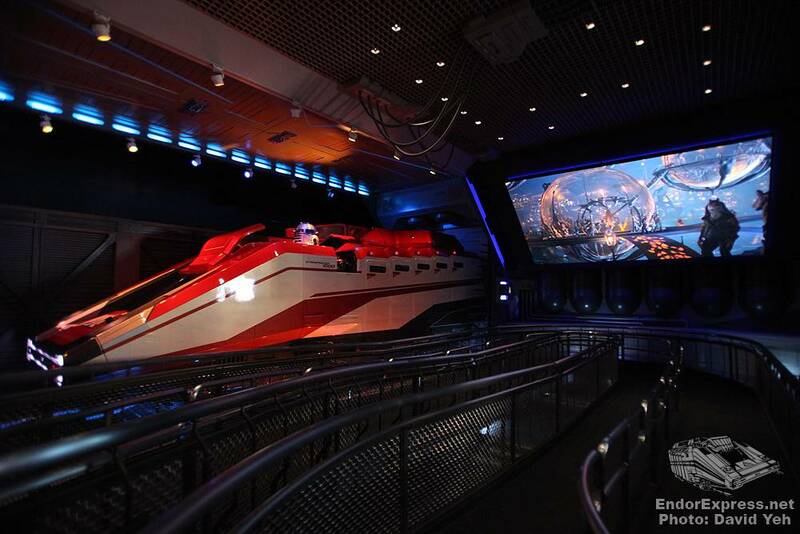 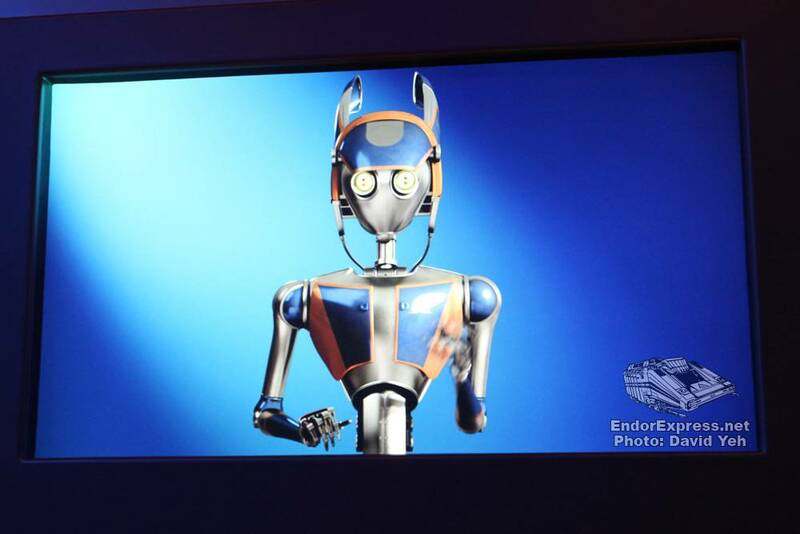 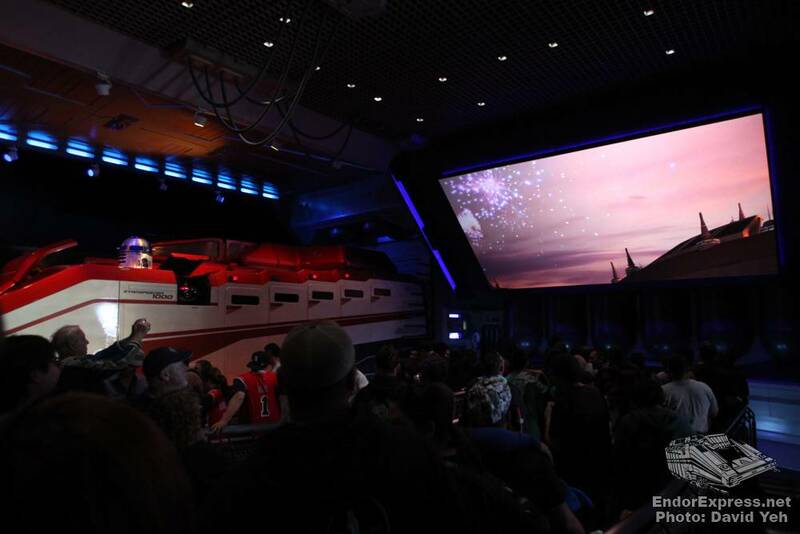 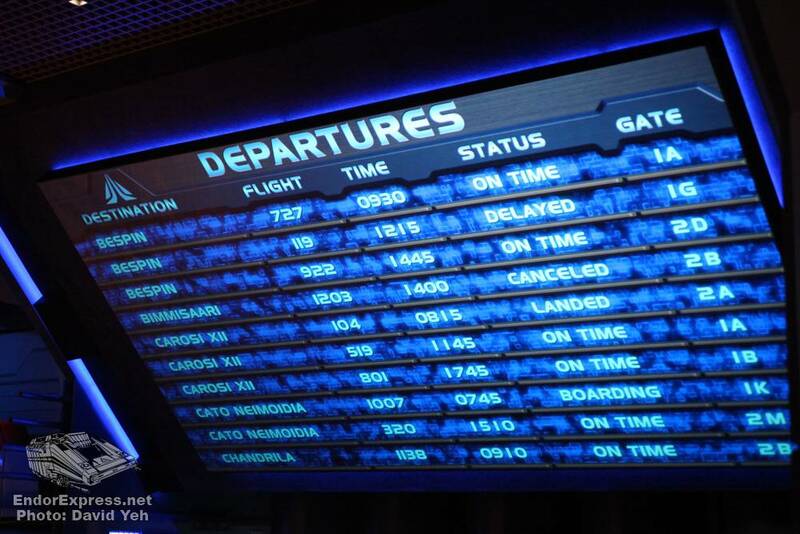 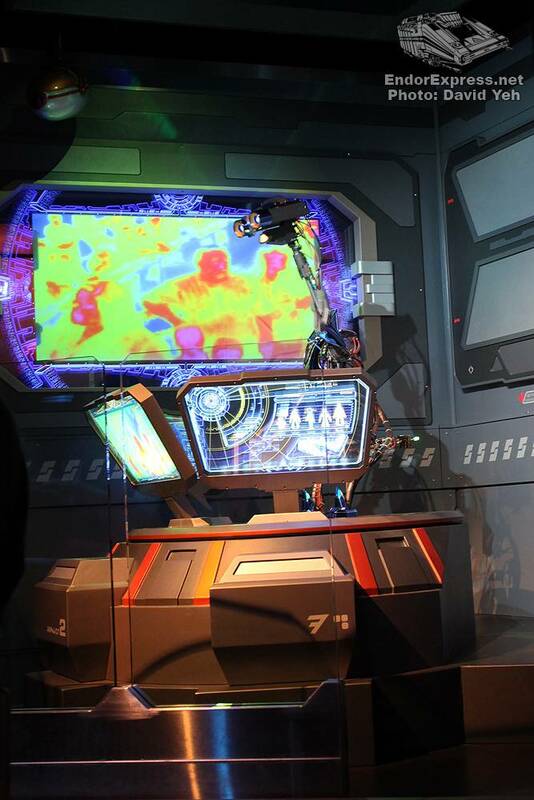 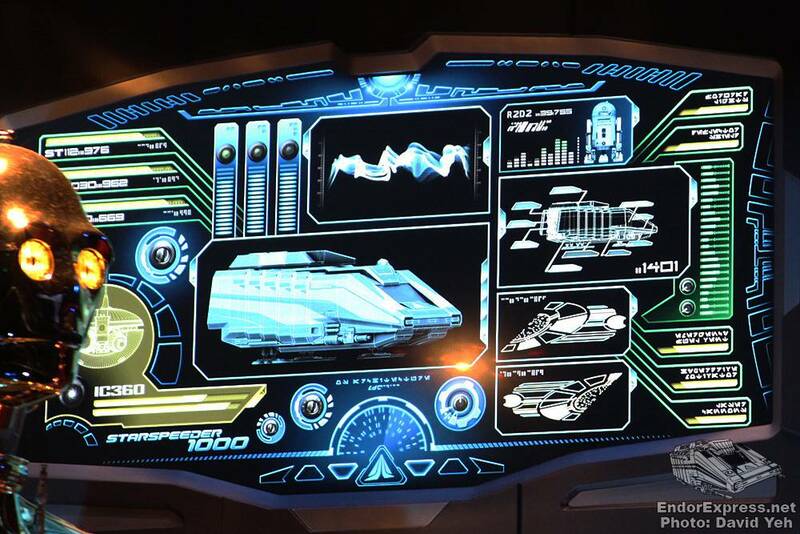 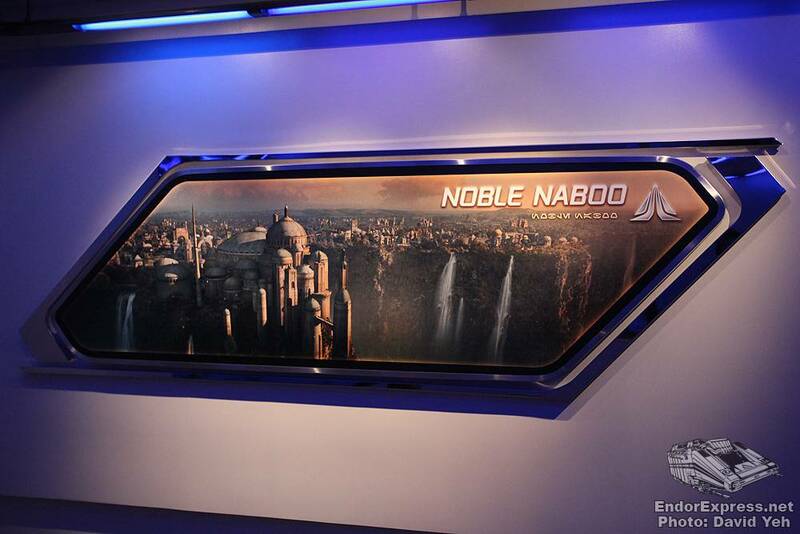 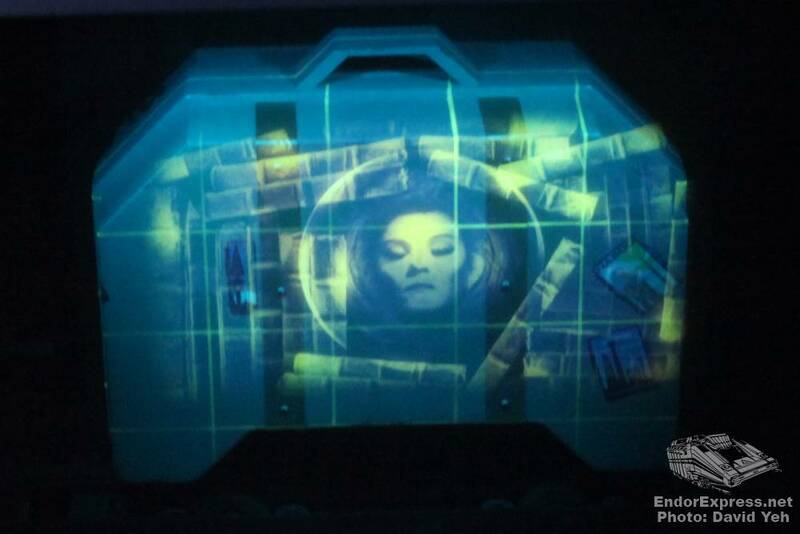 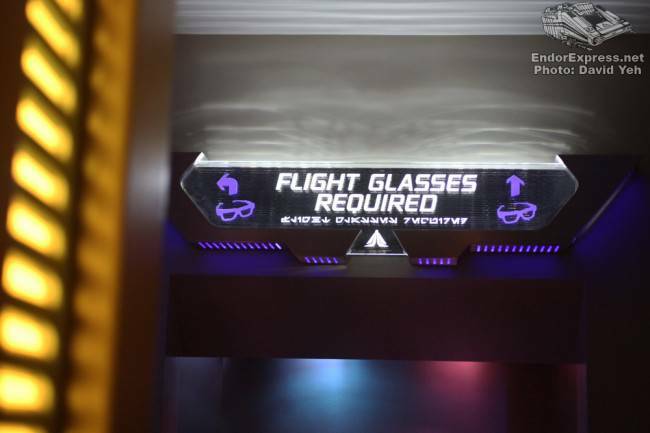 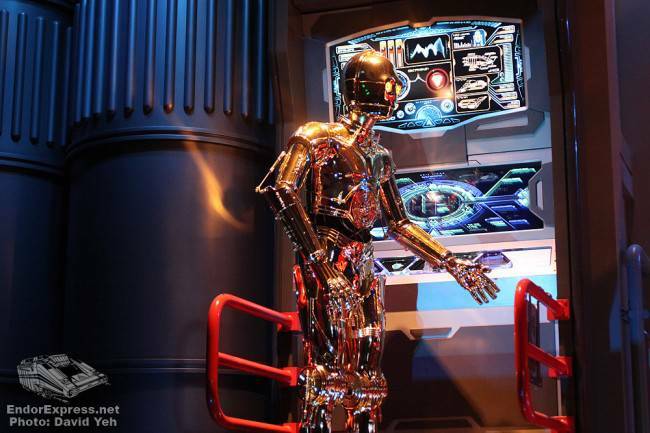 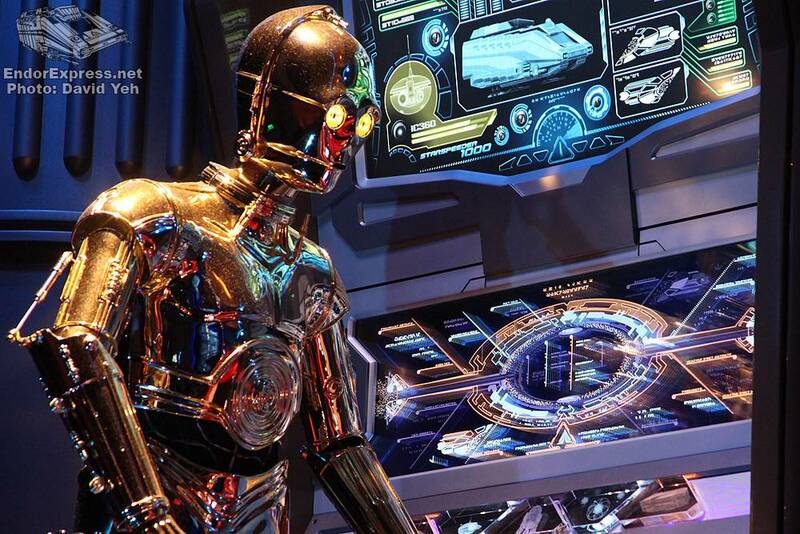 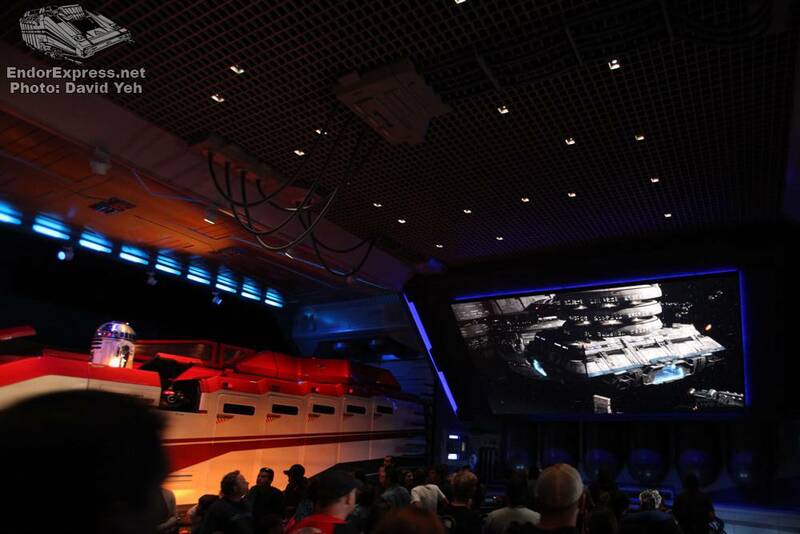 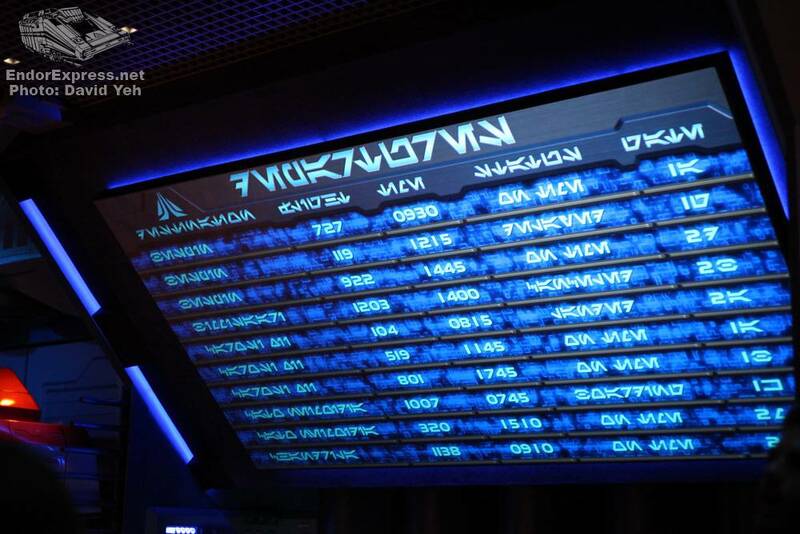 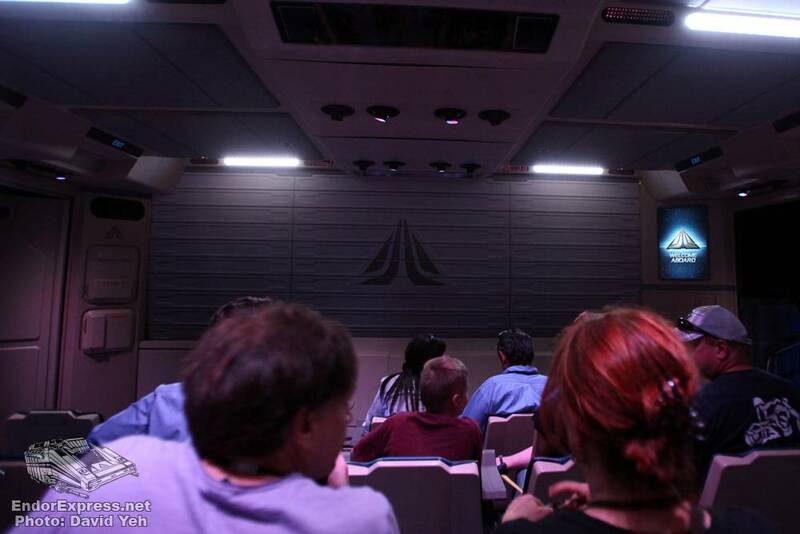 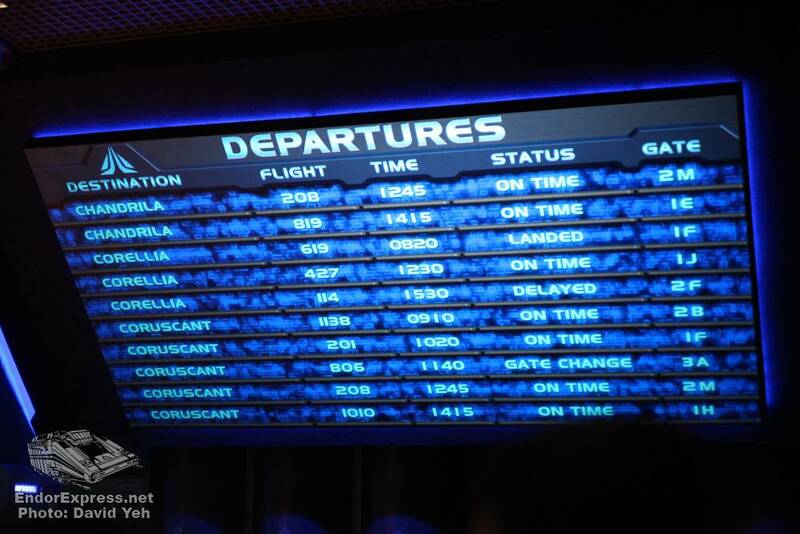 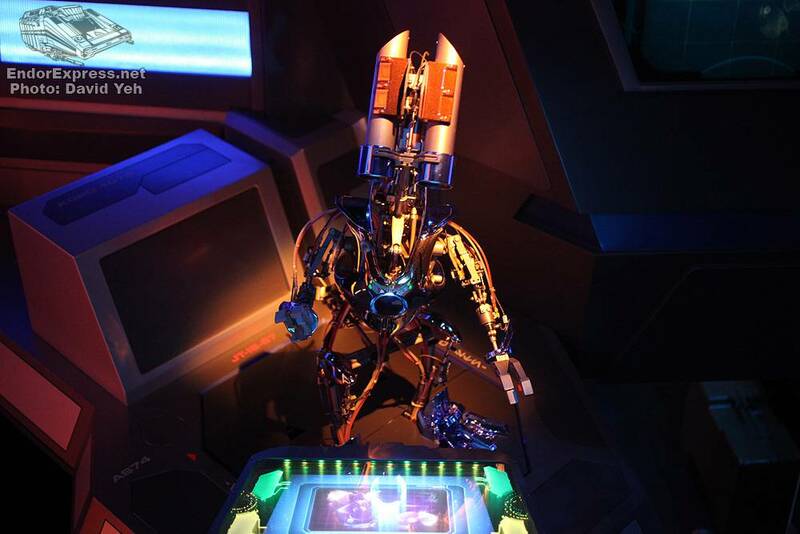 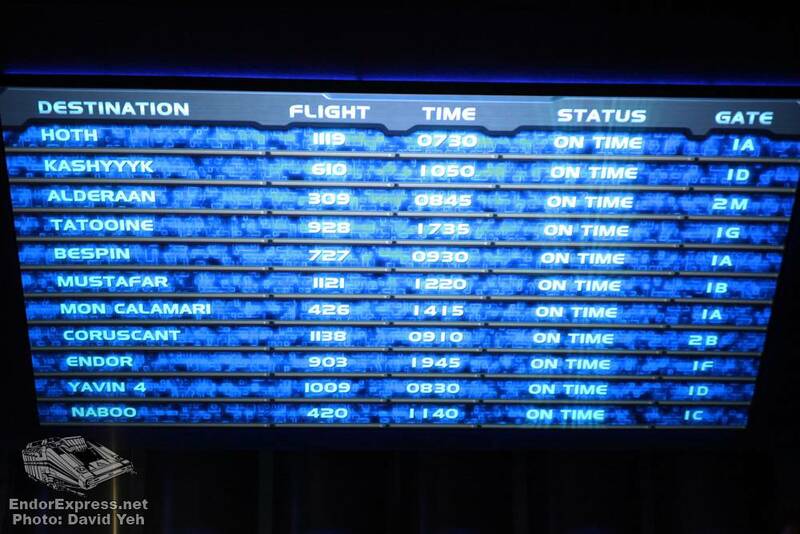 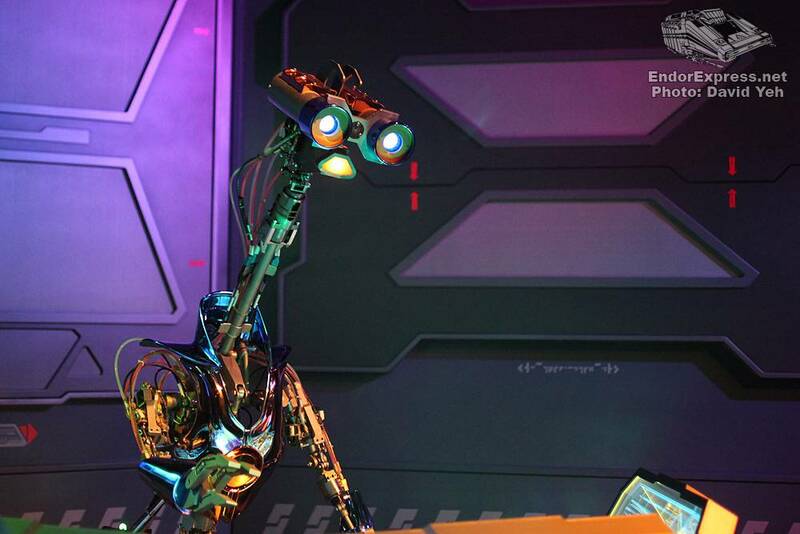 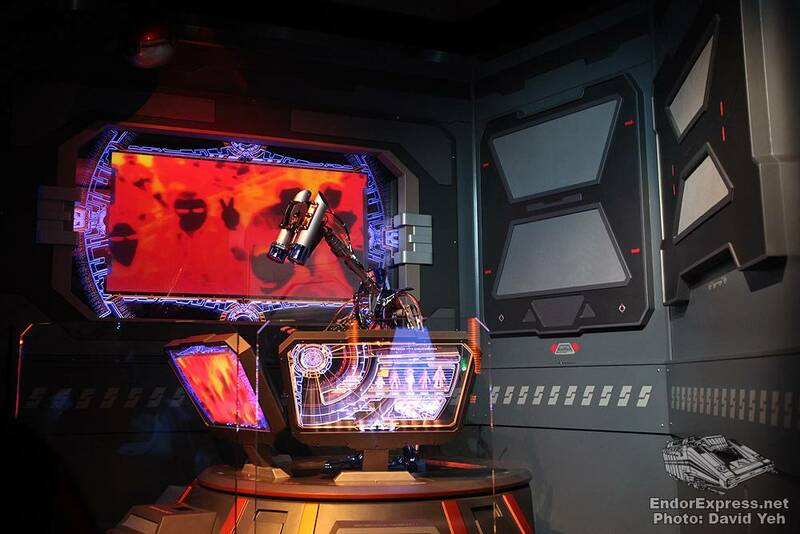 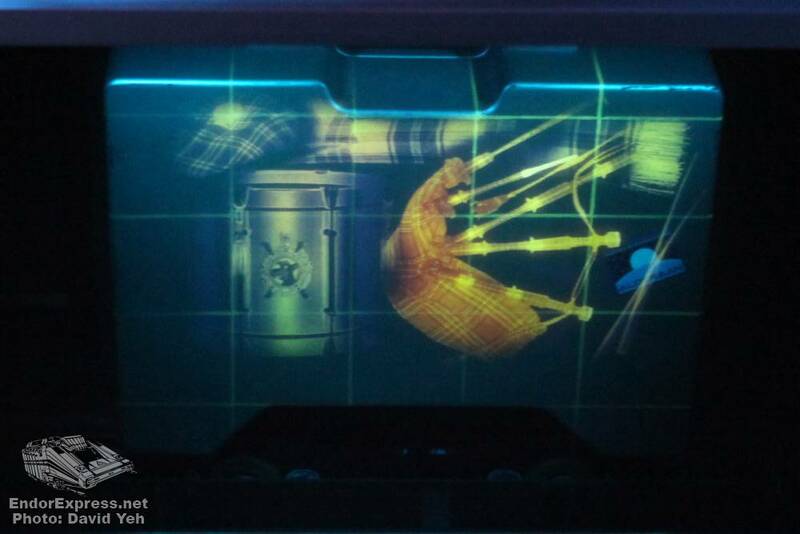 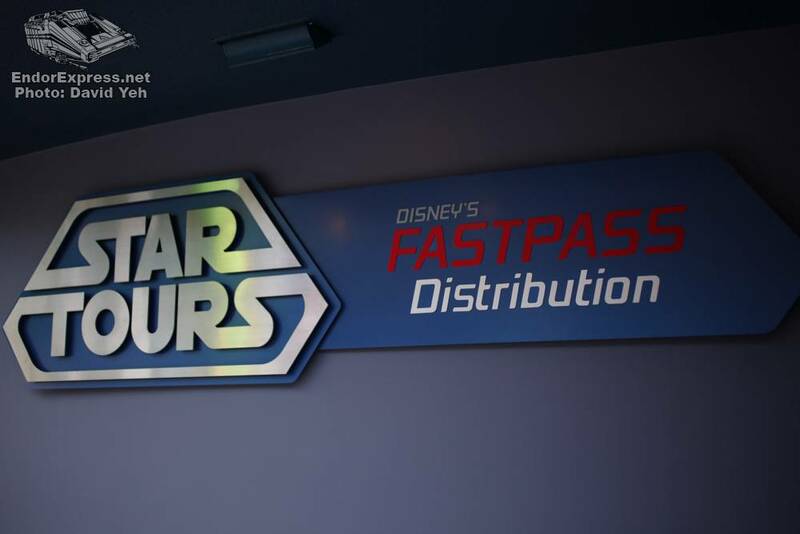 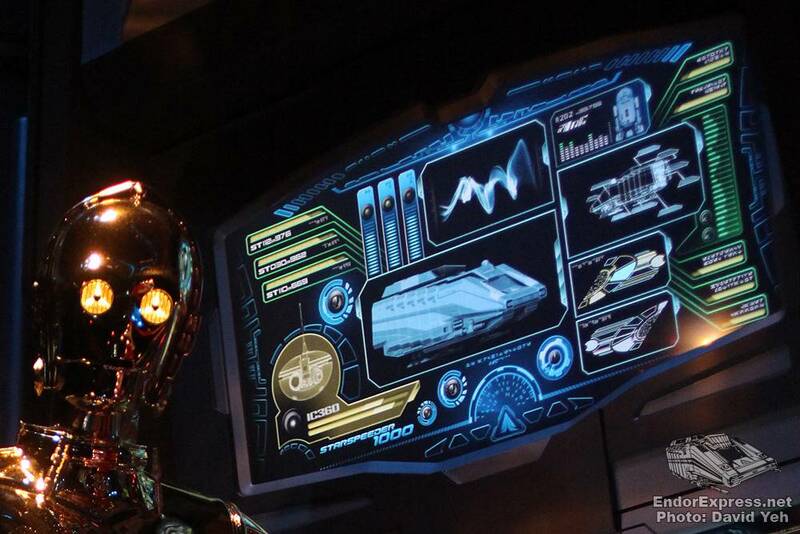 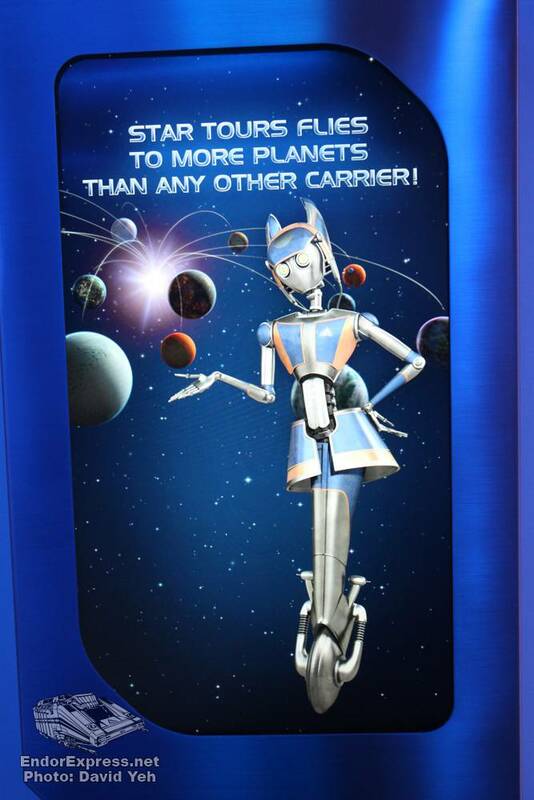 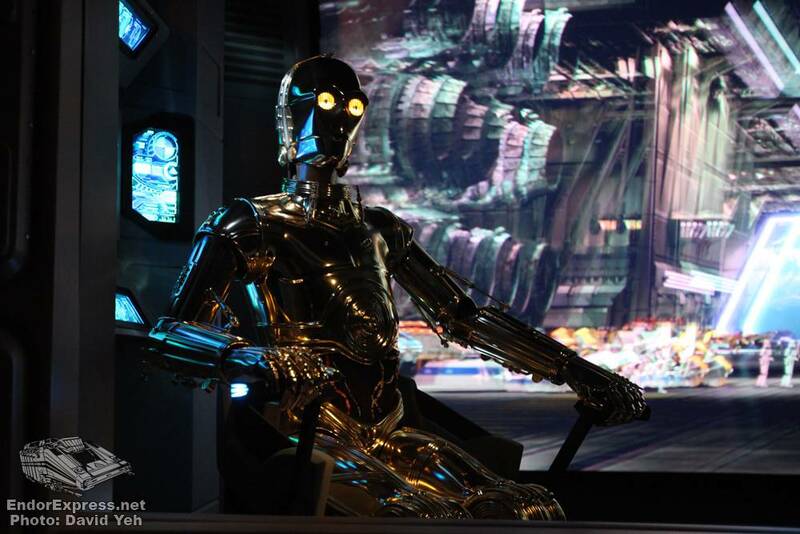 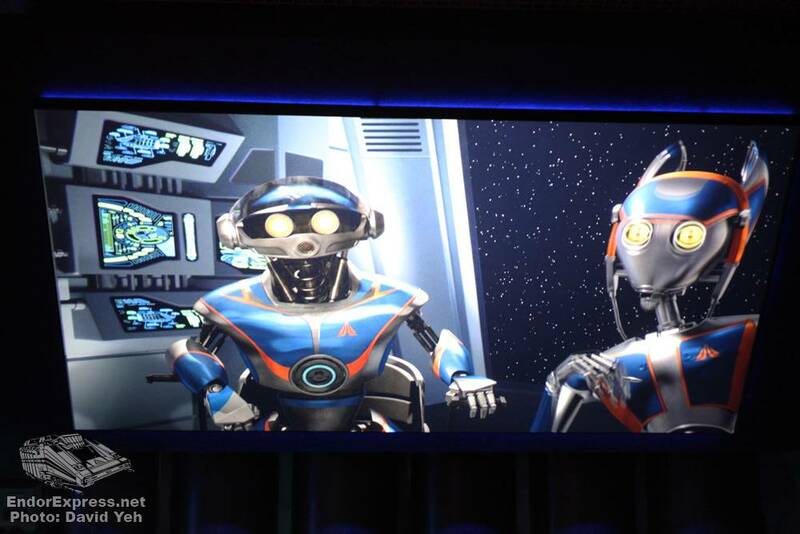 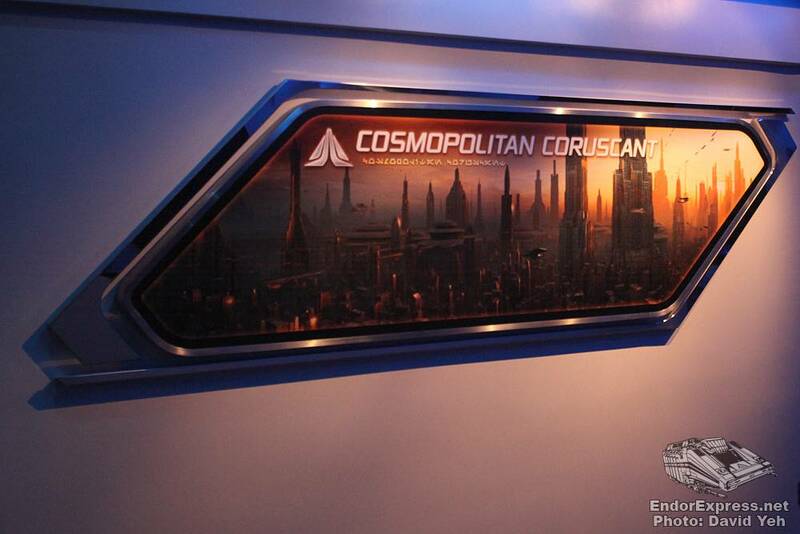 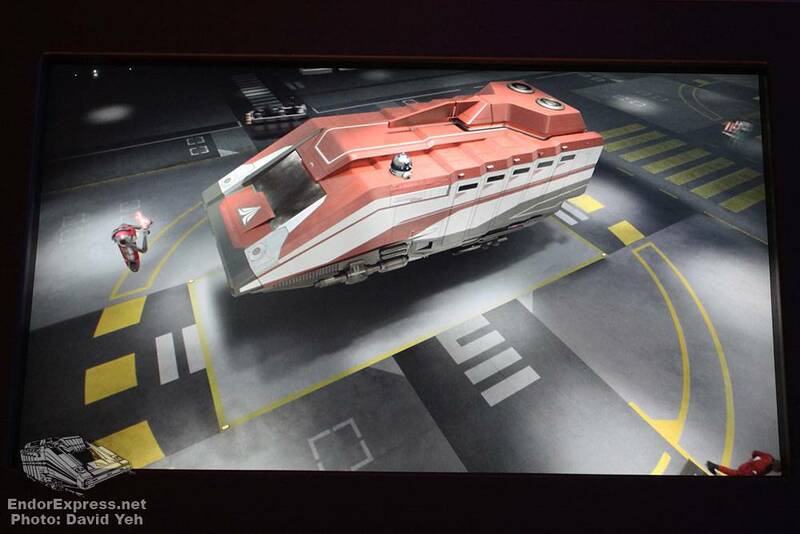 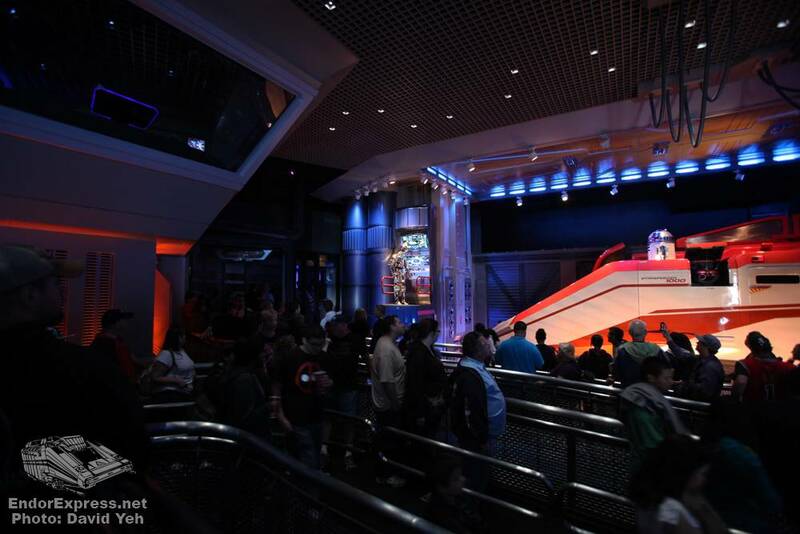 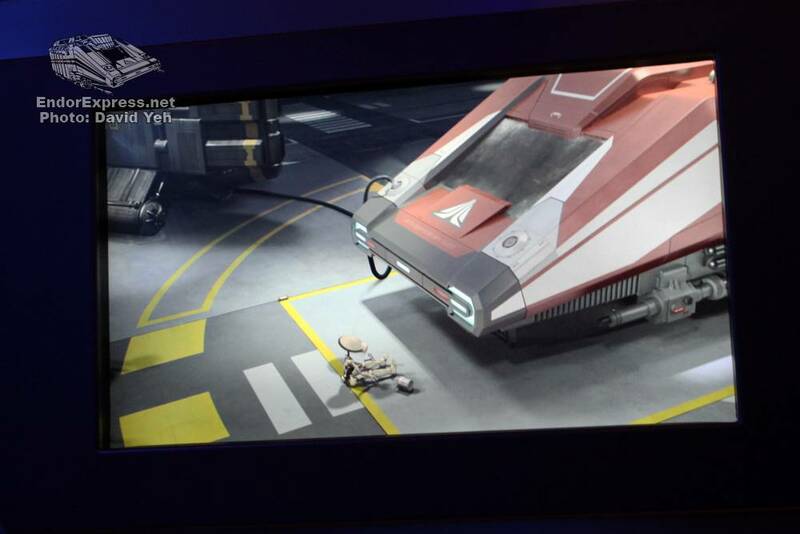 The overhead screen features even more graphics and animation than ever before including weather updates, flight schedules, destinations, and a closer look at our new droid pilot, presented by the Star Tours spokesbot AlySanSan (voiced by Allison Janney). 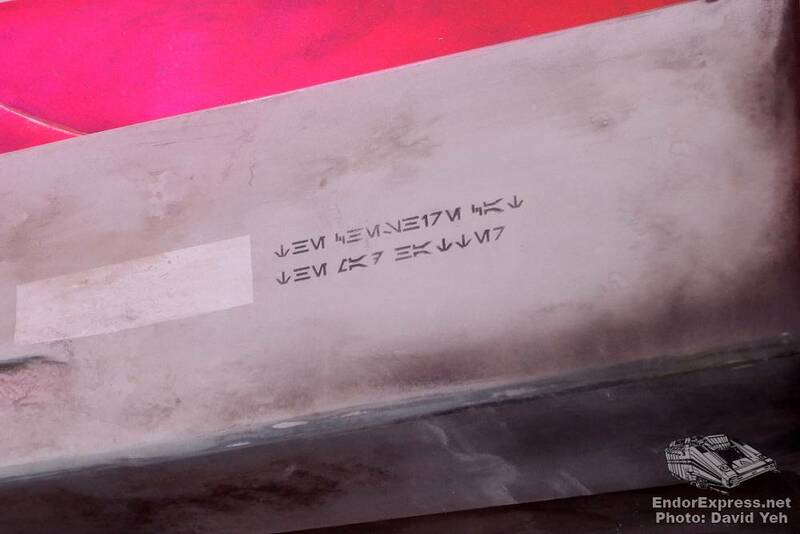 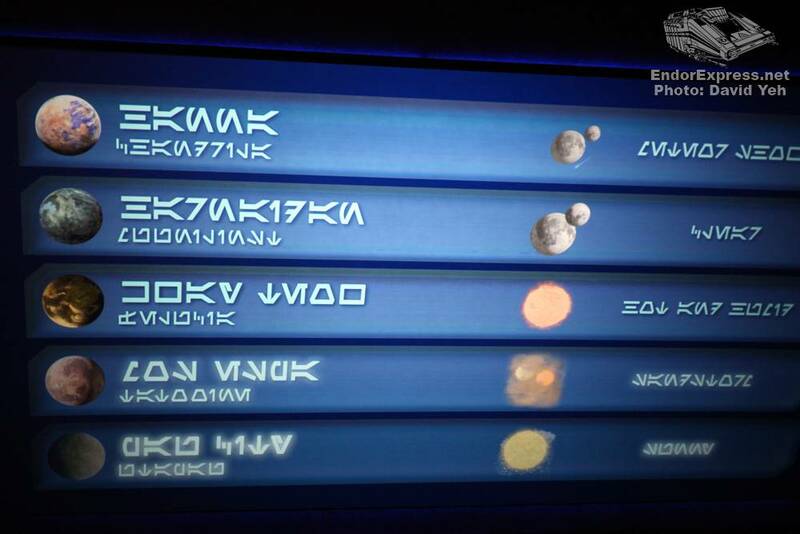 Some information is even provided in Aurebesh, a Star Wars alphabet. 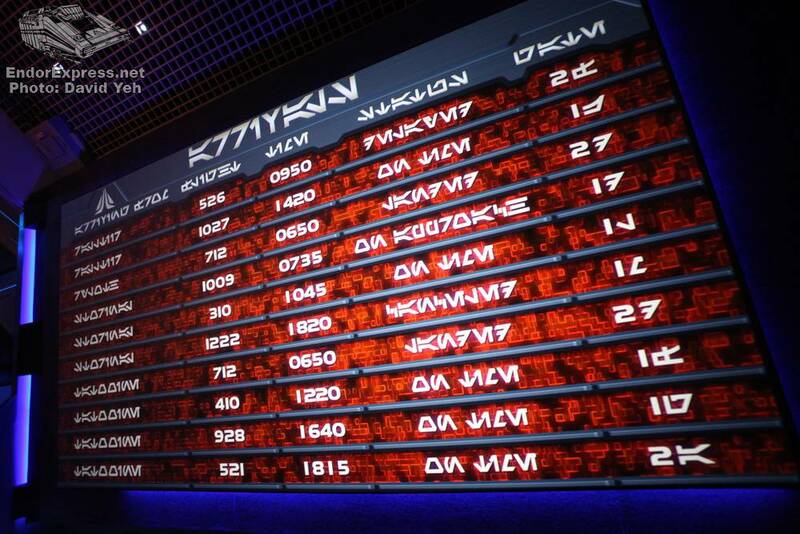 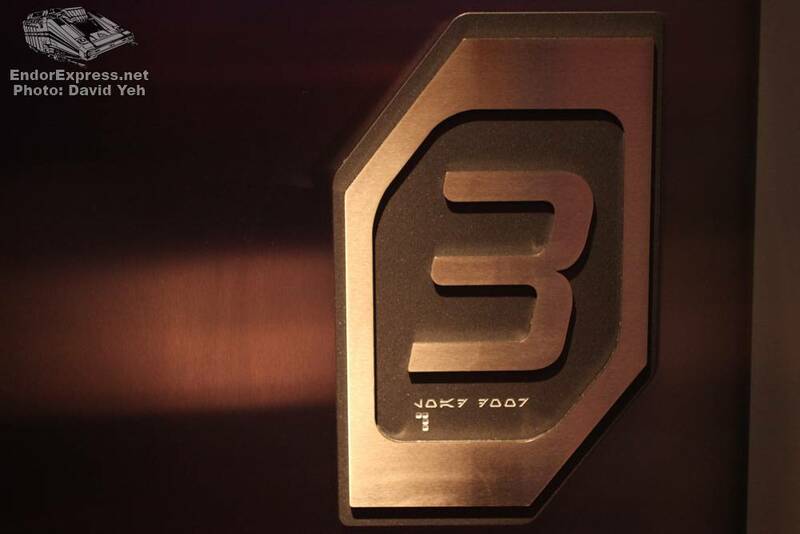 Keen-eyed fans will even catch a reference to 1138. 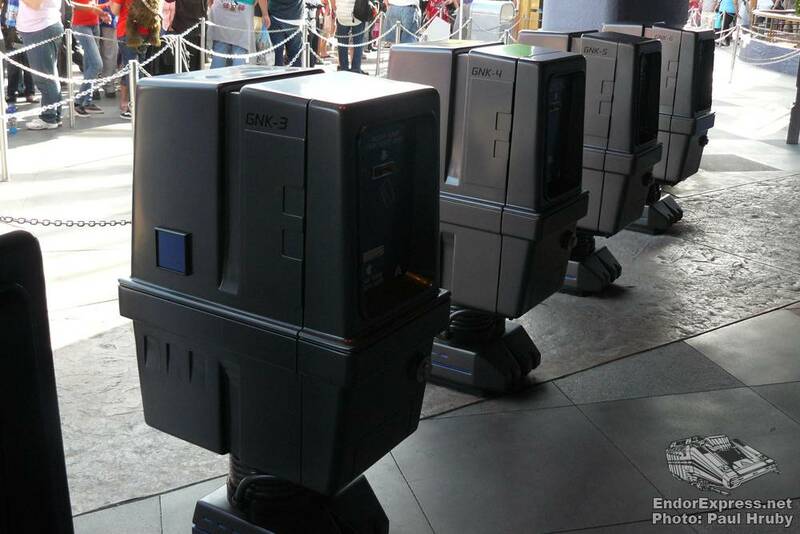 In what used to be called Sector 2, travelers can still see G2 droids hard at work. 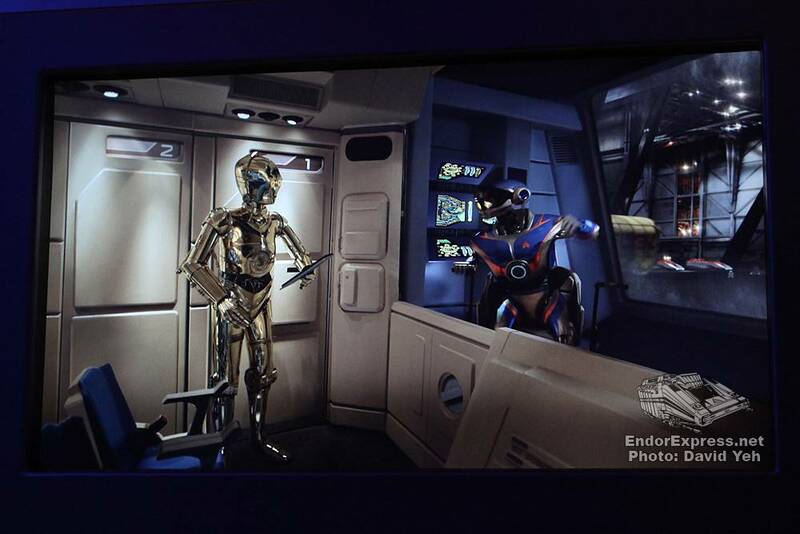 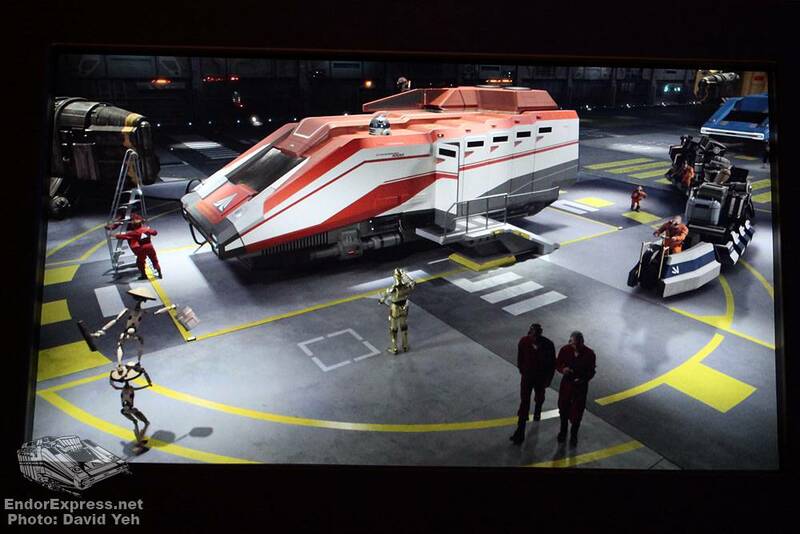 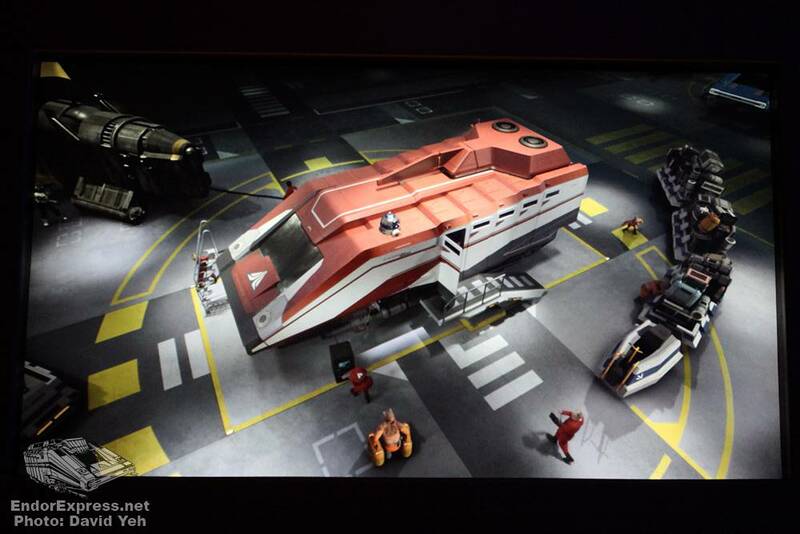 But instead of repairing droids or mouthing off, they’re hard at work doing spaceport duties. 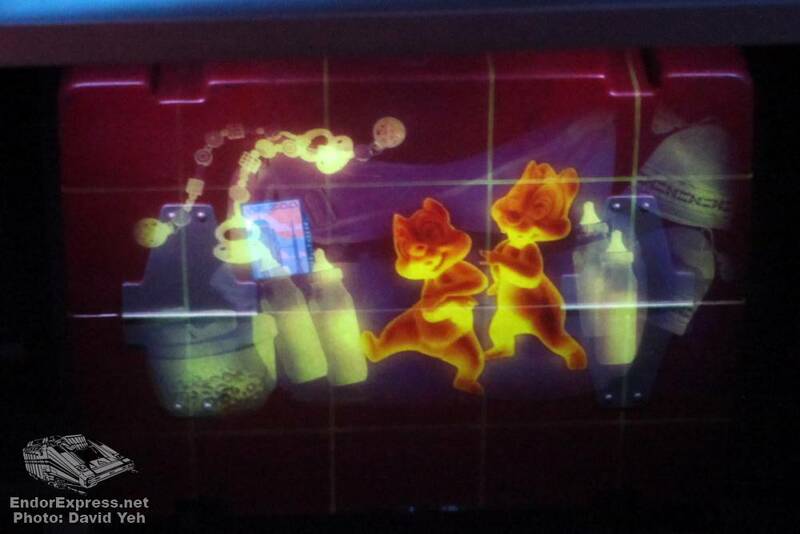 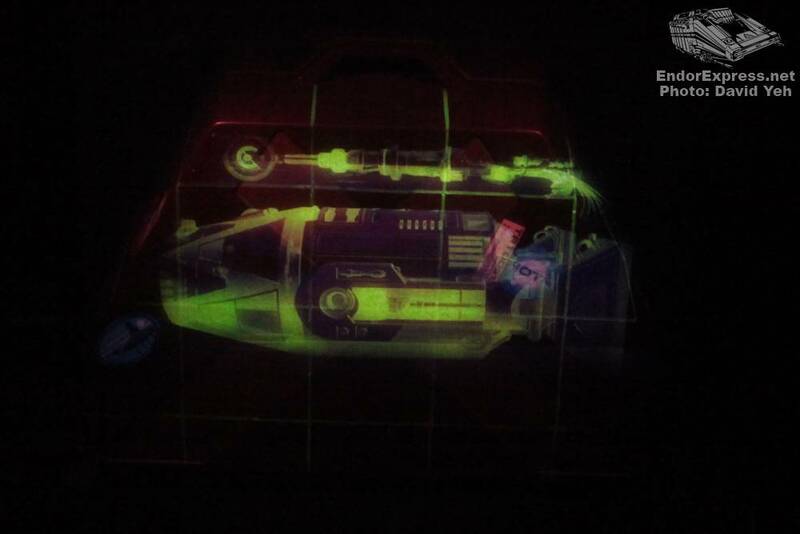 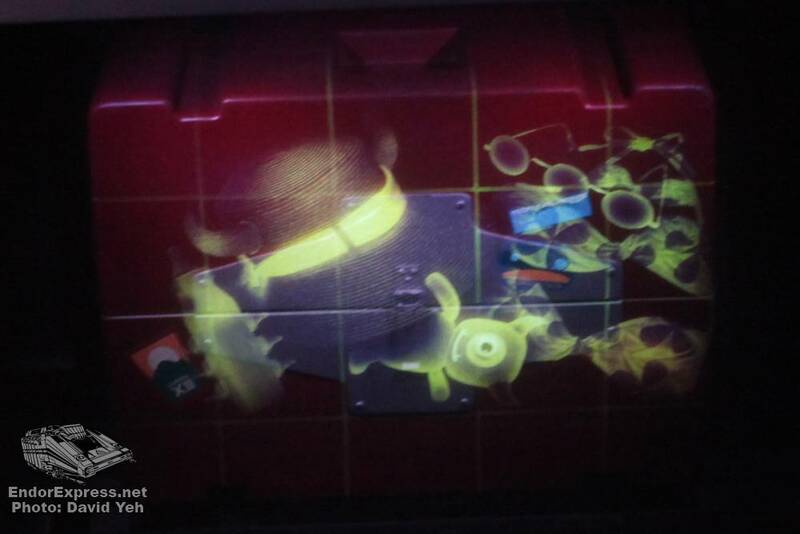 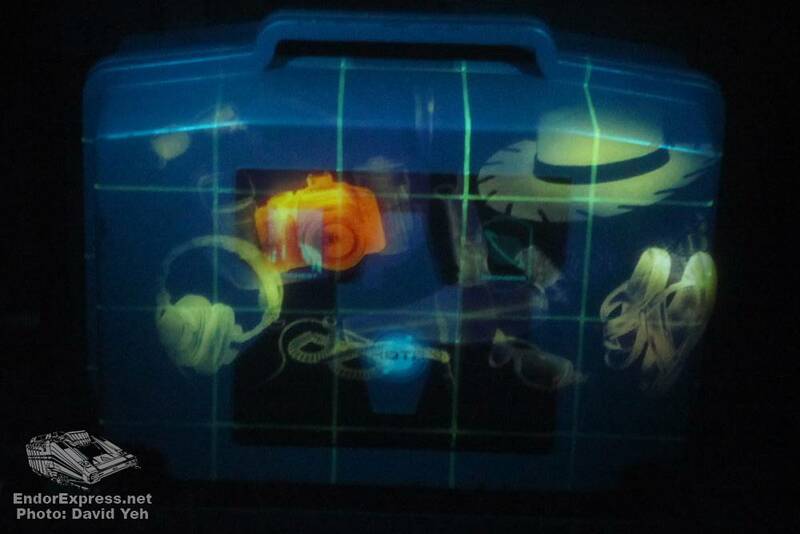 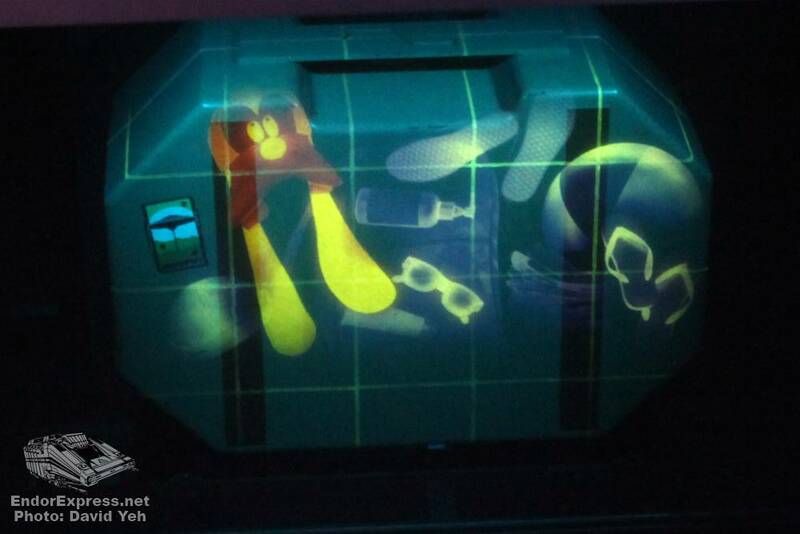 The first, G2-9T can be found busy scanning luggage. 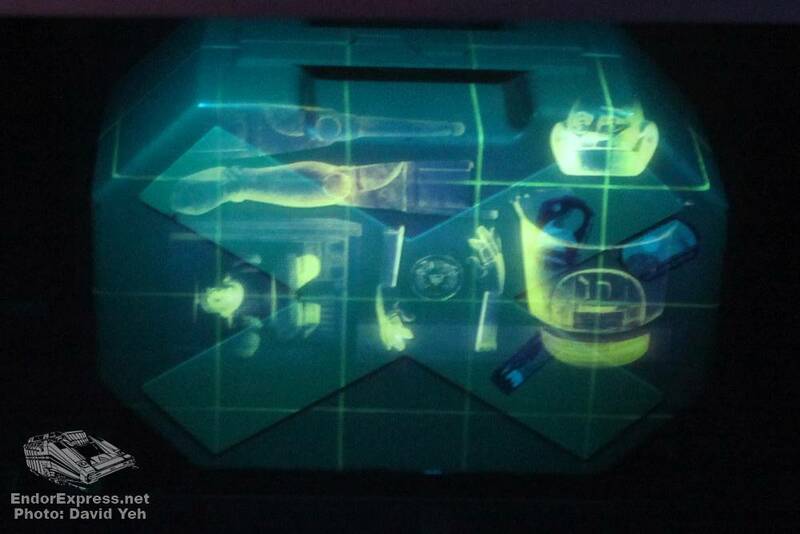 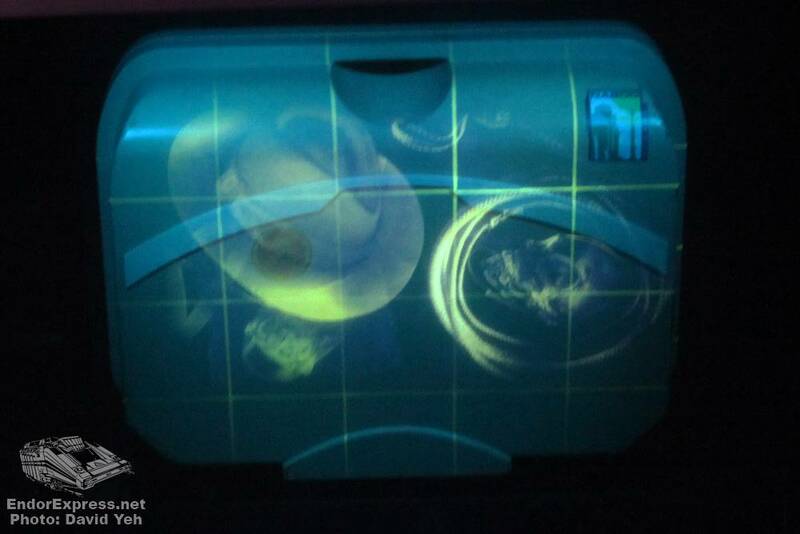 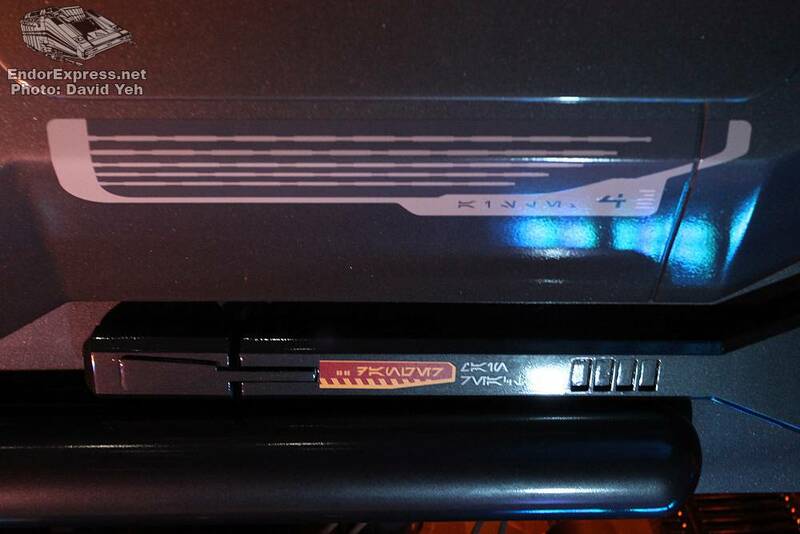 Hidden gags are abound in what the X-rays reveal, including such fun items as a Mickey Mouse hat with the name Luke engraved on it. 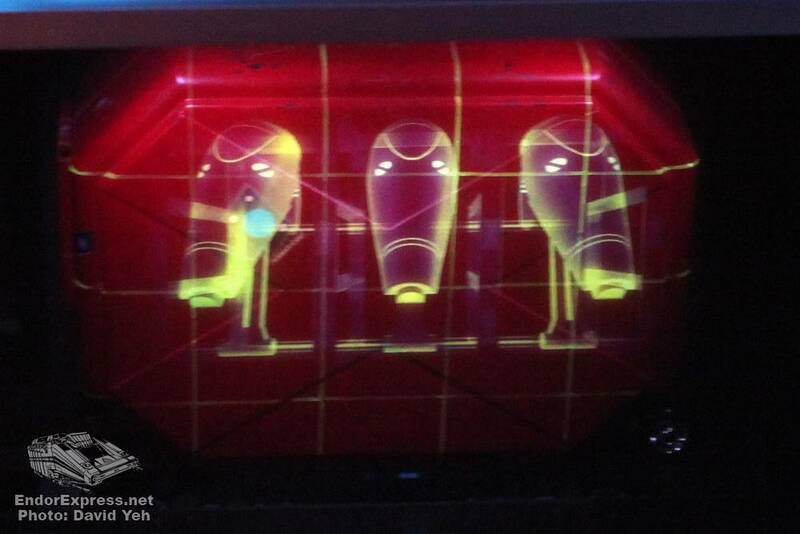 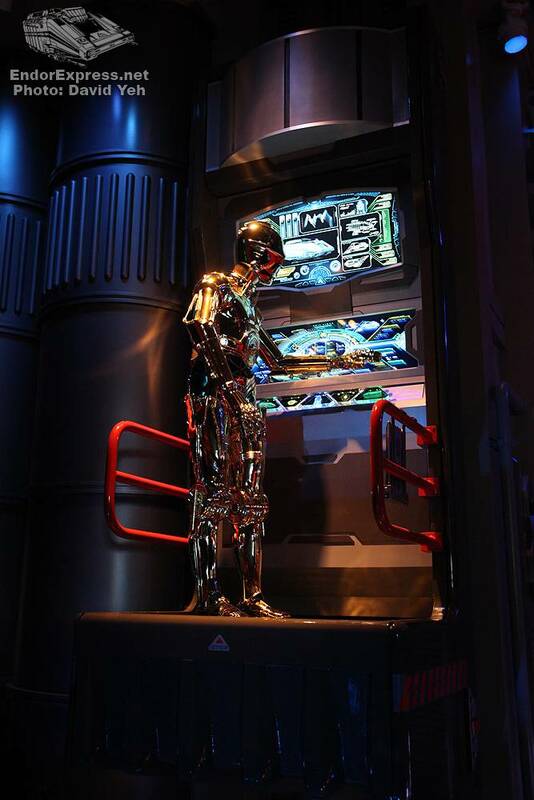 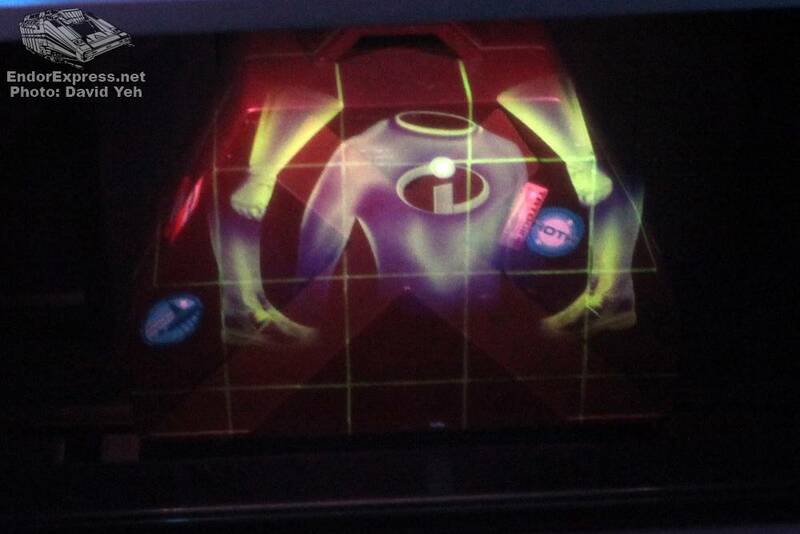 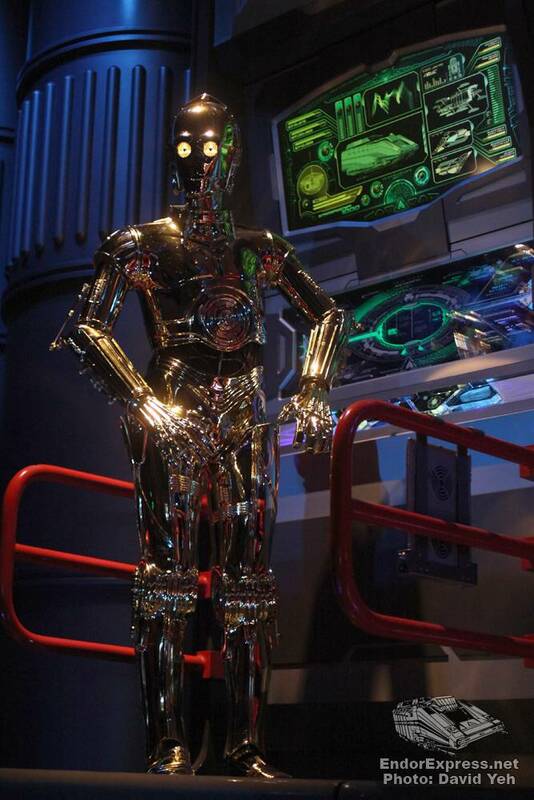 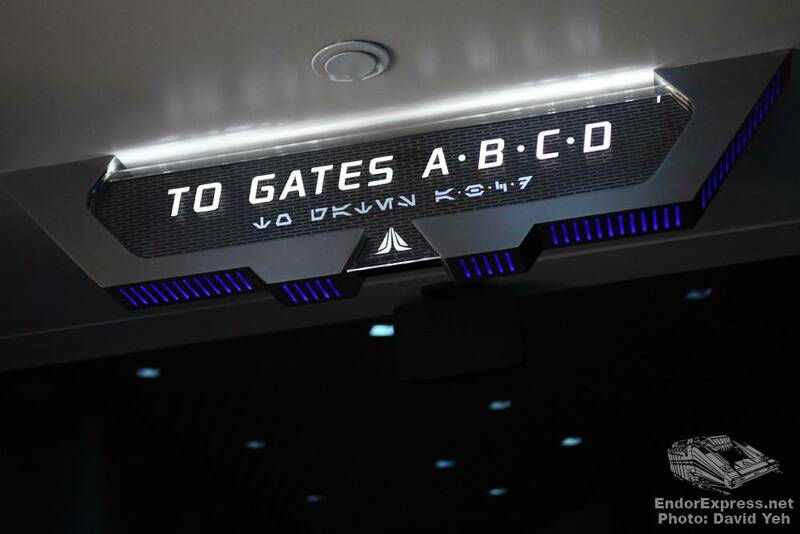 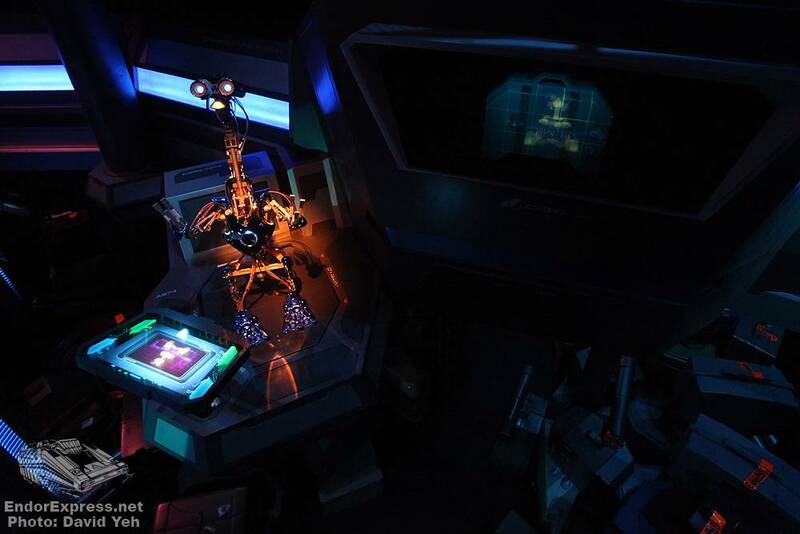 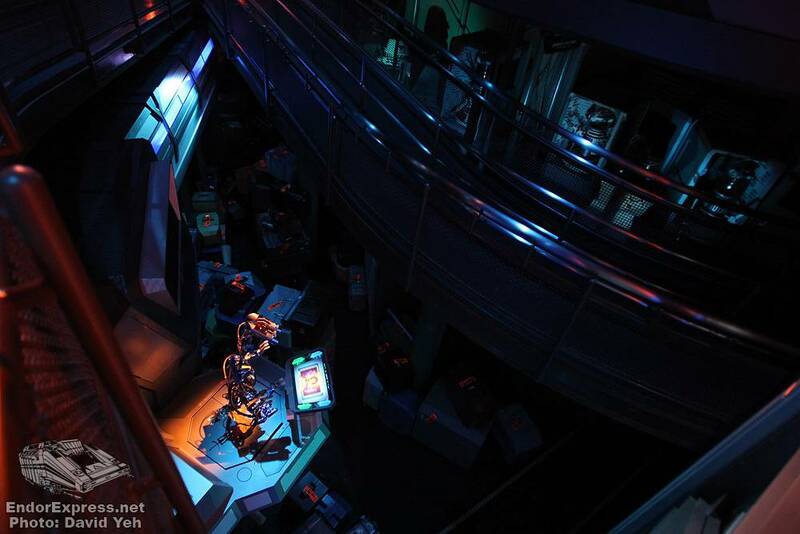 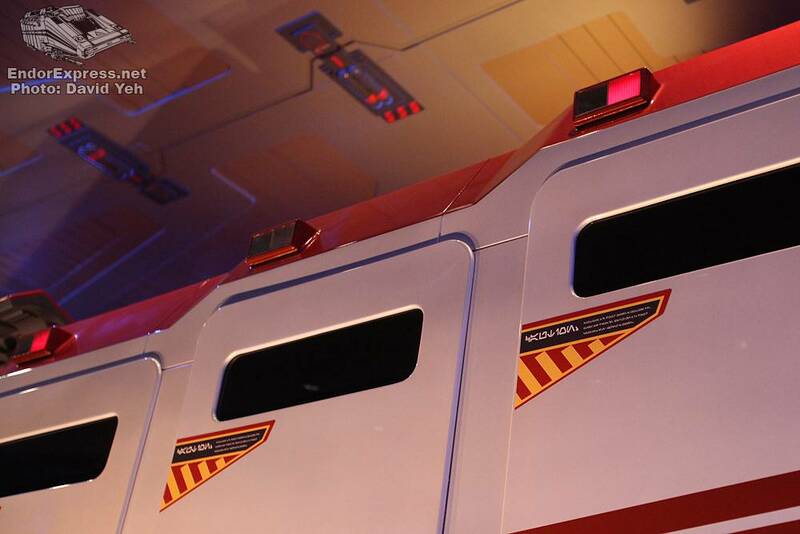 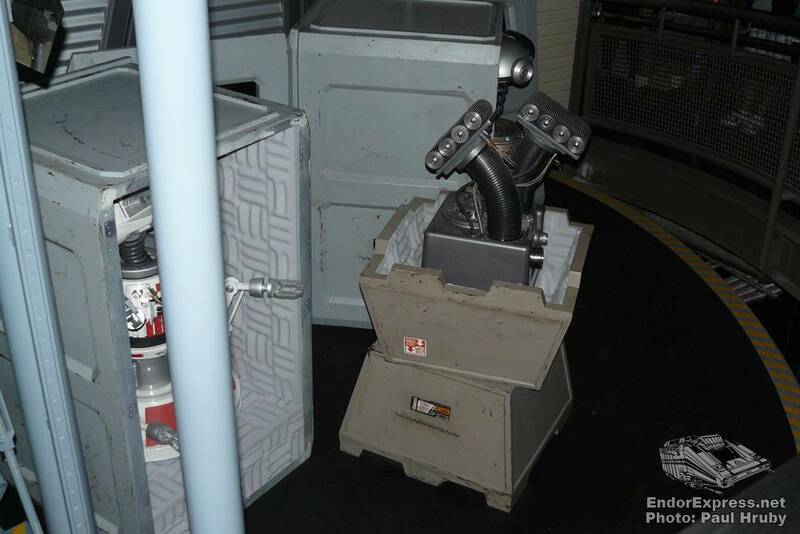 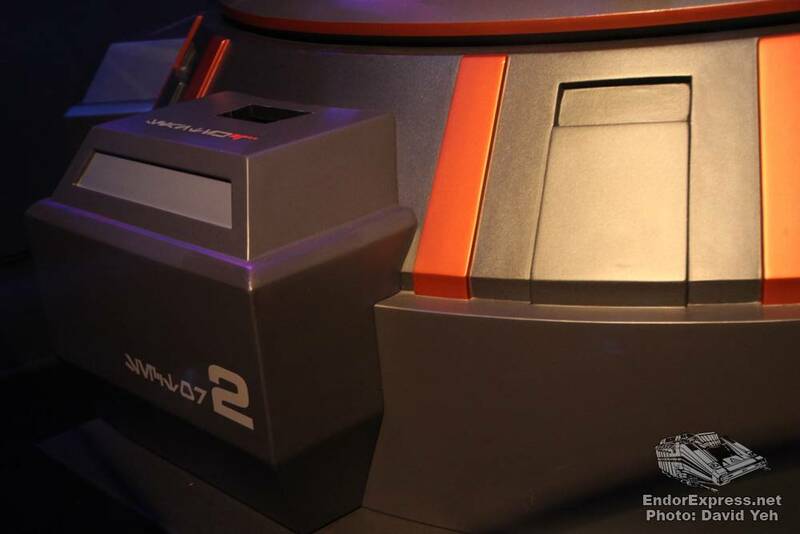 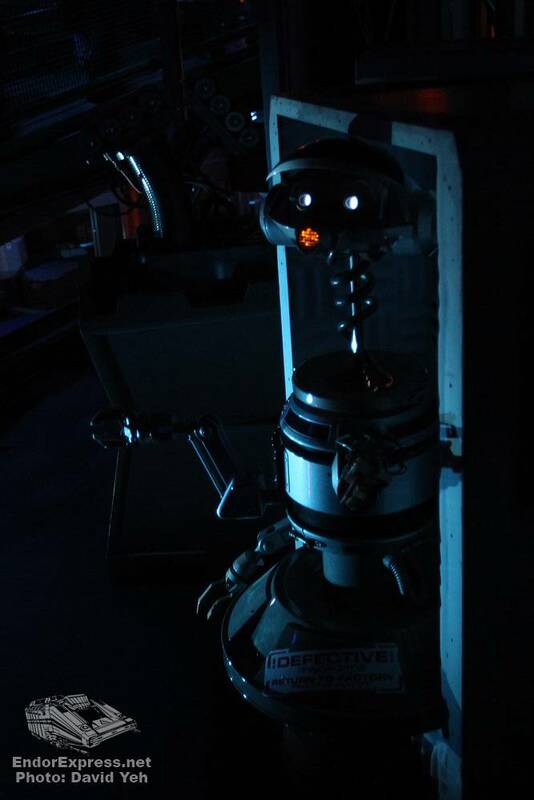 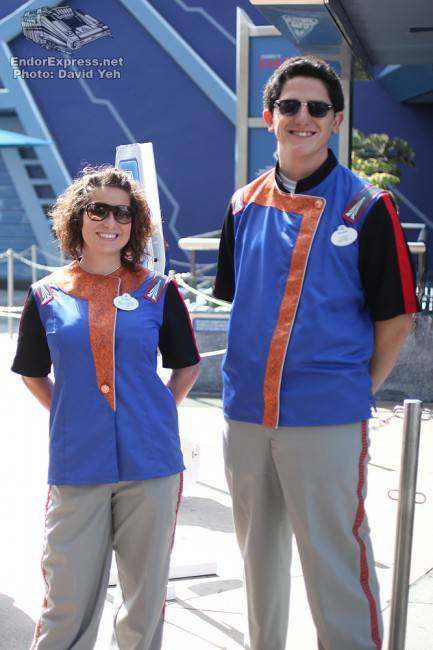 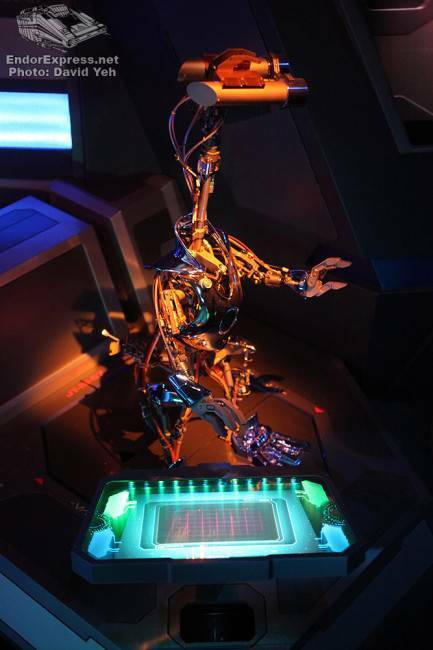 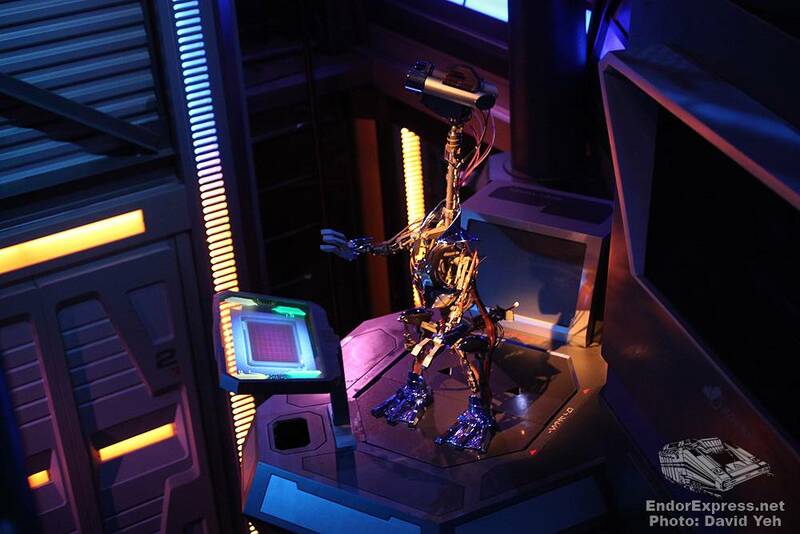 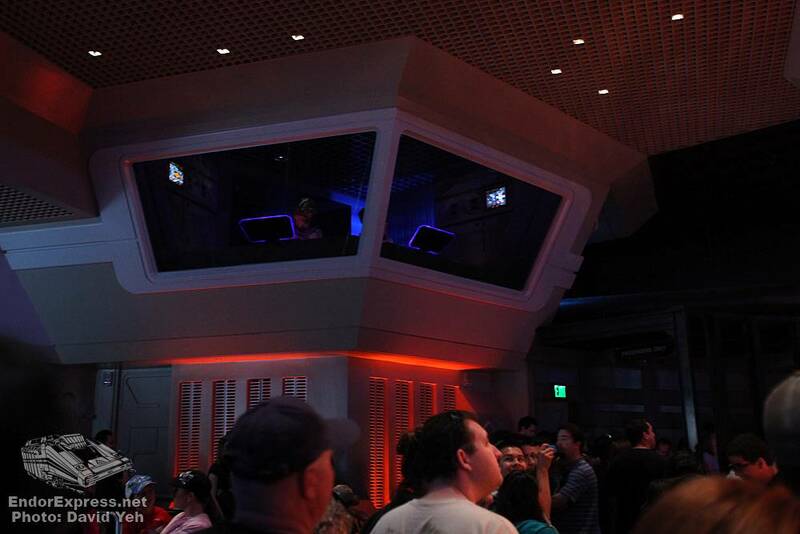 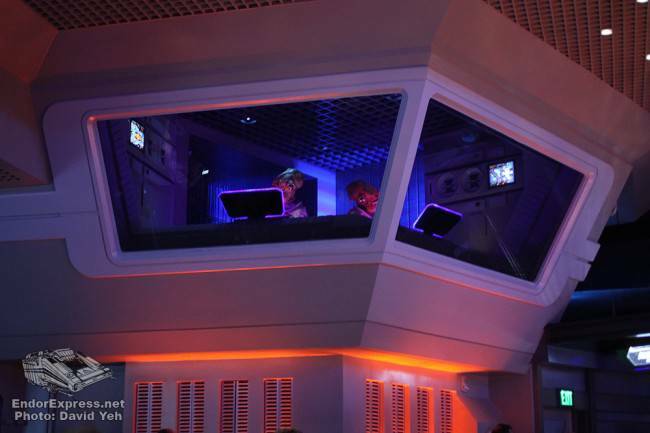 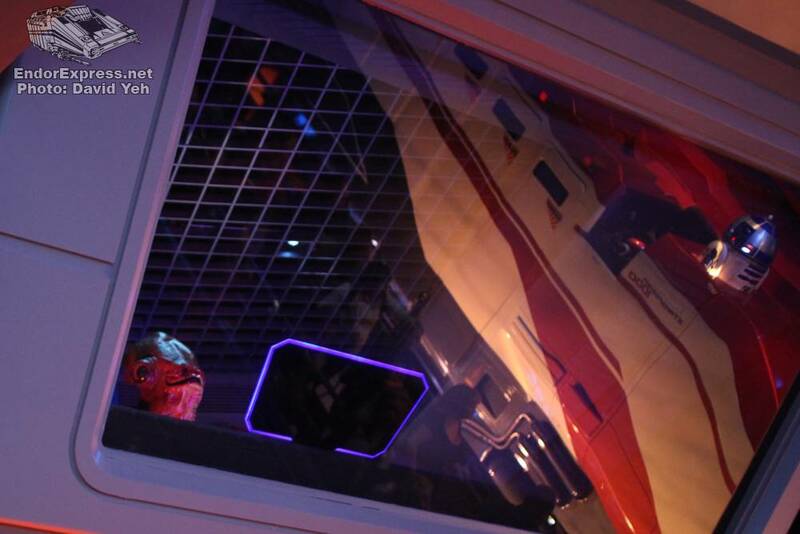 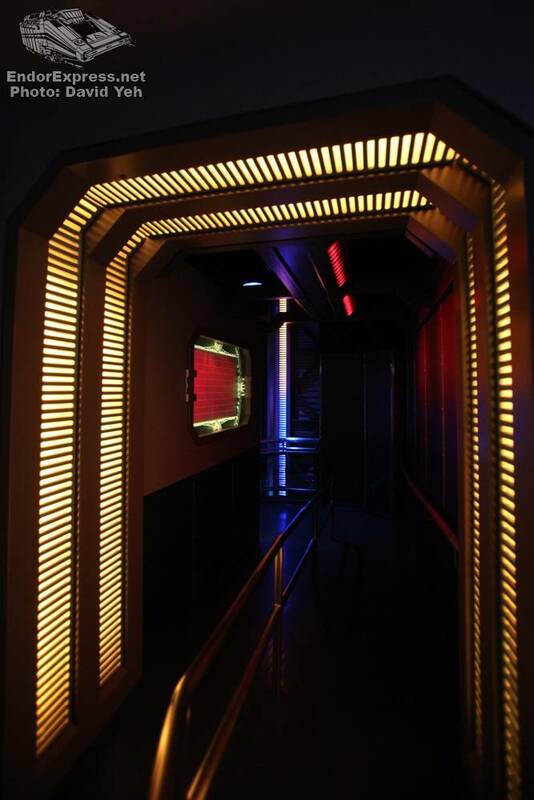 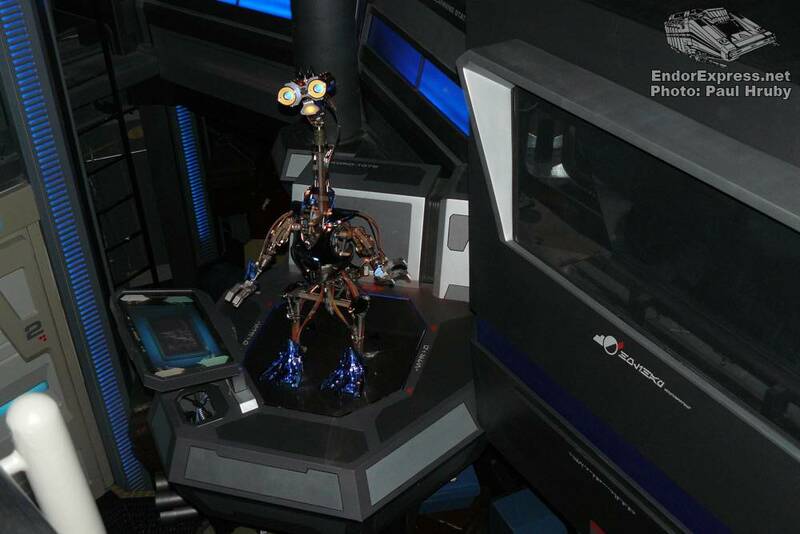 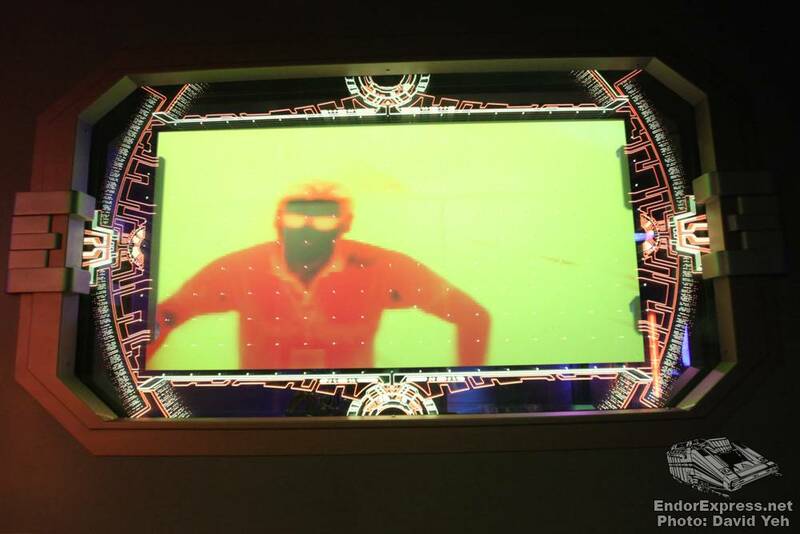 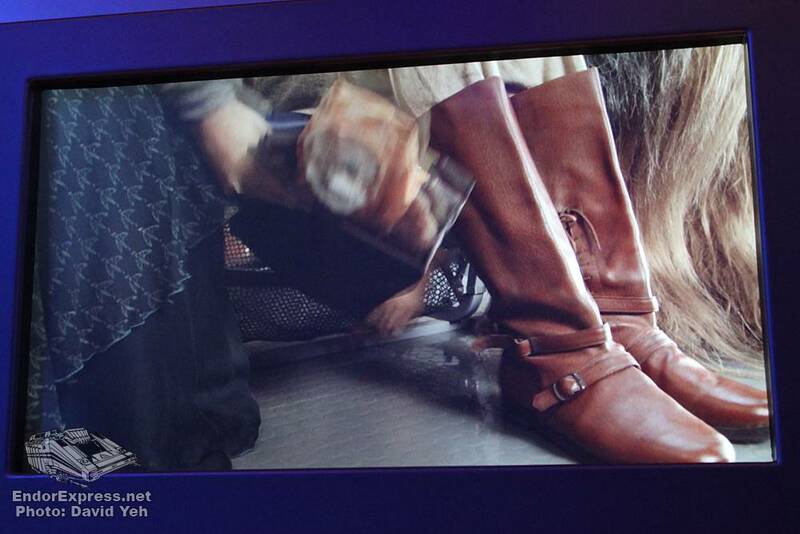 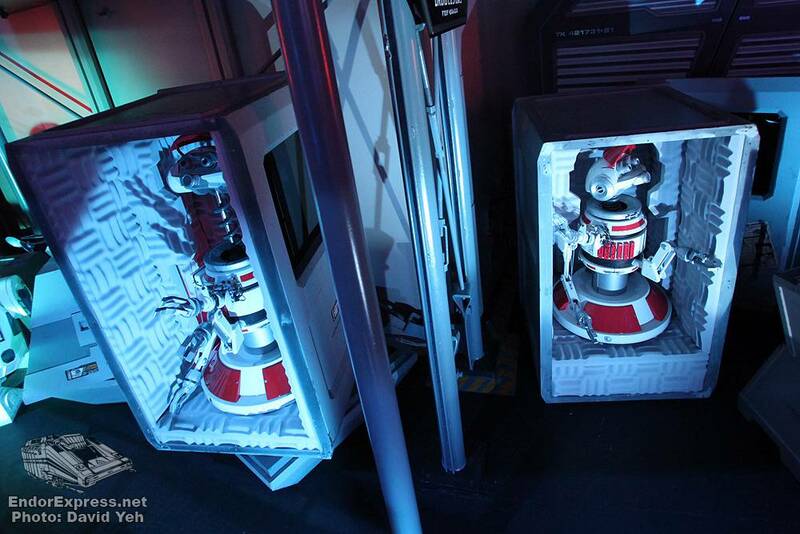 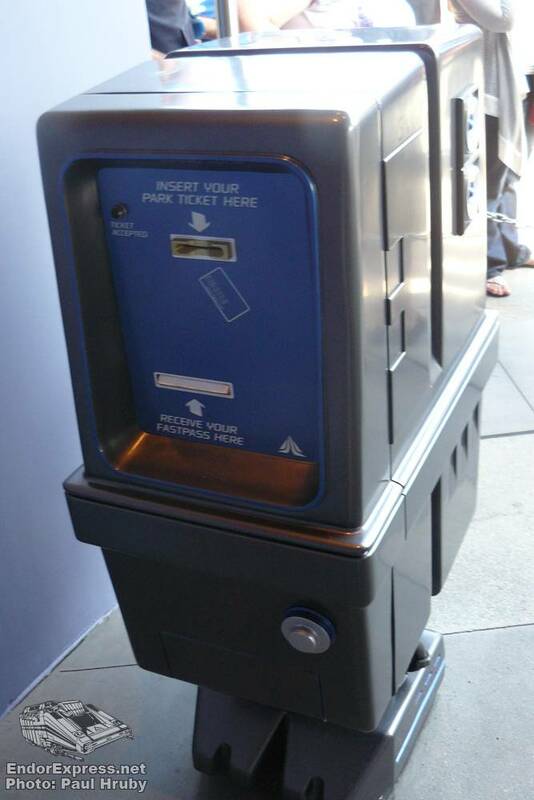 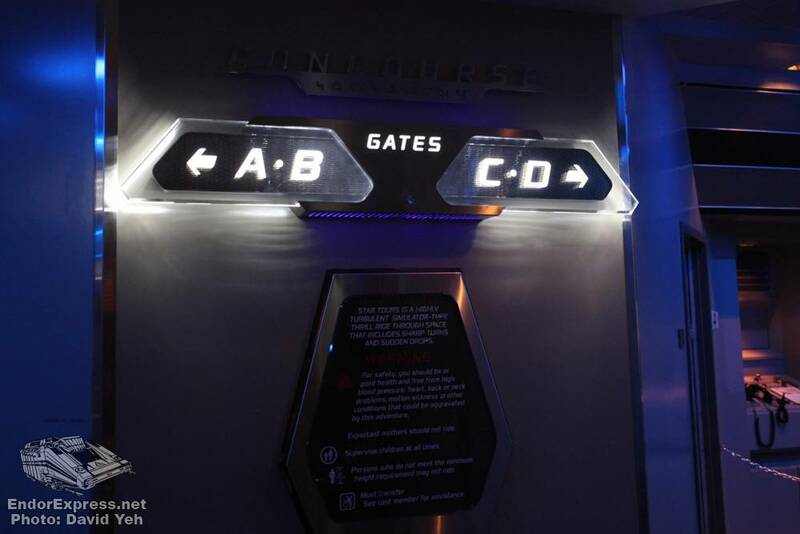 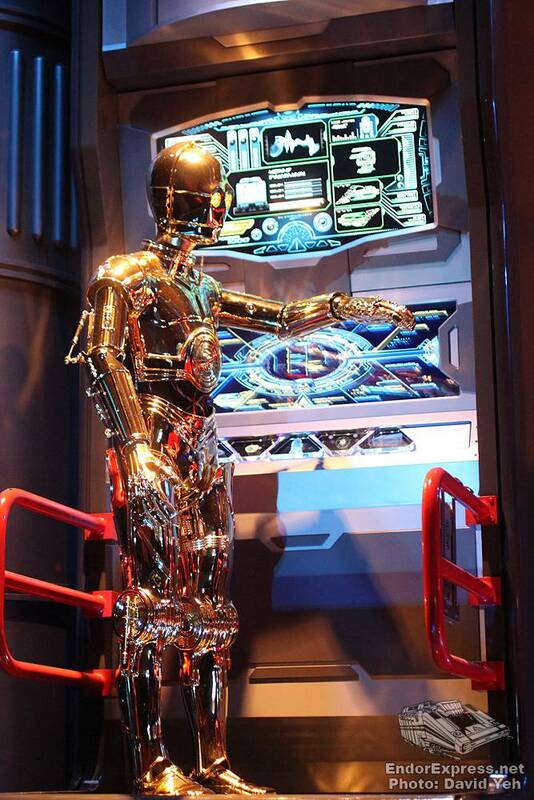 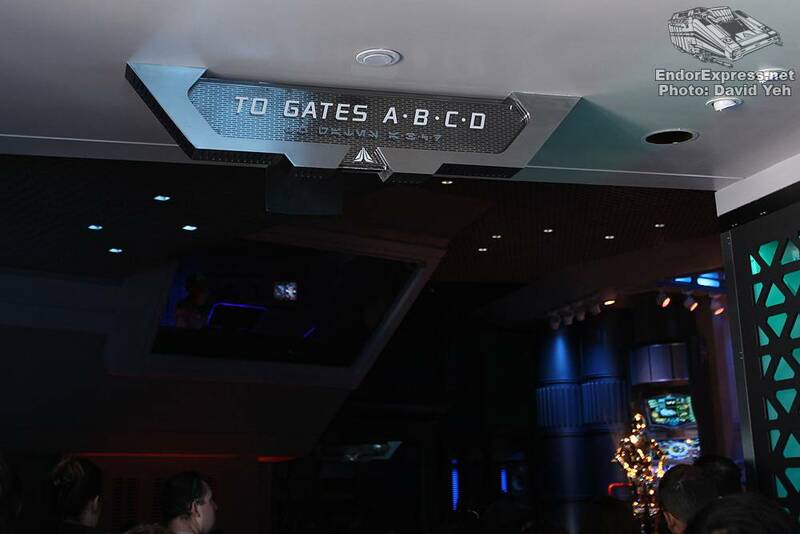 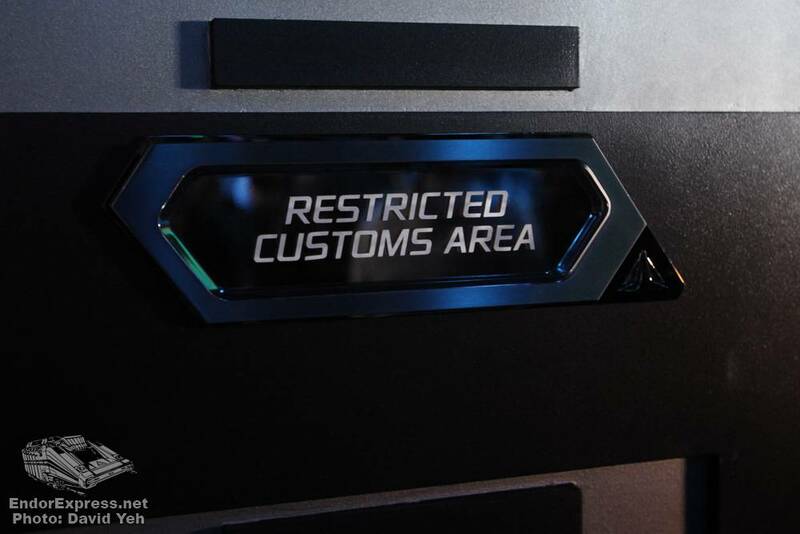 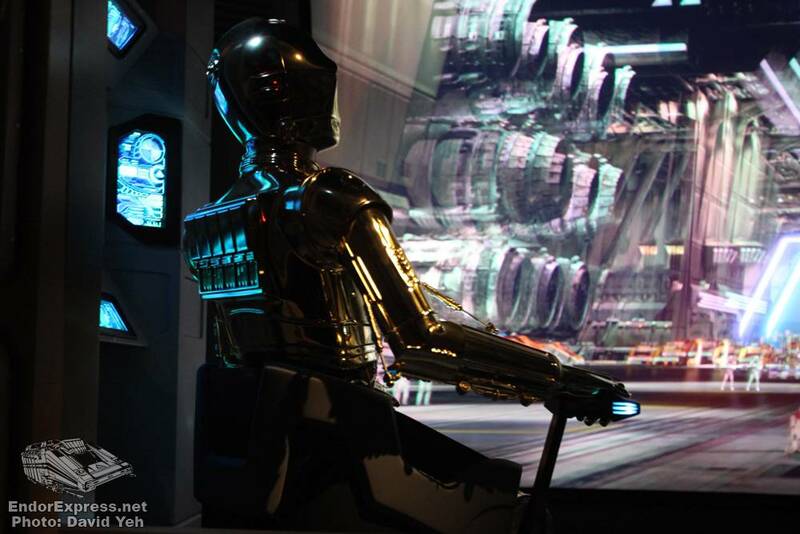 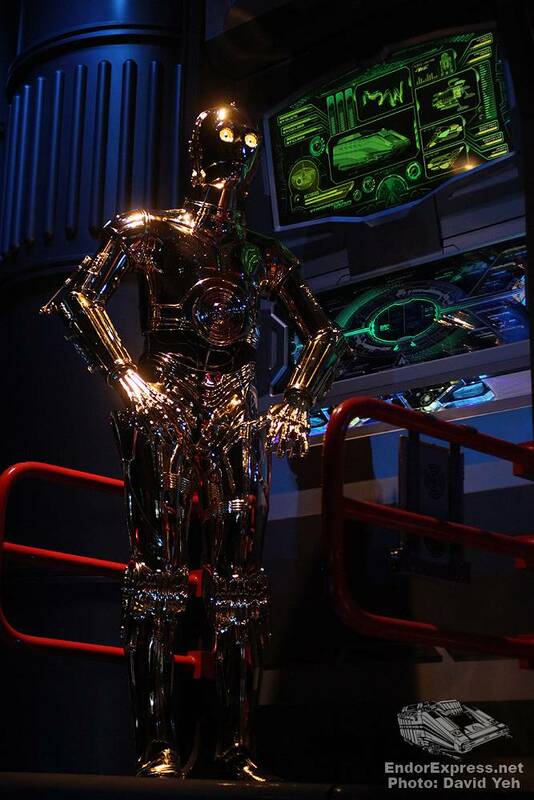 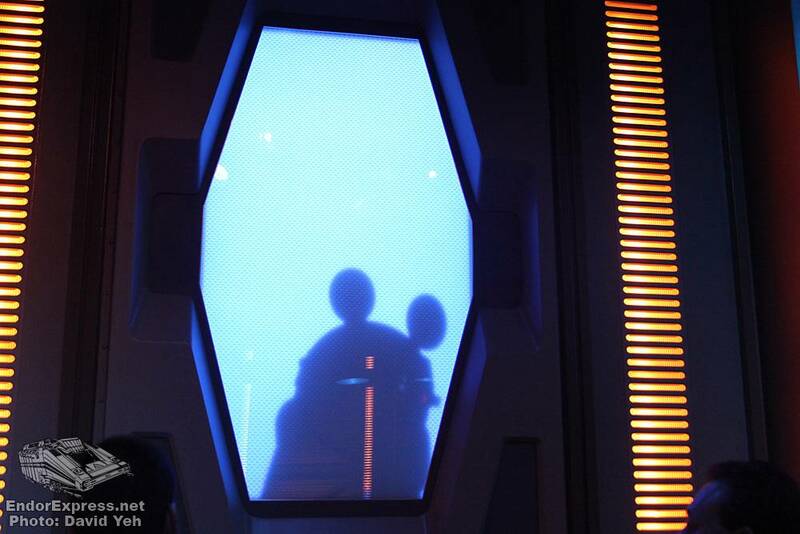 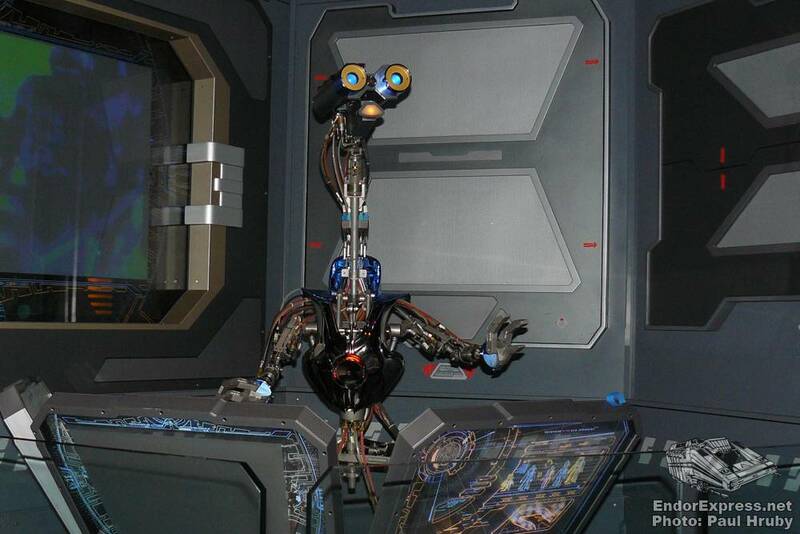 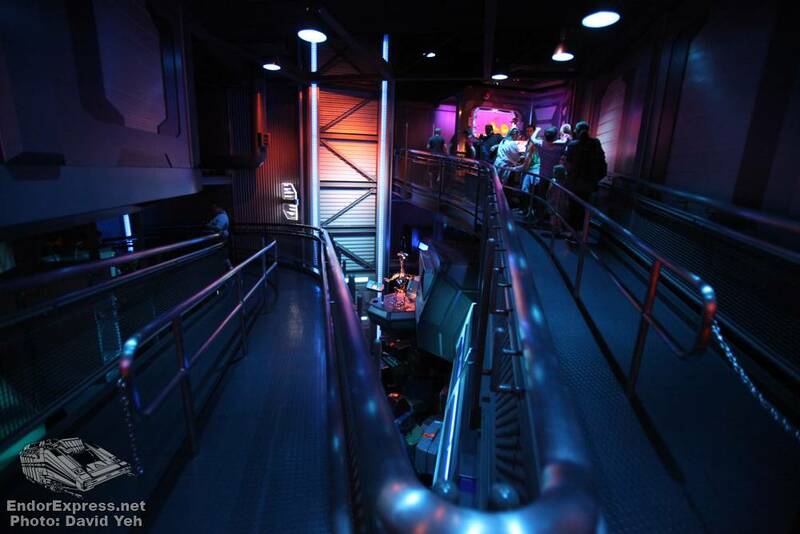 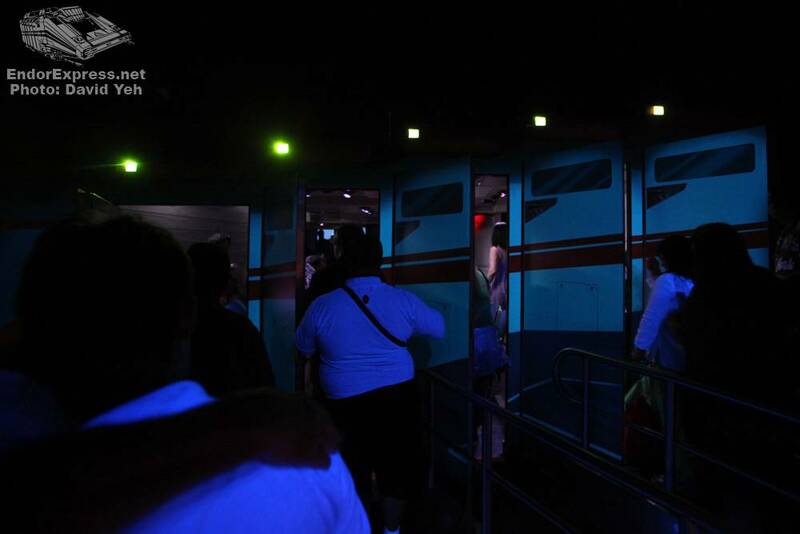 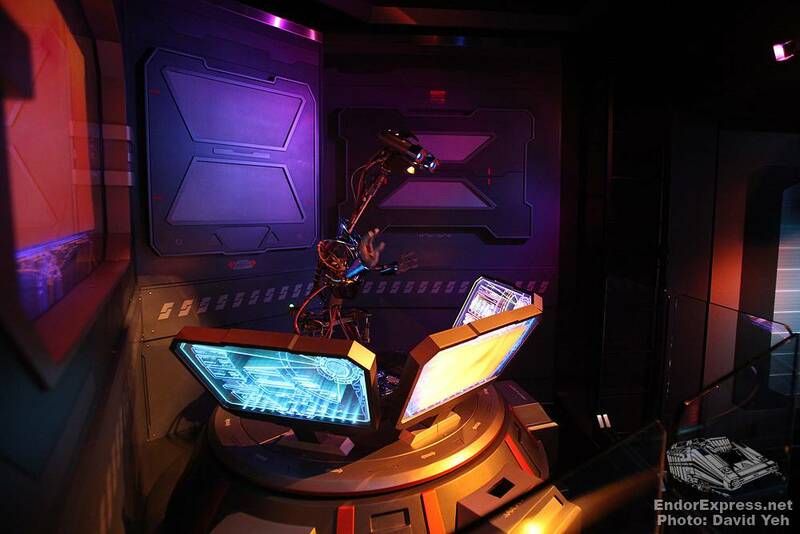 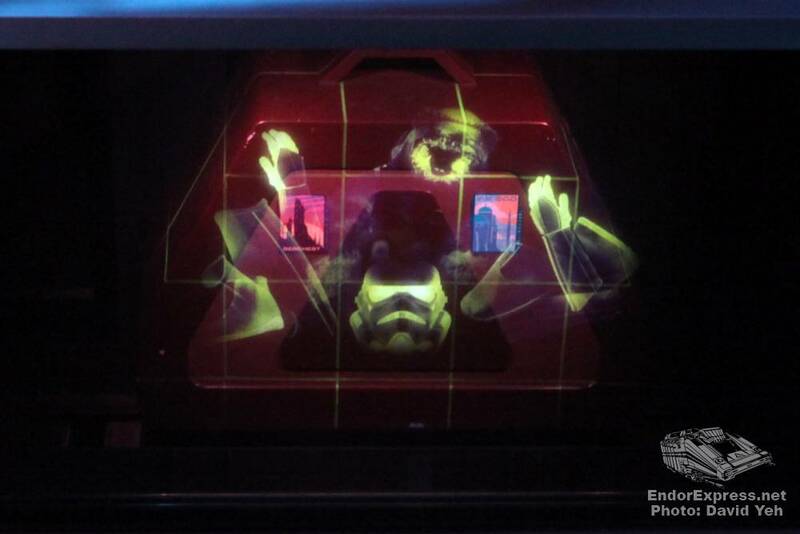 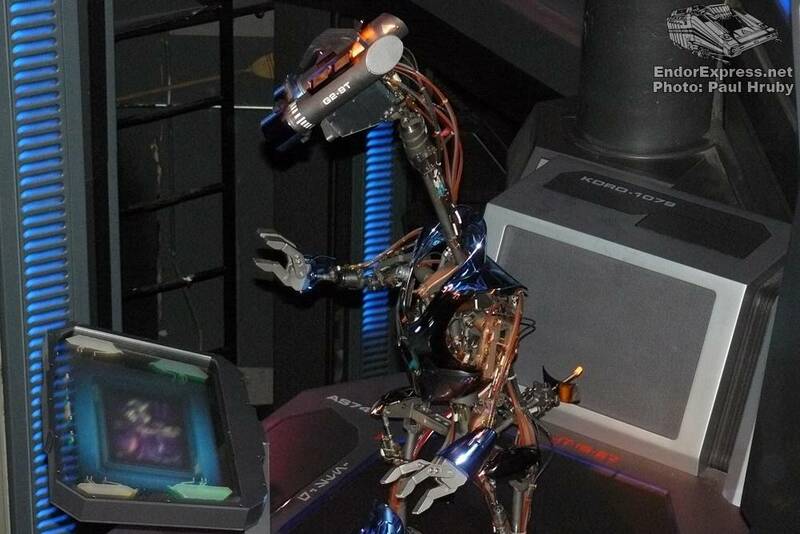 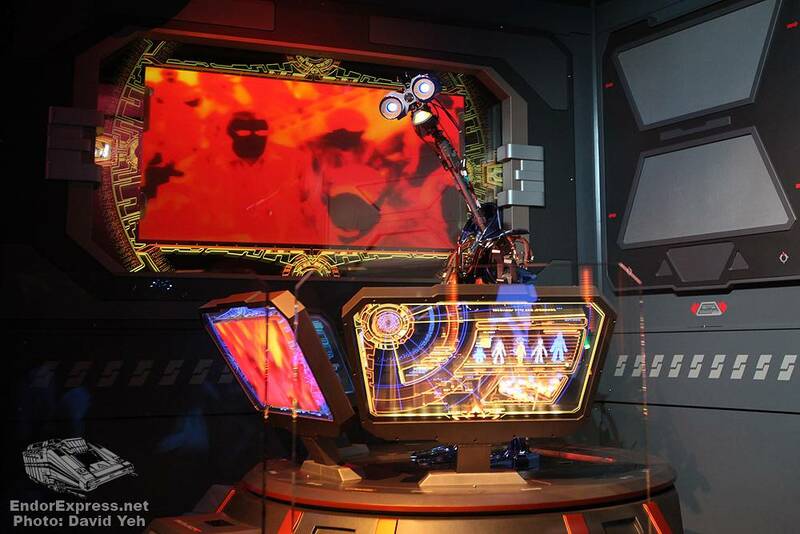 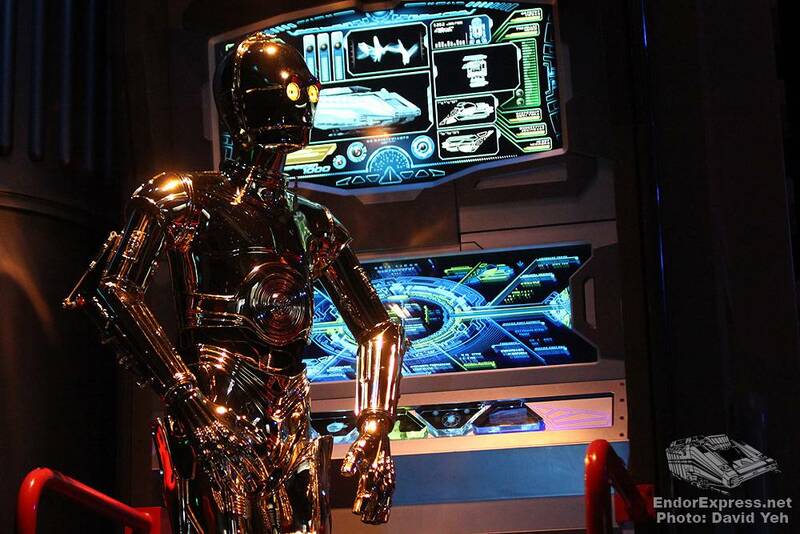 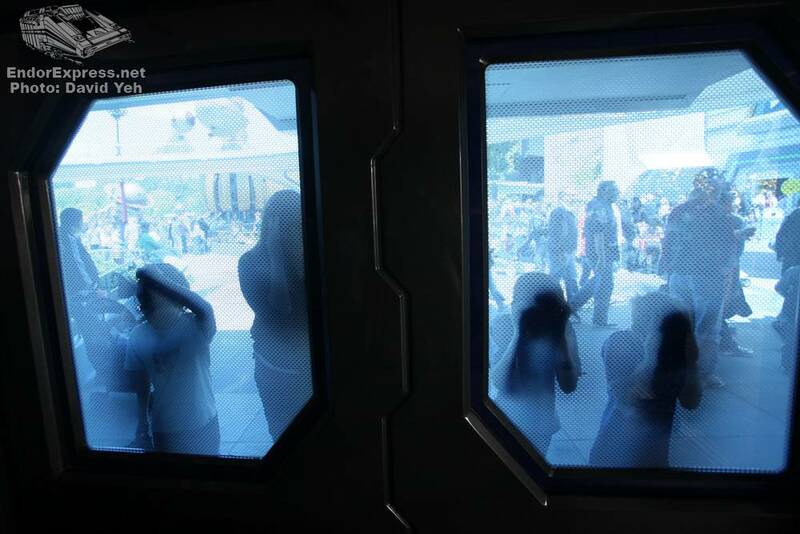 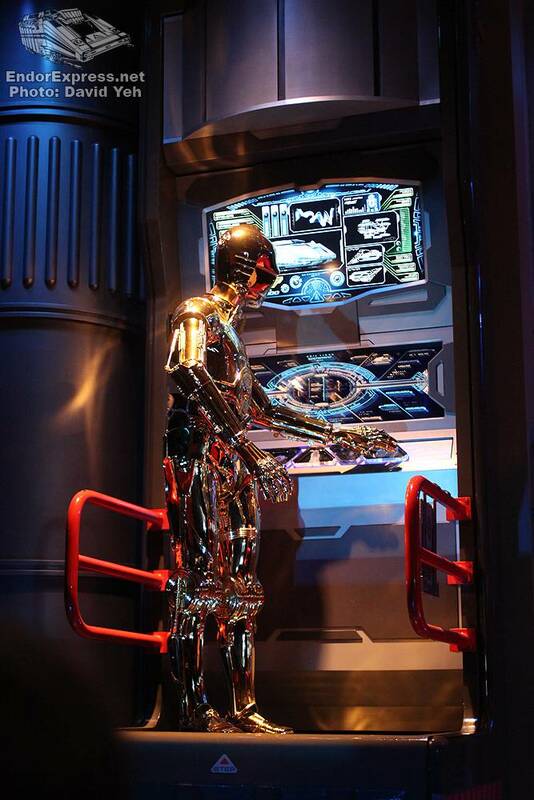 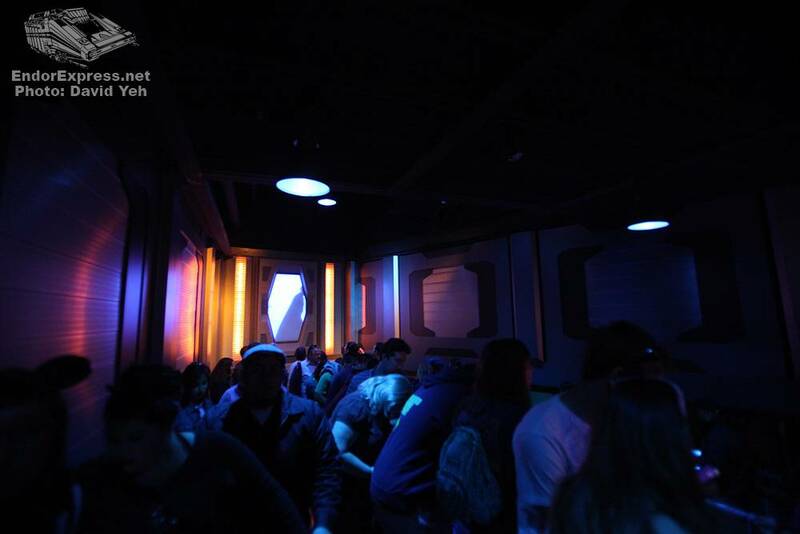 G2-4T monitors and scans all guests making sure the Star Tours terminals remain safe and secure. 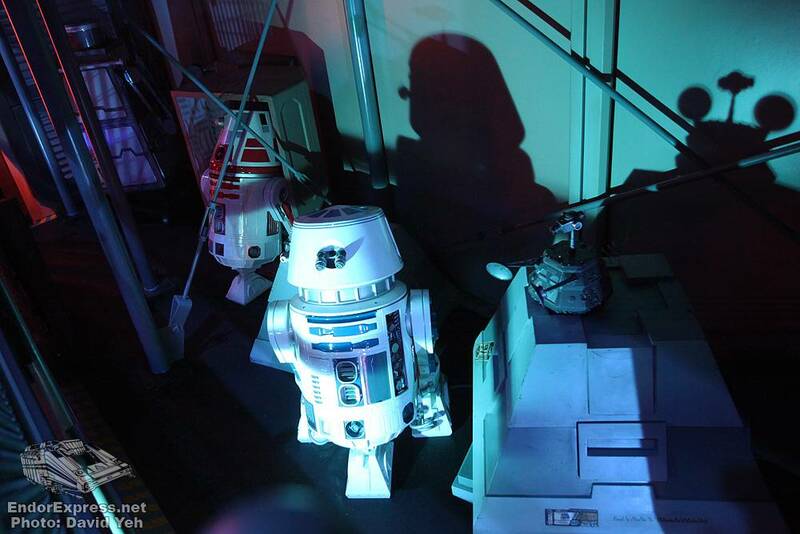 This portion of the queue is also where you’ll find three old RX-24 droids (Captain Rex) on display, clearly marked “DEFECTIVE”. 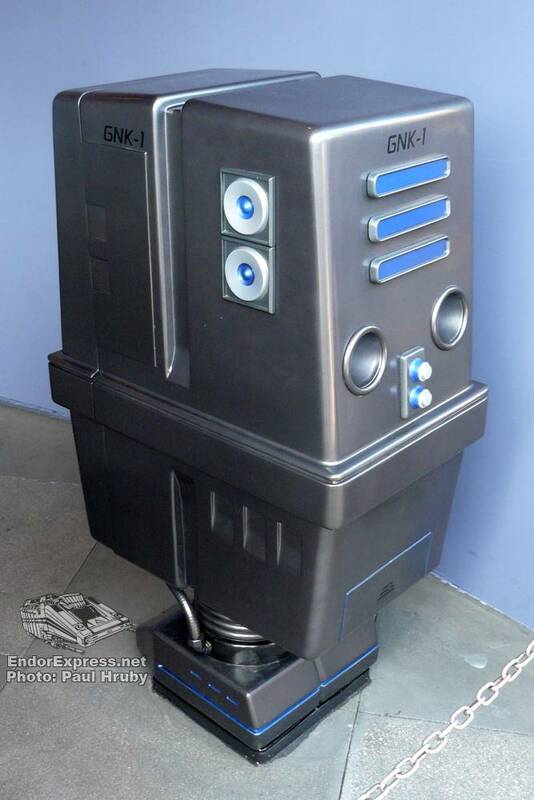 Other various astromechs and GNK droids are also present as well as a portal showing various familiar passengers walking by. 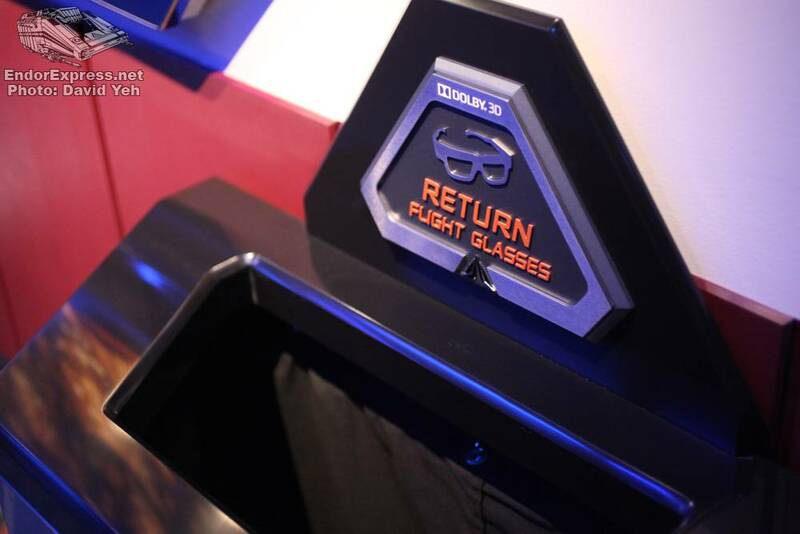 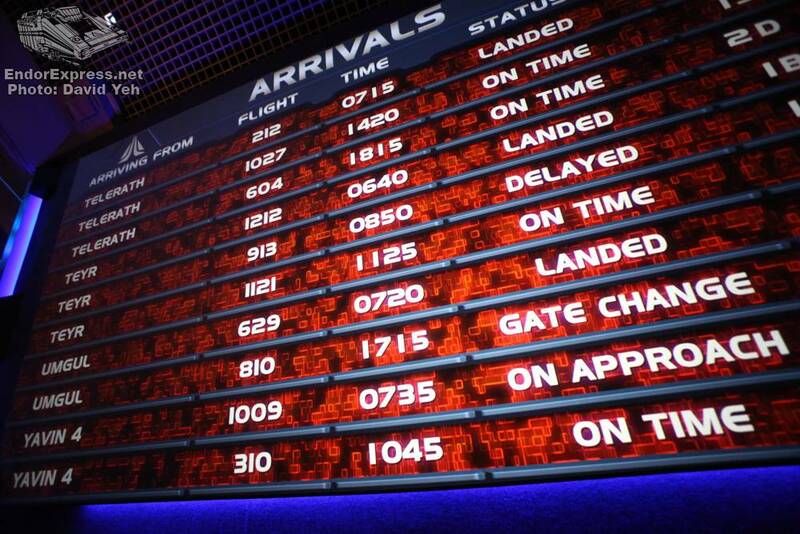 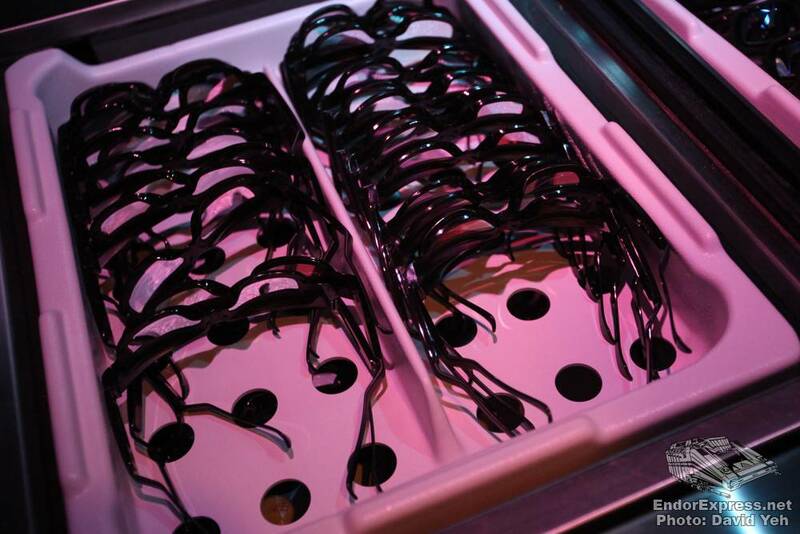 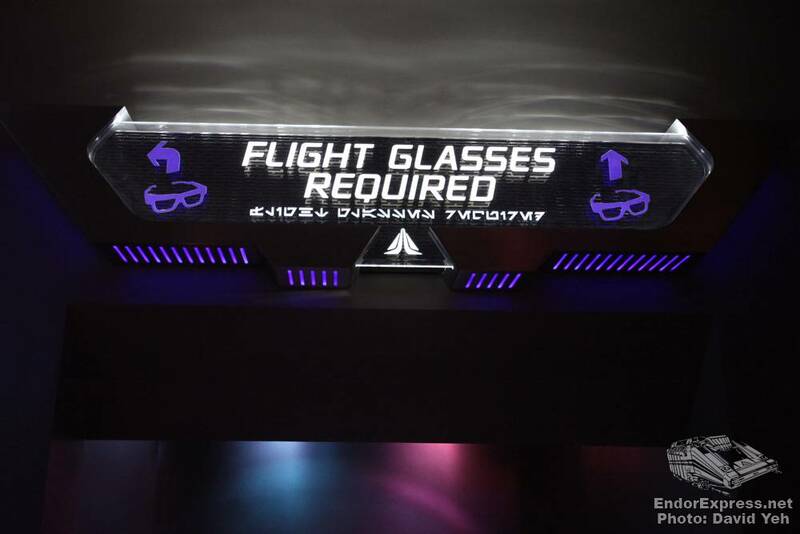 After picking up your flight glasses, you’re finally directed to your gate. 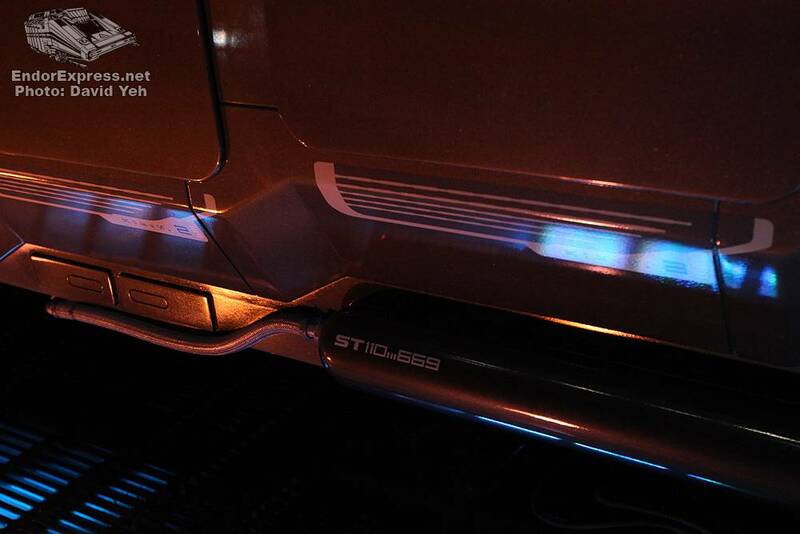 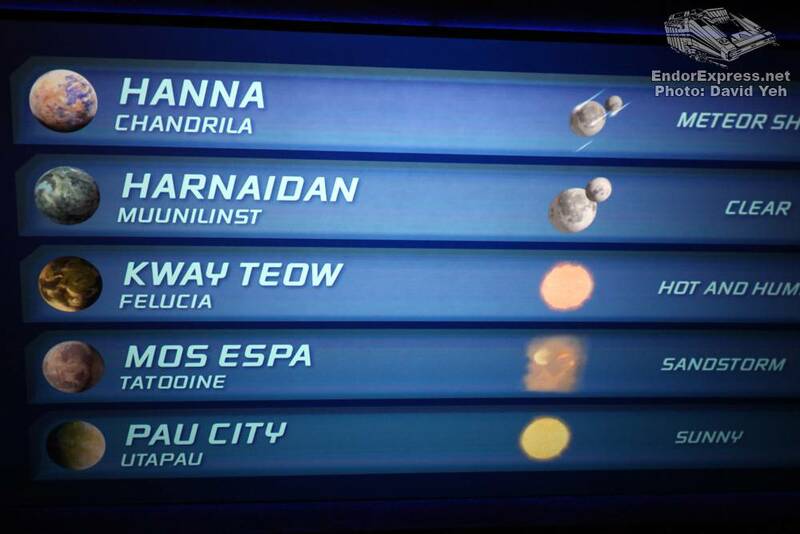 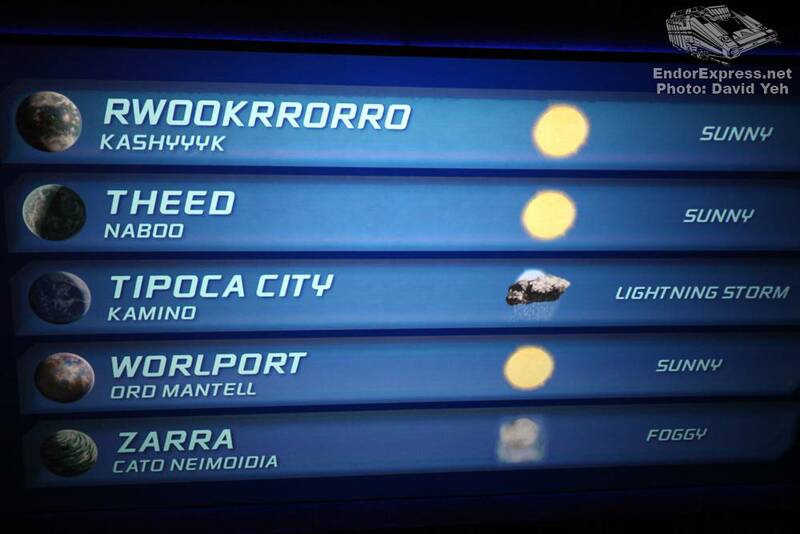 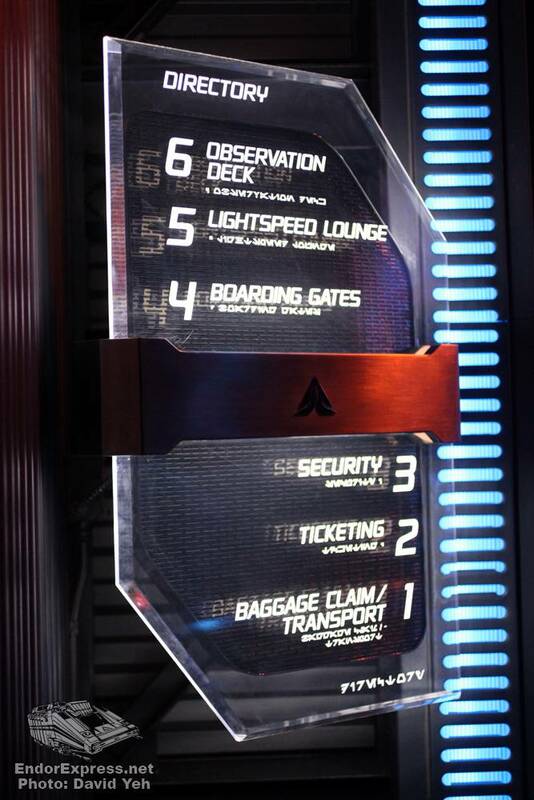 You’re welcome to view the status of your Starspeeder on the overhead displays. 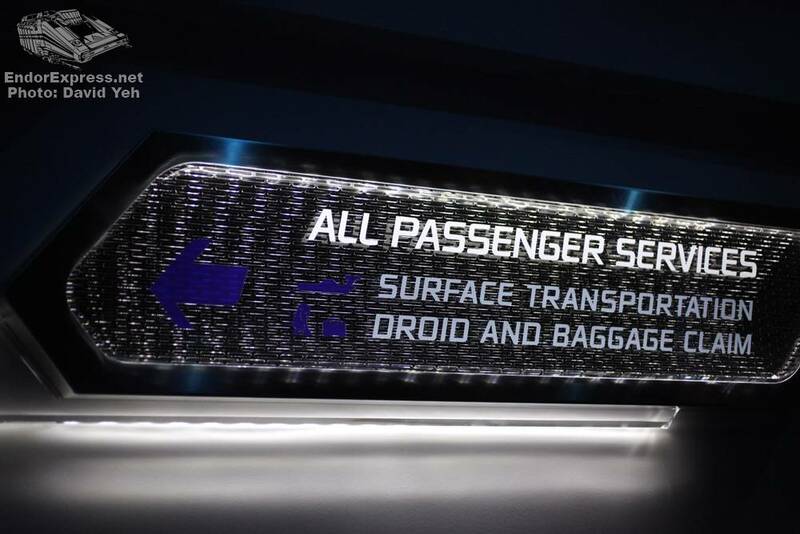 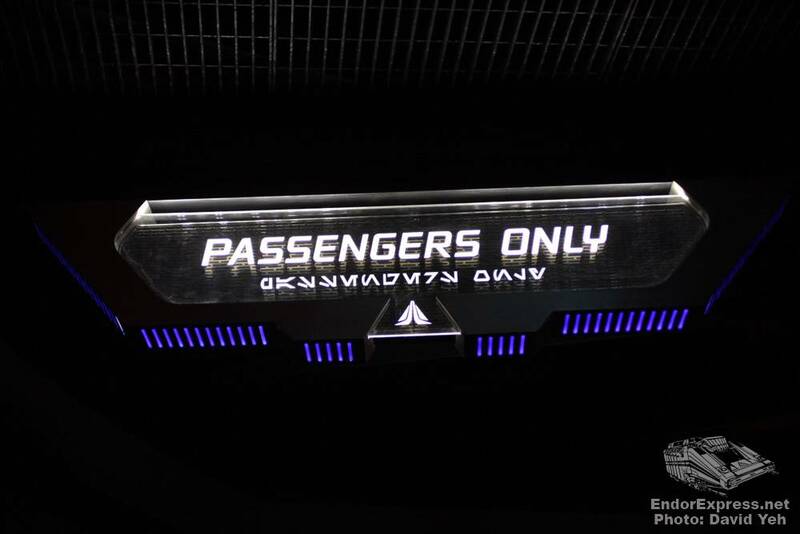 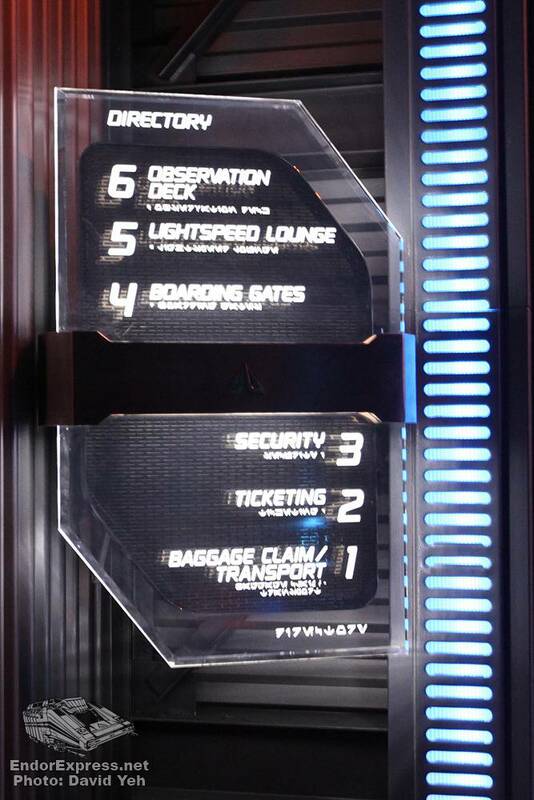 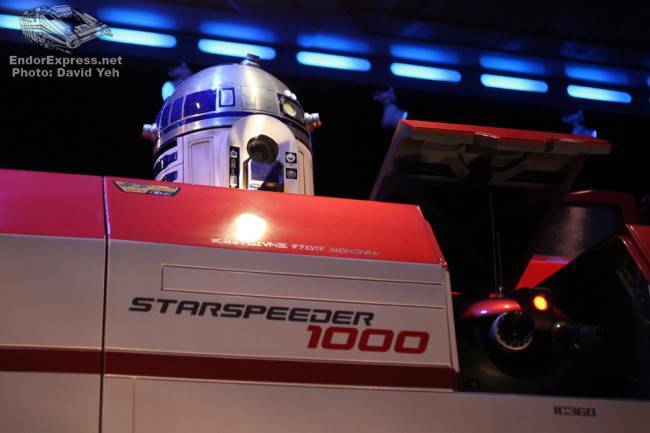 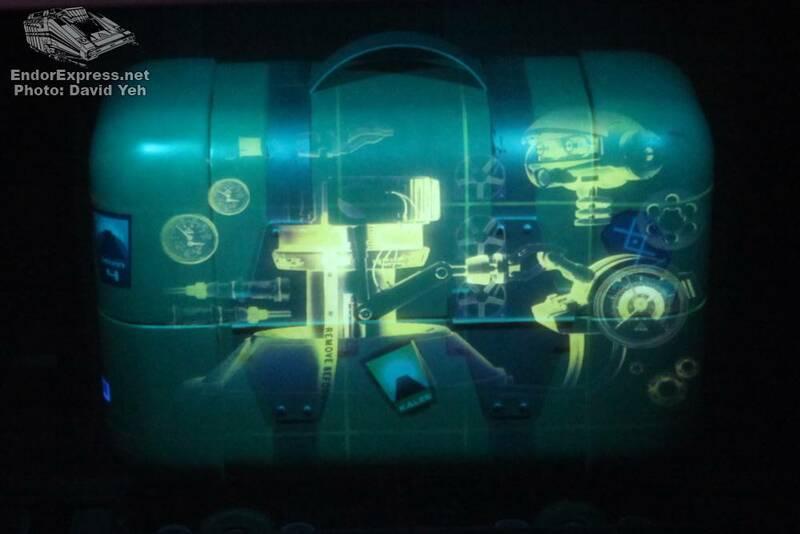 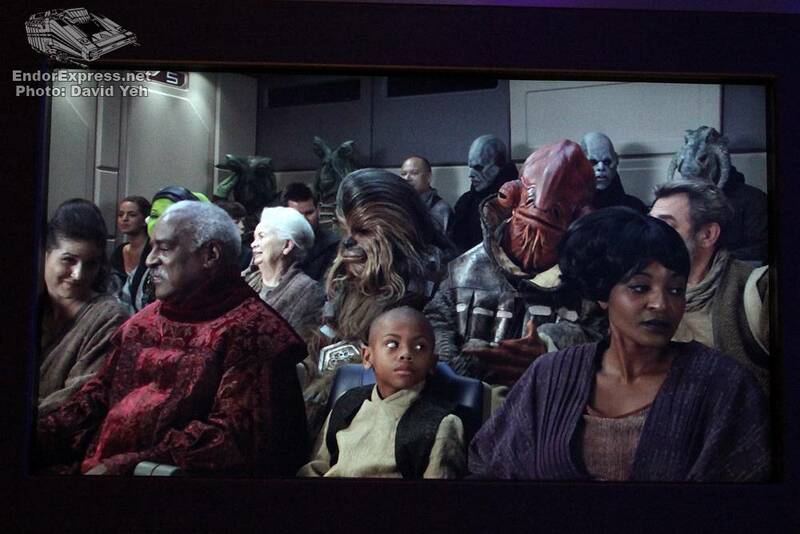 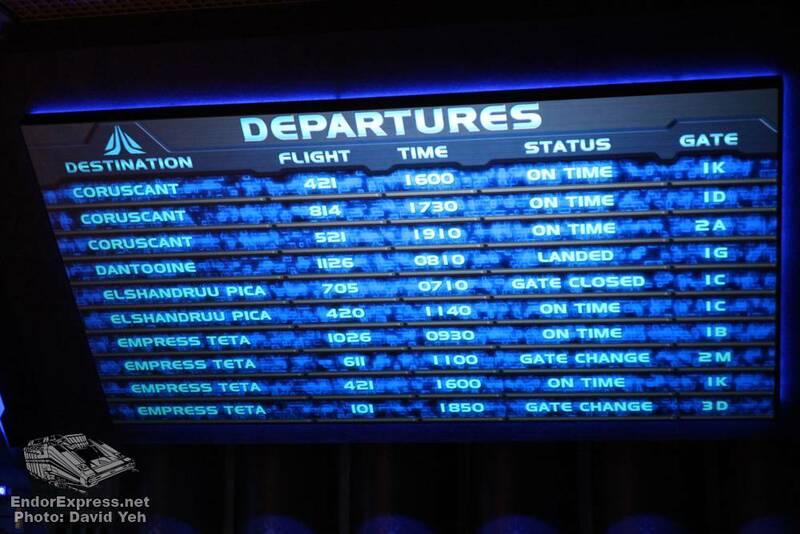 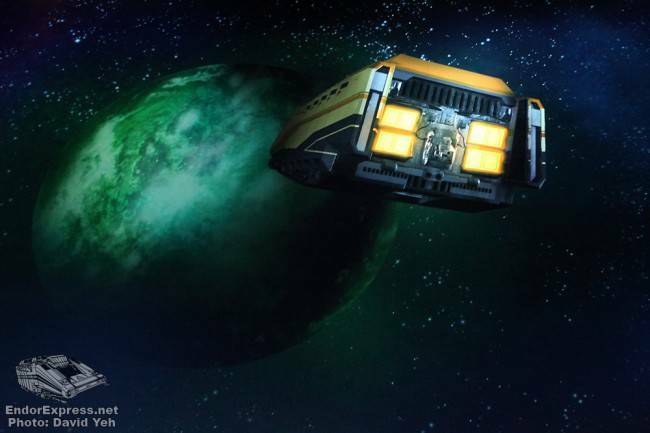 The passengers aboard the safety spiel look much more “Star Wars” (I will miss seeing the T&C Surf Design T-Shirts as well as Teek) and we learn that C-3PO is on board the speeder working out some bugs (he’s pretty good at binary). 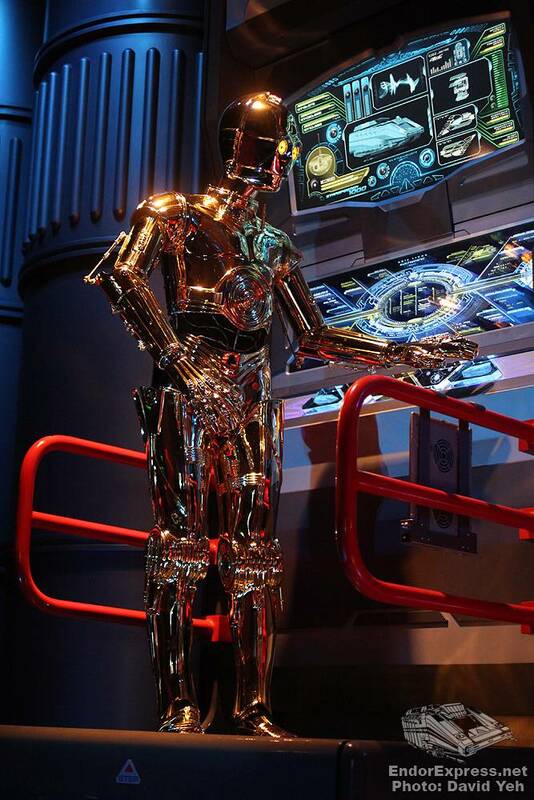 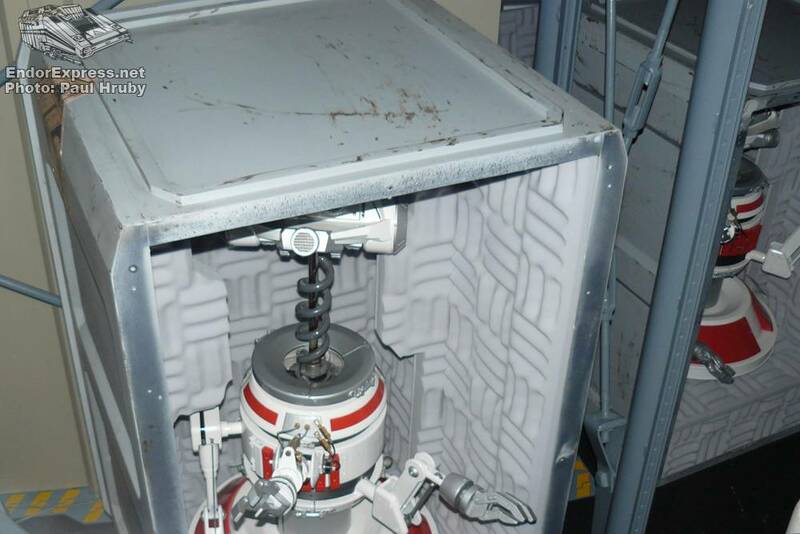 Our real pilot ACE-38 takes a breather but insists that C-3PO makes it quick as we have a flight soon. 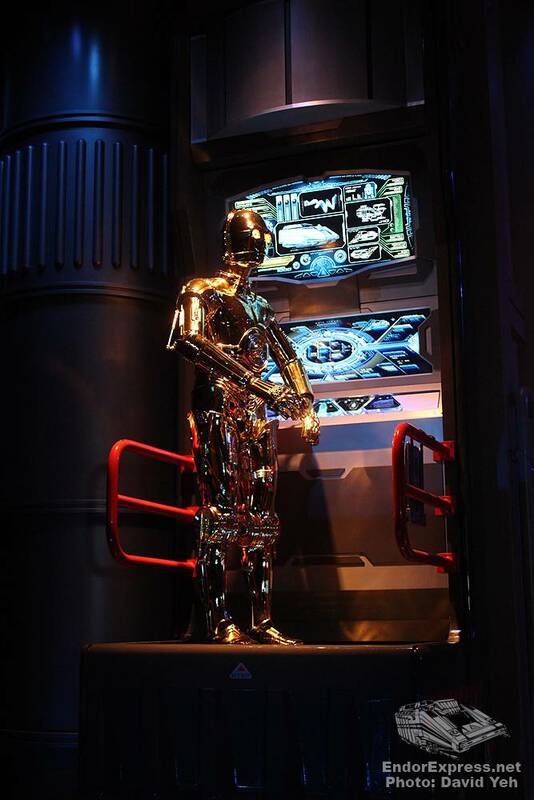 It’s time to board but when we do, C-3PO is still at work. 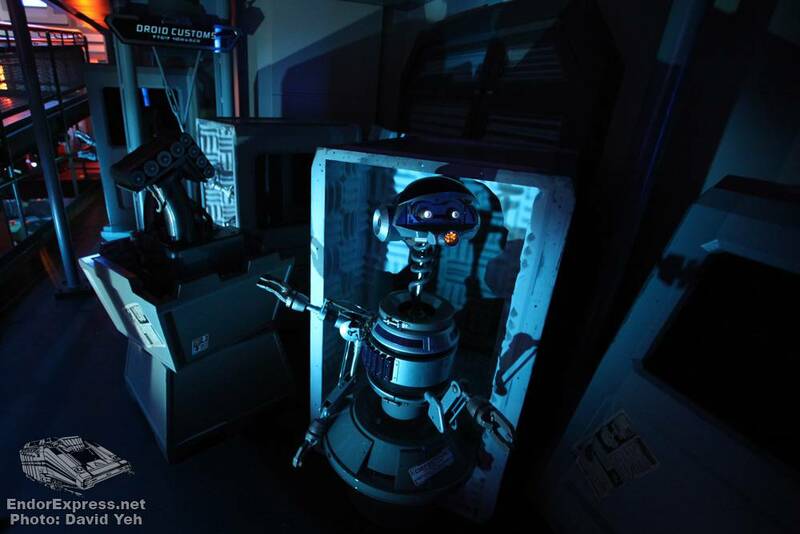 He unknowingly activates the autopilot and takes us on a grand adventure to destinations such as Tatooine, Hoth, Kashyyyk, Naboo, and many more. 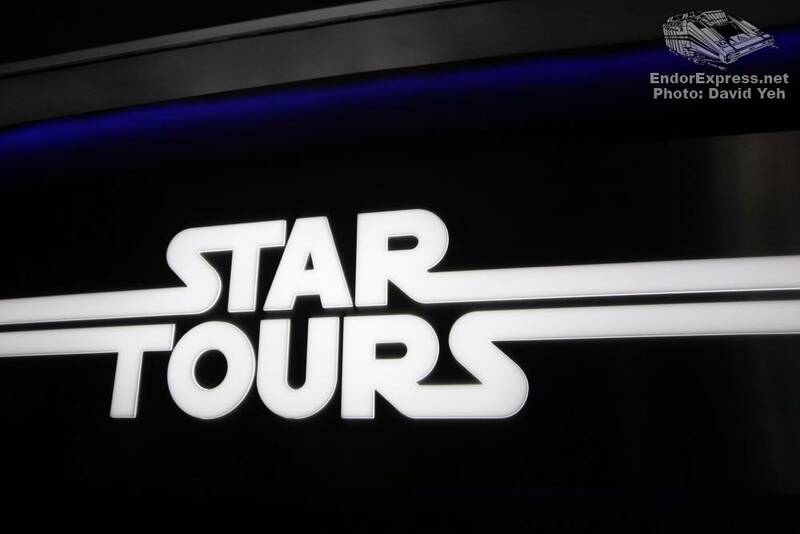 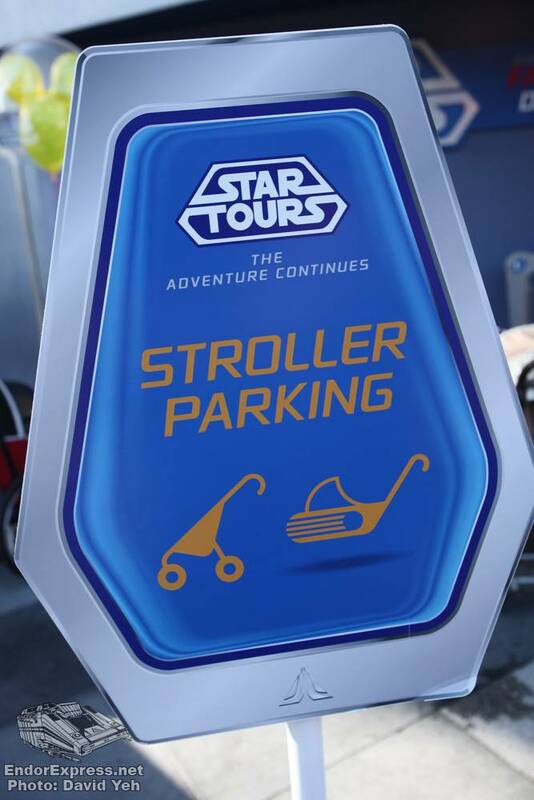 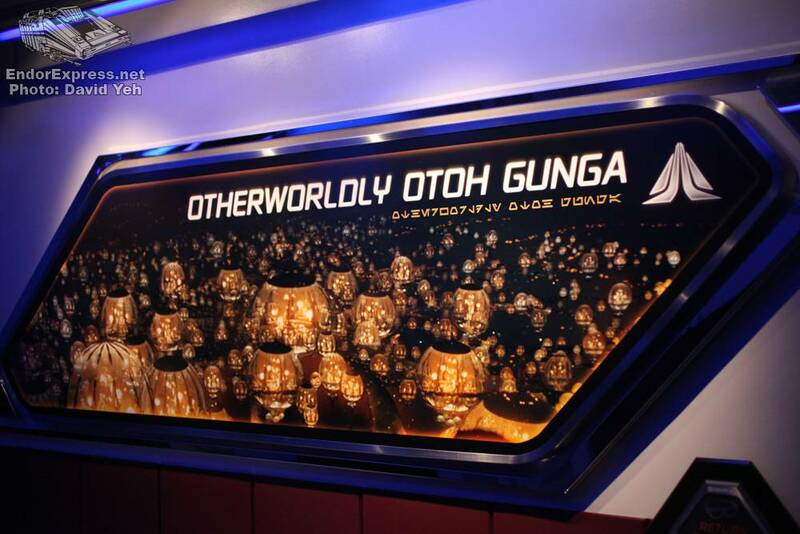 With 54 ride combinations and cameos by Admiral Ackbar, Darth Vader, Yoda, etc, this new adventure should keep guests happy for decades to come. 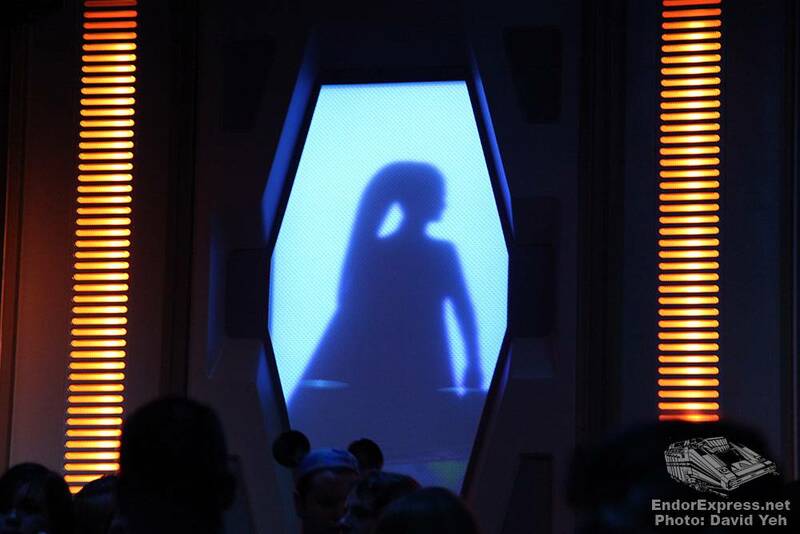 Of course there’s something about the original story that is pitch-perfect and hard to beat but the new update is certainly any Star Wars fan’s dream come true.